BEST READ IN REVERSE ORDER! The project charts and recreates the battles of Monte Cassino, fought between January 1944 to May 1944, and the onward Allied push through Northern Italy. 1iC calls in the mortars and then land near FBP, pinning them in place. Meanwhile, the rest of the shooting fails to even hit, let alone cause any damage. 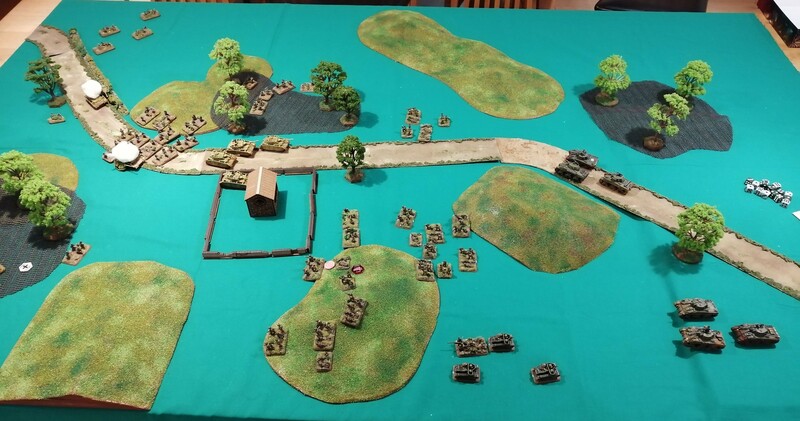 BPP are within assault range of the German MG2 and so try to take it out. MG2 and Nest 2 get their defensive fire and cause 5 hits, killing 3 stands. The assault fails and BPP are pinned in place. FBP unpins demonstrating just how effective the Fallschirmjager are under fire, they have barely flinched during this assault. 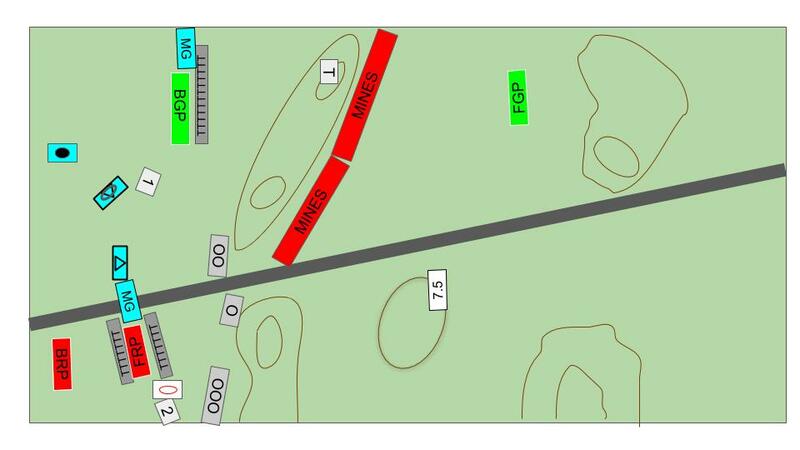 MG2 and Nest 2 continue with their hail of fire directed at BPP, cutting down another 3 stands and reducing BPP to just three teams. 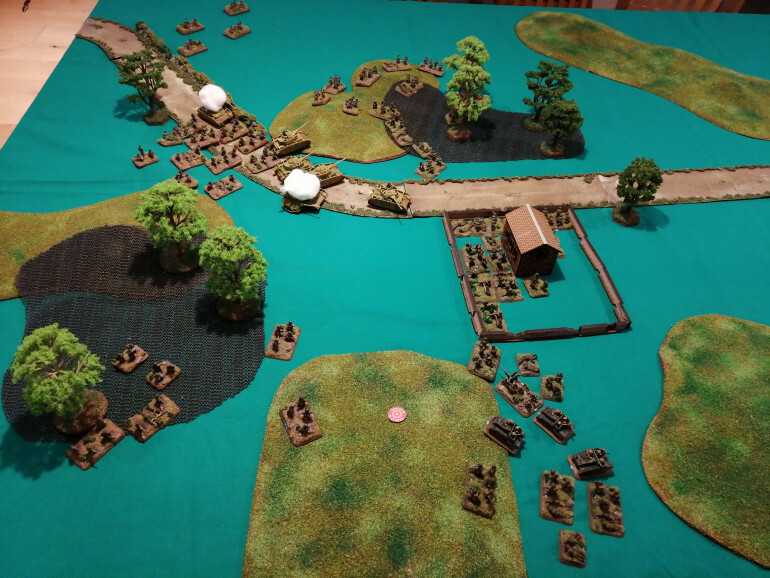 FRP and FGP both spot BBP and are able to bring down 4 teams with their heavy fire. The mortars are able to repeat their bombardment and destroy 1 team from BRP. The kills are now starting to take their toll on the British. Again BPP and BBP unpin. 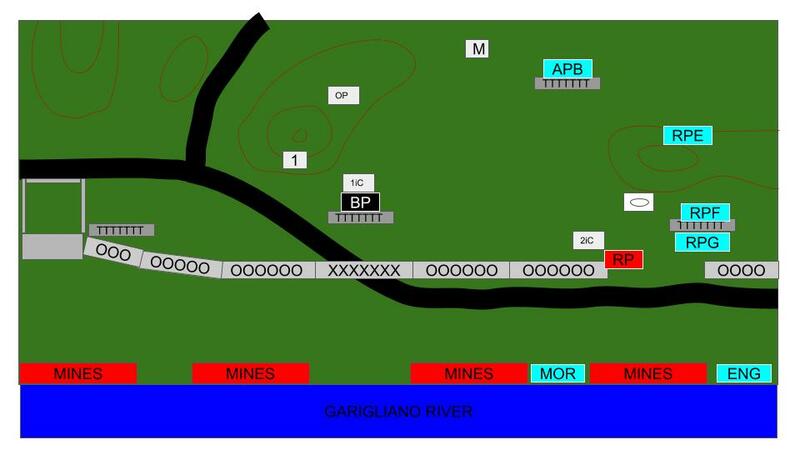 BBP chooses to move through the minefield, losing a team in the process and moves toward German MG2 with the aim of launching an assault. The British shooting is woeful and unable to hit anything. This just leaves the combined assault from BBP and BPP on MG2. The defensive fire causes only 4 hits, removing 1 stand which means that the assault hits home. MG2 is overrun and destroyed by the combined British assault. Nest 2 continues to focus its fire on BBP, killing another team. FGP kills a further 2 teams from BPP, leaving just a single team left. FRP kills another team from BOP and at this point, with British casualties running at well over 50%, the assault is called off. 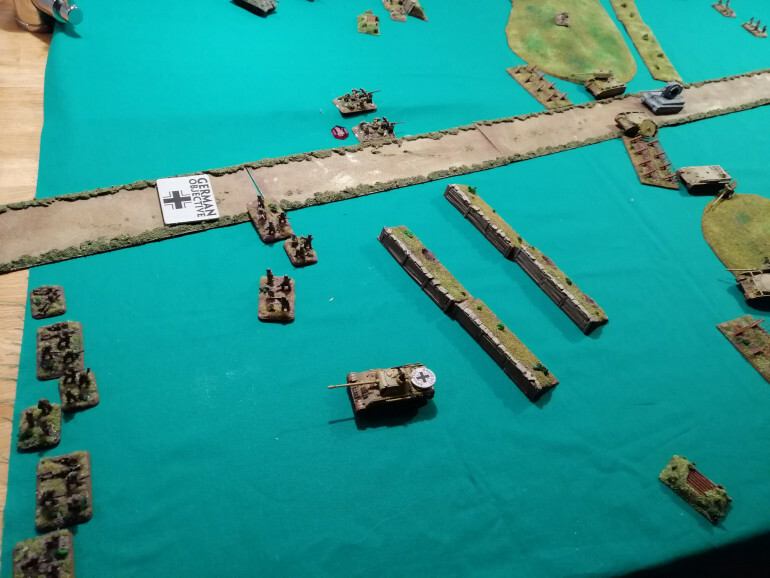 In the actual assault, both sides took a mauling however here, the Fallschirmjager came out of it fairly unscathed, losing just a couple of teams. As a follow up battle, we could plot the real assault by allowing the Rajputana Rifles and Gurkhas to assault the same positions the following night, perhaps with the Germans having to maintain the losses they sustained in the first night. Still, an interesting game and a clear demonstration of just how brutal the assault on Cassino actually was. Despite MG1, all of the British platoons unpin this turn. BPP heads out further right to try to outflank and stay out of the way of the German MG’s. BOP advances up to the barbed wire to its right, fearing a frontal assault might be too much. BBP heads straight ahead and BRP successfully clears the minefield it’s in. BGP bravely continue to inch closer to FBP in their trenches. BOP fails to cause any wounds as does BBP although BBP does at least lay down some smoke on FRP. BGP is able to kill one stand from FBP but doesn’t cause enough hits to pin them ready for another assault. 1iC again changes the location of the bombardment to target a point that takes in FGP and FBP. Ranging in on the second attempt, both German platoons are hit and pinned but no further damage is caused. Once again BGP tries to assault FBP. 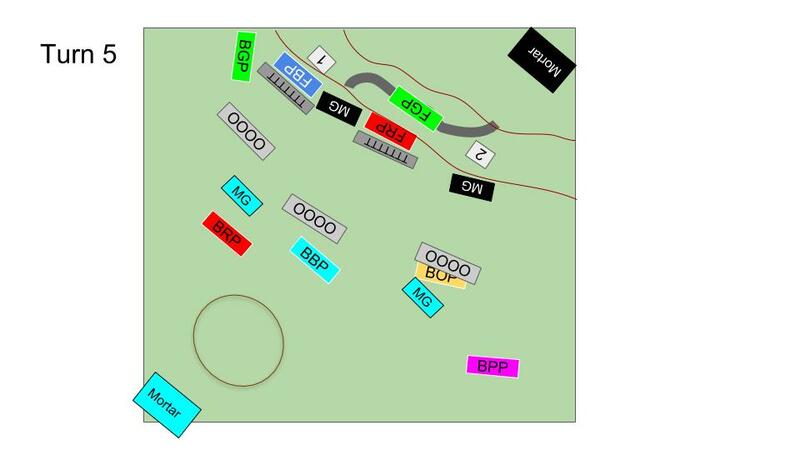 The defensive fire from FBP and nest 1 is just as brutal and BGP loses another 4 stands and gets pinned in place. 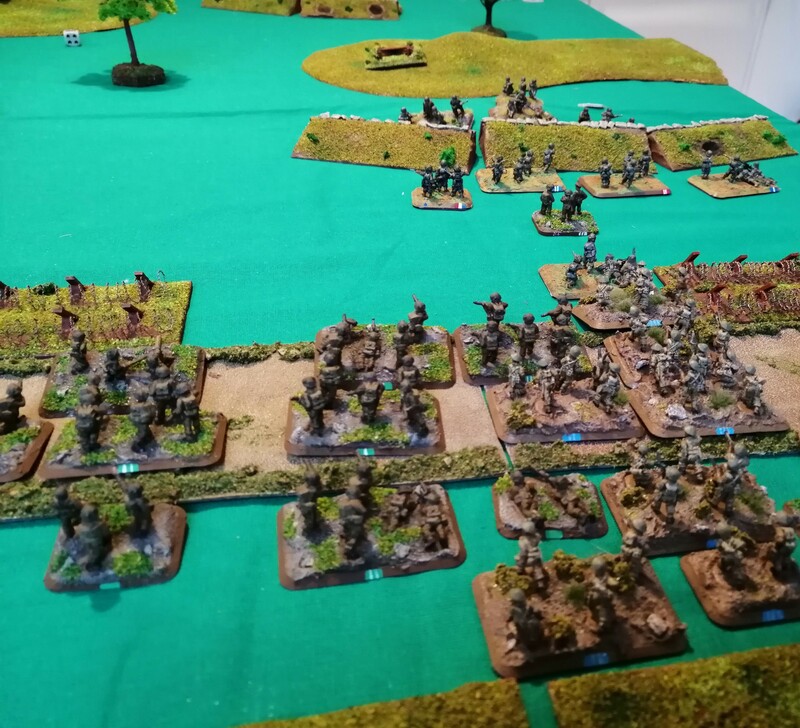 The Germans again unpin all of their units. FBP wastes no time in removing the the remaining stands from BGP. 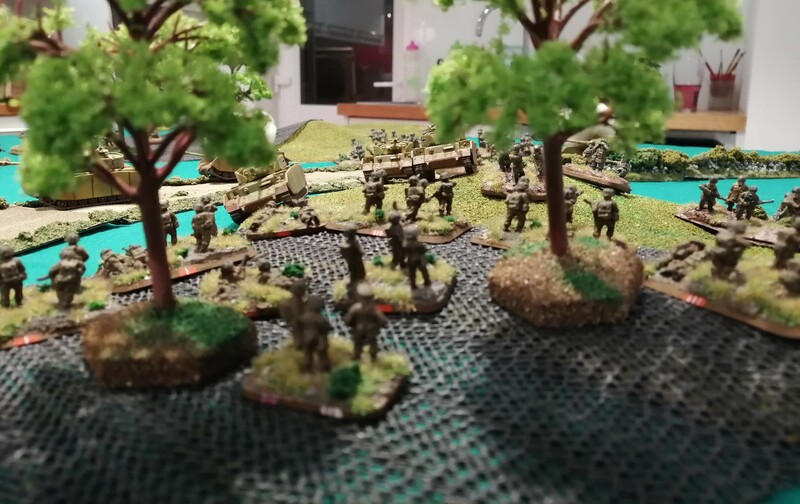 British Green Platoon is removed from the game. 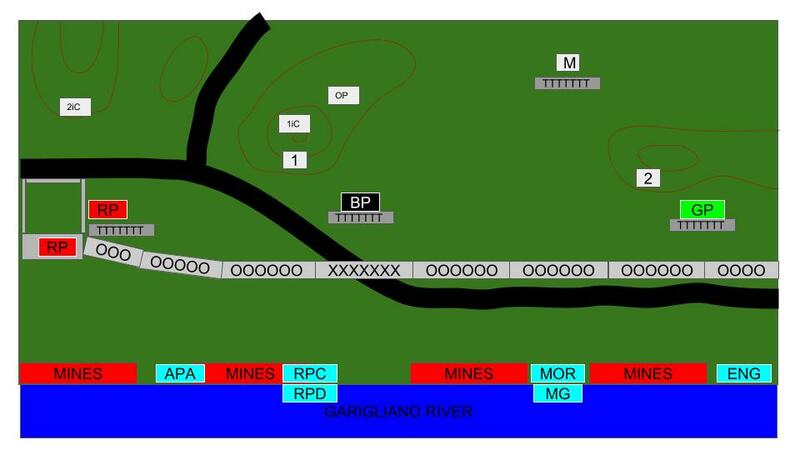 FRP is able to kill 2 stands from BBP while MG2 kills another stand from BOP. The British fail a lot of pinning checks and only BPP, BBP and MG1 are able to unpin. MG1 stays put as this allows it to bring its full rate of fire. BPP continues to advance to the right while BBP moves up the middle between the two sets of barbed wire. The British shooting fails to cause any damage despite quite a few hits. The Germans have dug themselves in very well and are proving very difficult to damage. The only real success of the British shooting was the mortar attack that hits FRP and pins them. 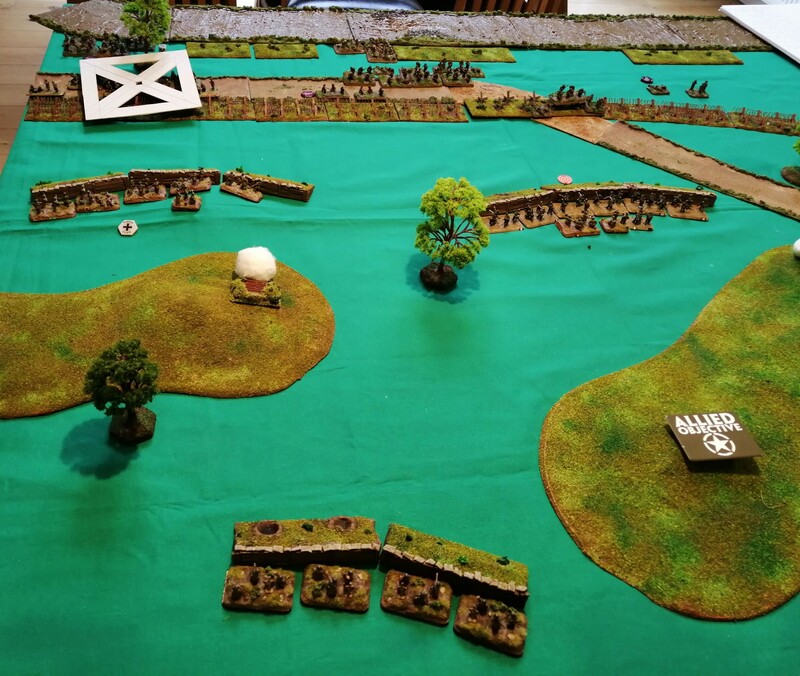 FRP unpins at the first ask, effectively making the British last shooting round redundant. 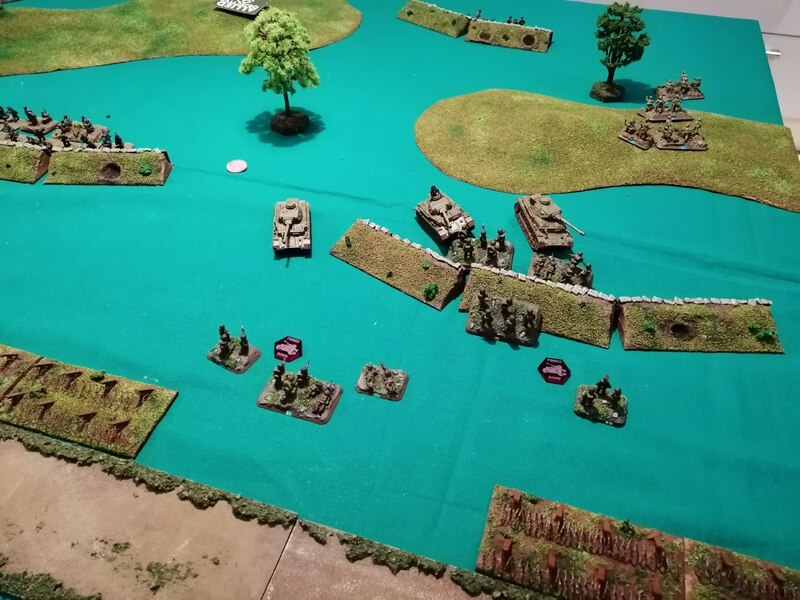 The Germans begin to return fire, and the German MG1 and FBP destroys the British MG1 platoon completely, significantly reducing the British firepower. 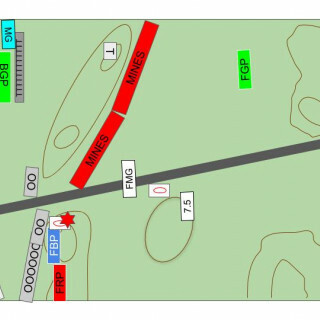 The 1iC is able to spot the BRP and the mortars rain down but despite a lot of hits, fail to cause any wounds at all. I forgot to define my naming conventions at the start of the last report. BRP stands for British Red Platoon, as indicated on the tactical maps. 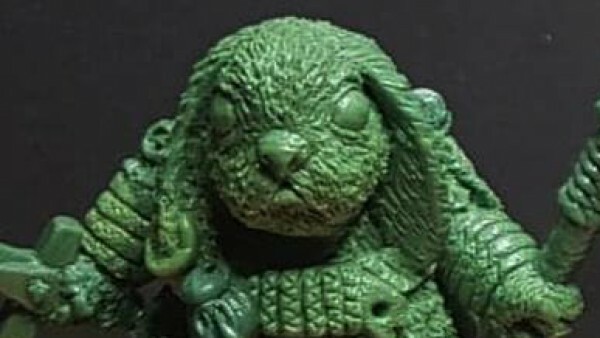 BGP would be British Green Platoon. FRP = Fallschirmjager Red Platoon and so on. 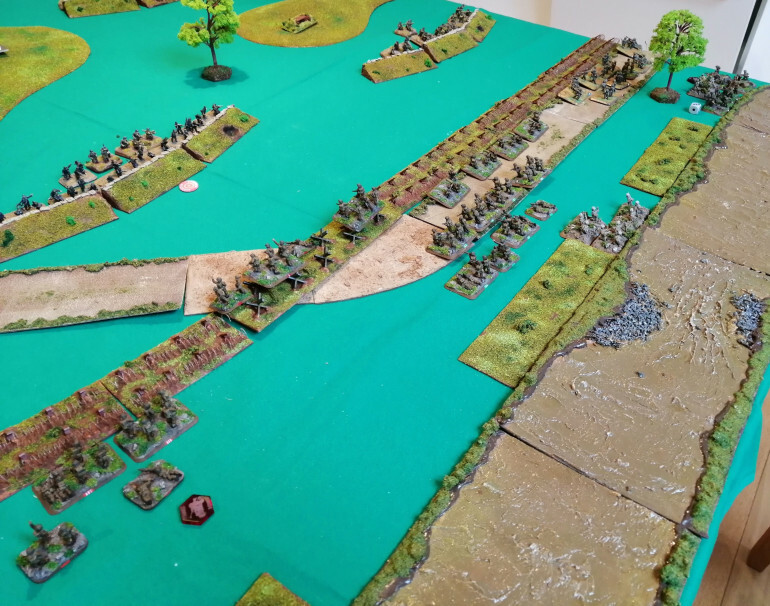 As per the special rules, the British platoons need to unpin to move.Only MG2 and BBP are able to unpin and continue to crawl forward toward the enemy. The British fail to spot any German troops this turn. For the Germans, just MG2 is able to spot their opposing number and open up on the British MG2 platoon. 6 shots cause a couple of hits but these are saved and no damage is caused. 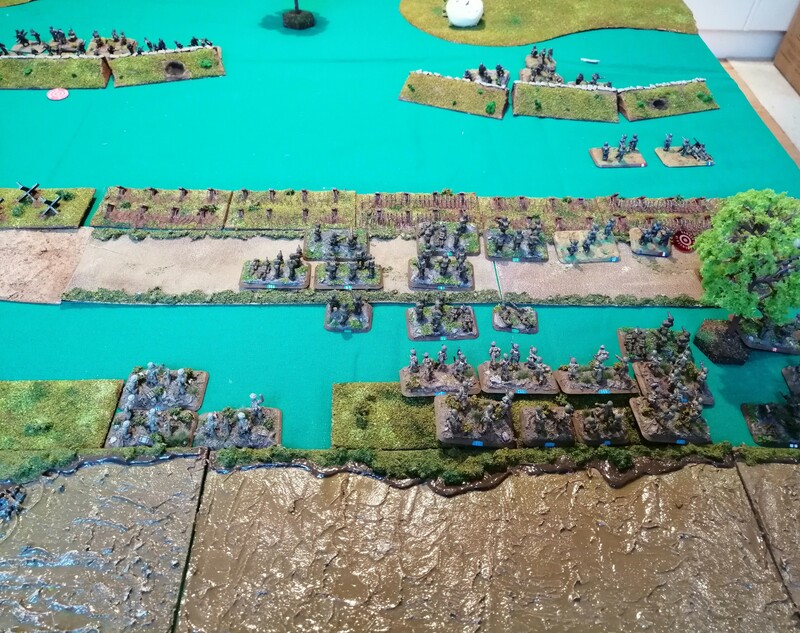 It’s a cagey start to the battle with Turn two ending with no casualties so far and only a couple of British Platoons able to move in both turns. 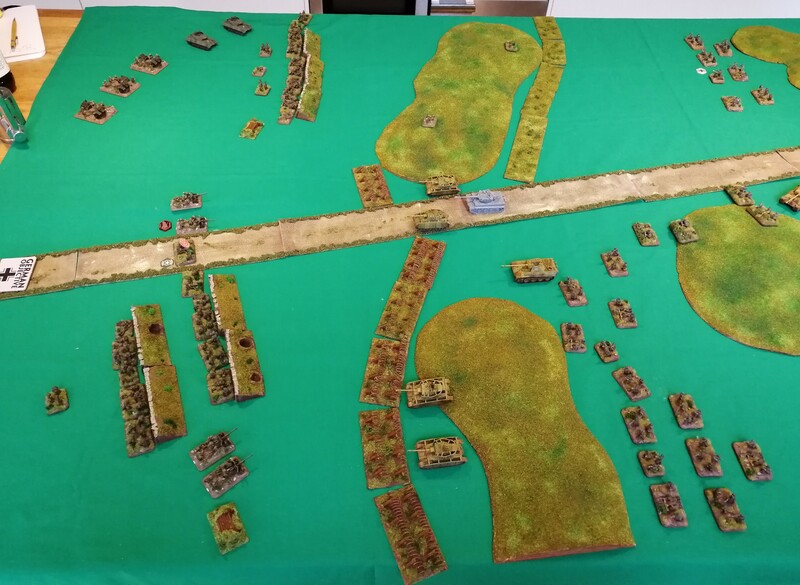 BPP, MG1 and BGP unpin and advance 8” toward the German lines. MG1 is able to spot the German MG1 but again, the dug in position protects the Germans from any damage. BGP is close enough to now spot FBP but the two shots that do hit fail to wound thanks to the trench works. Finally, 1iC who is advancing just behind BGP is able to spot for the mortars who range in on a point covering the German 1iC, German MG1 and FBP. The mortars aren’t particularly effective, only causing the 1iC to duck for cover and become pinned. This turn MG2, BOP, BRP and BGP all manage to get going and advance. BRP finds the first minefield but fortunately, none of the teams that entered it take any damage. 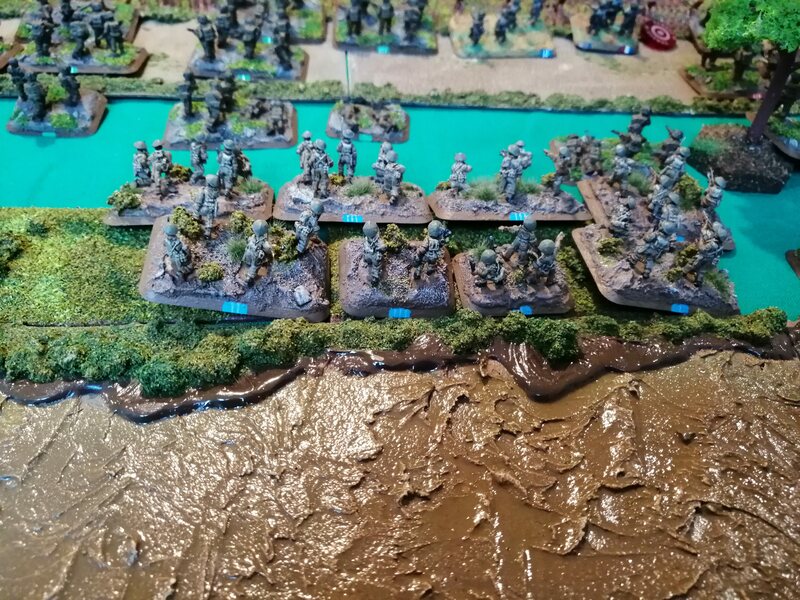 They do however find themselves stuck in the middle of the minefield, not an ideal place to be when faced with German MG’s! 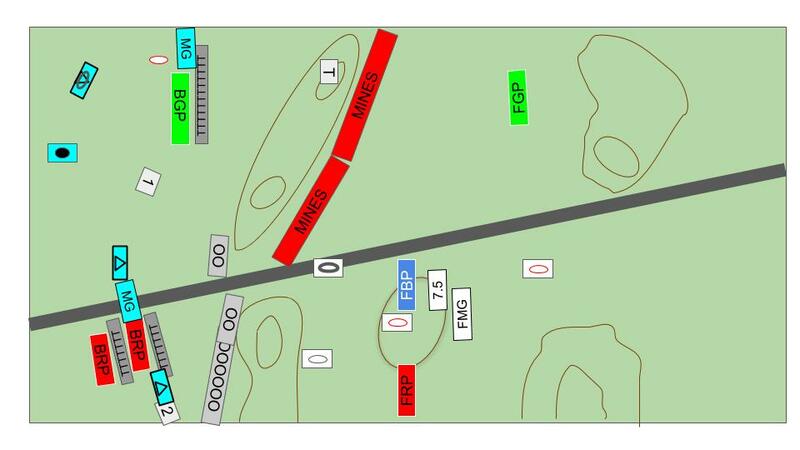 BOP and BGP are able to spot and fire upon some German targets but again fail to cause any damage. The British 1iC can only spot 14” this turn and so can only call in a mortar bombardment on the FBP which hits, pinning them in place but causes no further damage. BGP are close enough now to launch an assault against FBP. Shouting the order, the platoon command tries to drive his platoon forward. FBP and HMG Nest 1 both open up with defensive fire and get 6 hits, killing two stands. This is enough to pin the British in place and cause the assault to fail. At the start of the German turn, FBP unpin and immediately begin firing into BGP. Despite a lot of hits, they fail to cause any further damage although HMG Nest 1 is able to pick off another stand. 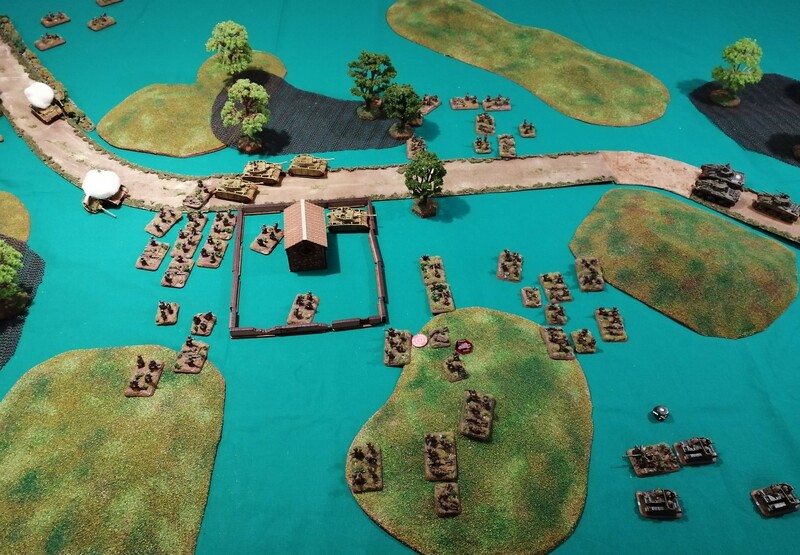 THe British MG2 is removed by its opposing number and HMG Nest 2 takes out 2 stands from BOP. FRP also removes 2 stands from BOP, effectively reducing BOP’s fighting strength by half in a very short space of time. 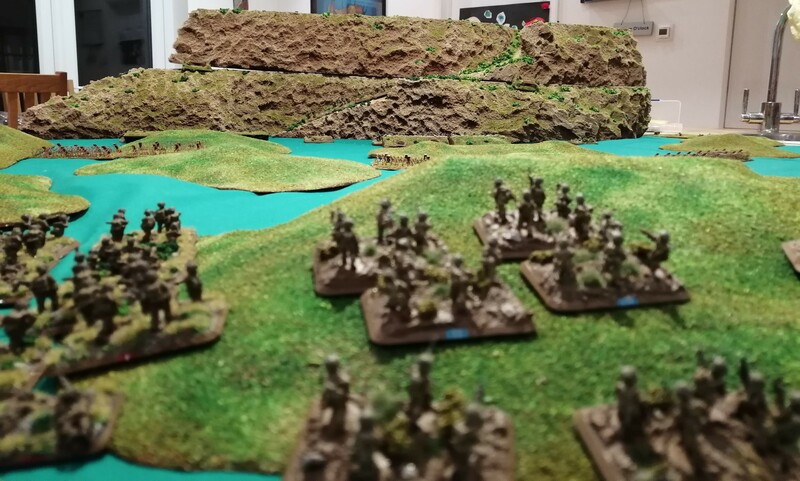 On 16th February, elements from the 4th British Indian Division had advanced up Snakeshead Ridge and were preparing to launch an assault on the key defensive position of Point 593. 1st battalion from the Royal Sussex Regiment, supported by the Rajputana Rifles and a Battalion from 9th Gurkha Rifles, had reached a low rise just 90m from Point 593. Opposing them, and heavily dug in around Point 593, were the elite German 1st Fallschirmjager. As night fell on the 16th, the Royal Sussex Regiment attempted to cross the 90m and capture point 593. Nearly 50% of the men that attempted the assault that night failed to return. In this battle, we will try to recreate the assault by the Royal Sussex Regiment. 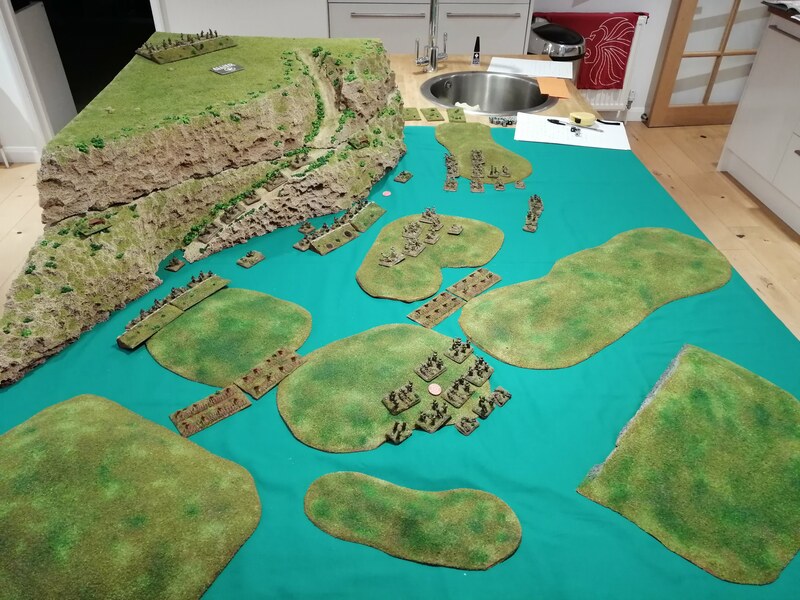 The table set up is as close to scale as possible, with just 90cm separating the low rise occupied by the British and the base of ‘Point 593’. 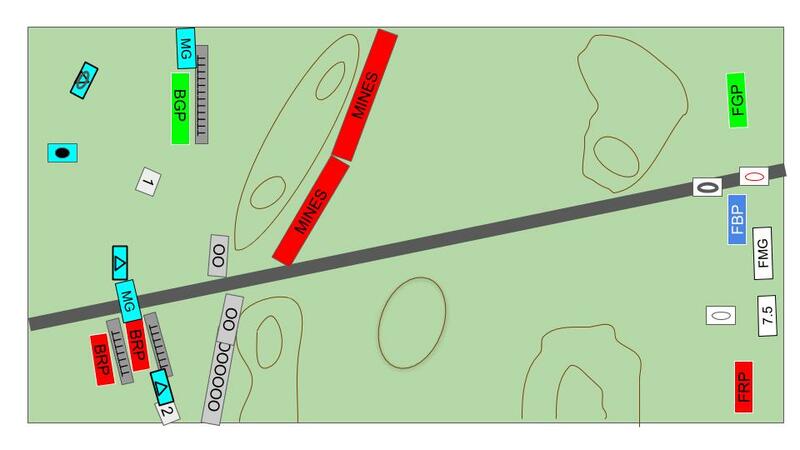 There is no cover between the two locations, similar to the actual battlefield where the troops had to try to cross the gap nearly completely exposed, only able to inch forward. 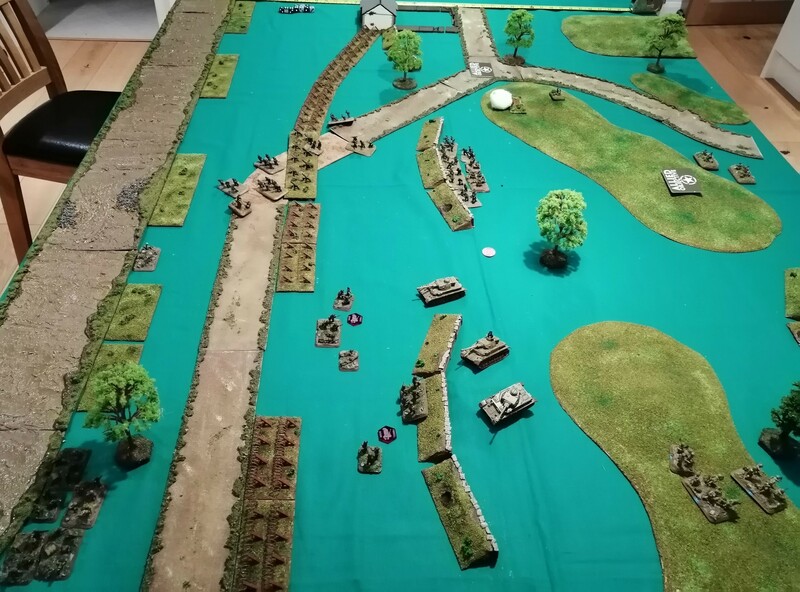 In the actual battle, both sides took heavy casualties so while the Fallschirmjager actually held their position, it’s questionable whether there was really a ‘winner’. To reflect this, there aren’t any victory conditions. A nominal objective token has been placed on top of Point 593 but this game is more an exercise in ‘seeing what happens’. Open Ground – Due to the exposed nature of the ground that the British tried to cross, every British platoon in between the two hills (barring 1iC and 2iC) starts the second and subsequent turns automatically pinned and must unpin to move. Furthermore, British teams cannot attempt to dig in. 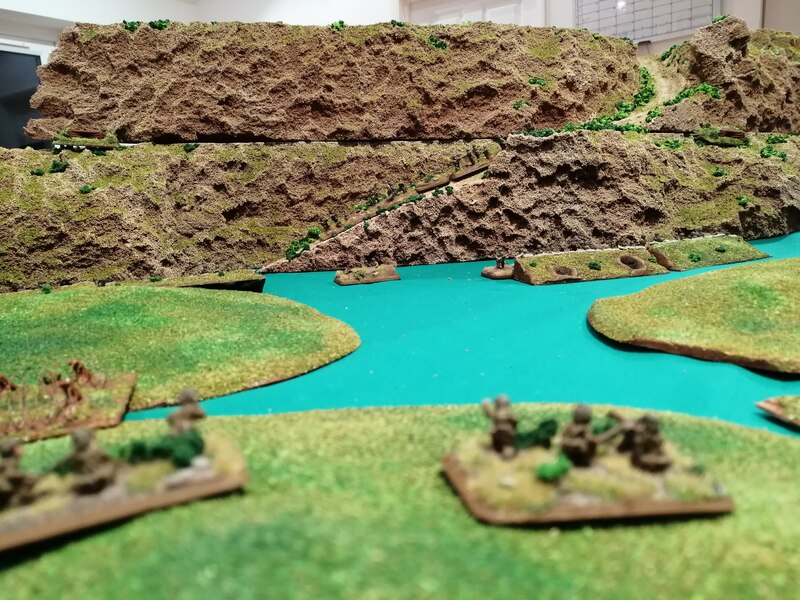 Tricky Terrain – The battlefield, despite offering little in the way of protection, was difficult to cross. Teams cannot move at Dash speed. Unknown Minefields – Snakeshead Ridge was laced with barbed wire, booby traps and minefields. To represent this, two imaginary lines are drawn across the battlefield, one at 30cm from the British starting position and one at 60cm. 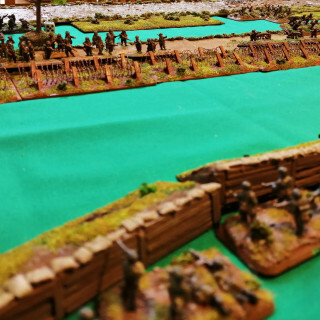 The first time that a British Platoon crosses each line, a dice is rolled. 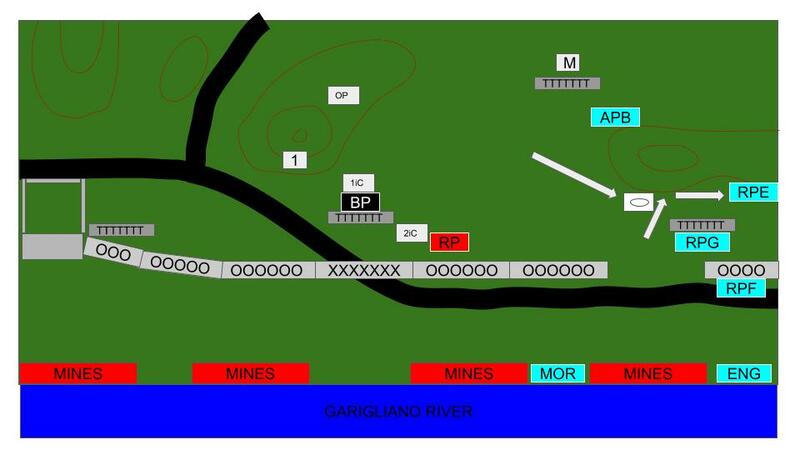 For the first Platoon crossing the 30cm line, they encounter a minefield on a roll of 6, for the second team it is 5+, third team 4+ and so forth. Same for the second line at 60cm. Once the minefield on each line is found, further teams crossing the line do not need to roll. 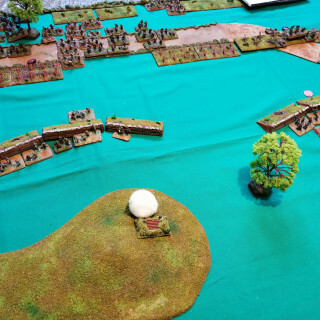 As the attackers, the British will start the game. All of the British platoons advance 8”, trying to spread out across the front line as much as possible. Four of the teams reach the 30cm line and roll to see if they encounter the minefield – nothing so far! MG1 is able to roll high enough to spot the Fallschirmjager MG1 but fails to score any hits. BGP can also spot FBP but again, the range and the fact that the Germans are concealed and dug in means that no damage is caused. 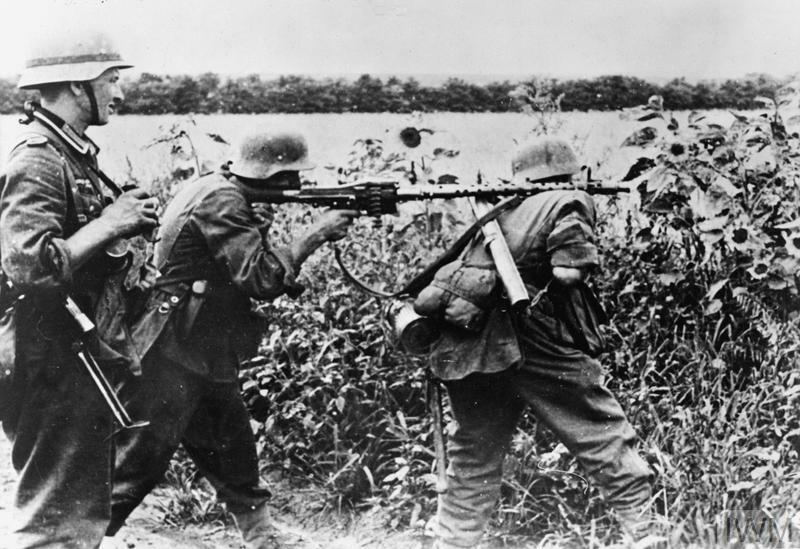 The entire Fallschirmjager force is able to unpin giving them full rate of fire should they be able to spot anything. The Fallschirmjager are trained well enough to know that they shouldn’t move out of their positions and so go straight to shooting. Unfortunately, despite straining into the cold night air, they fail to spot any British teams and so cannot fire this turn. 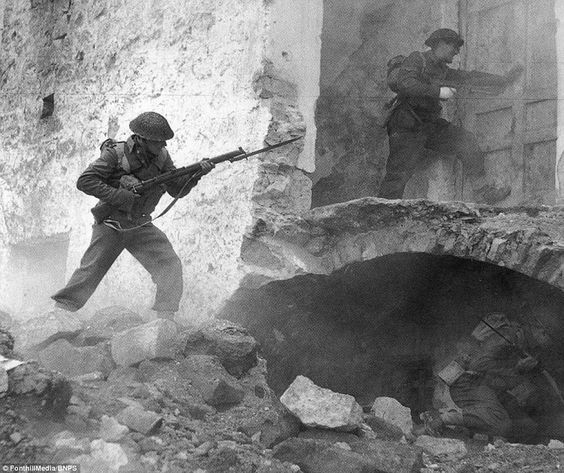 Following the 2nd attempt to capture Monte Cassino, both sides had fallen back into defensive positions to regroup and rebuild. Both sides had taken a beating during the assaults and needed time to recover and rest. The other key factor for the lack of action was the inclement early spring weather. Torrential rains had turned the ground into a quagmire whilst snow melt from further inland had added to the rain water to swell the rivers into impassable barriers. Freyburg’s New Zealnd Corps had not been withdrawn following the 2nd assault and it once again fell to them to carry the attack. The NZ Corps had recently been bolstered by the arrival of the British 78th Division but otherwise were comprised of the 4th British Indian Division and the 2nd NZ Division, both still nursing losses from the previous assault. The poor weather had meant trying to cross the Garigliano river and pushing into Cassino directly was a highly unattractive proposition, especially after the last two attempts had ended so poorly for the Allies. Freyburg drew up an alternative plan to cross the Rapido further North and then proceed in a two pronged attack down the valley from the North. The 2nd NZ Division would keep to the valley and attempt to take the town of Cassino while the 4th British Indian Division would once again head up into the hills and assault the monastery. 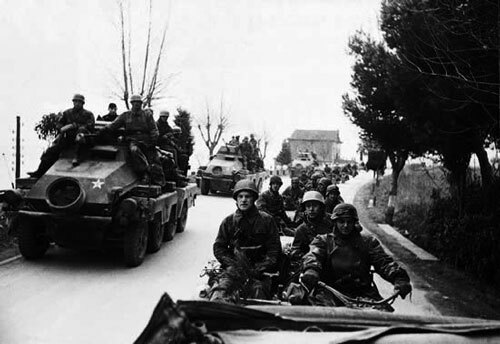 If the assault proceeded well, the 78th Division would cross the Rapido further downstream and proceed up the Liri Valley toward Anzio and Rome. It wasn’t a popular plan. 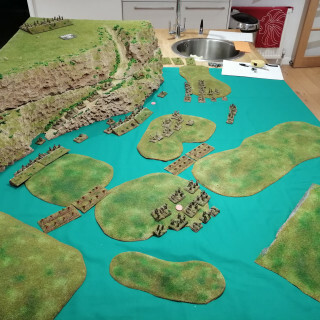 The view from the Allied command was that there was a lack of troops to complete the operation and those that were available were under equipped. The weather was also of significant concern. However, pressure was being applied to make another attempt to break the deadlock and relieve the troops at Anzio and so the plan went ahead. 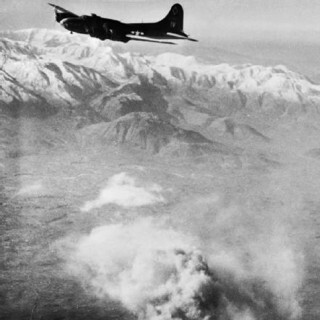 It was hoped that a colossal bombing and artillery bombardment would clear the town of Cassino of defenders and make the taking of the town considerably easier. To accomplish this, three consecutive days of good weather were required and it wasn’t until the 15th March that the forecast was favourable. 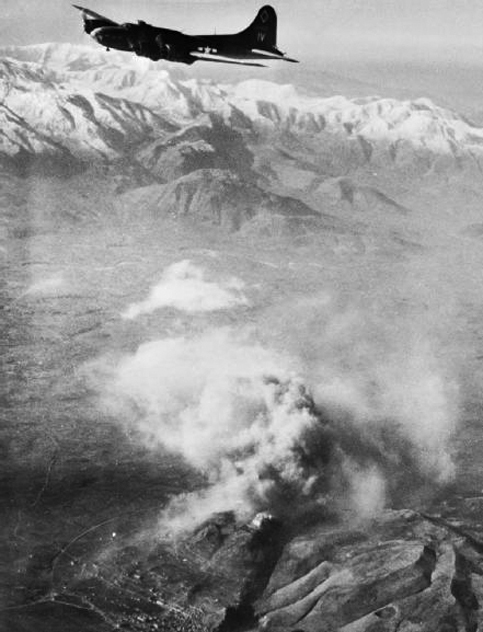 Early on the morning of the 15th March, around 750 tons of 1000-pound bombs were dropped on the town of Cassino. 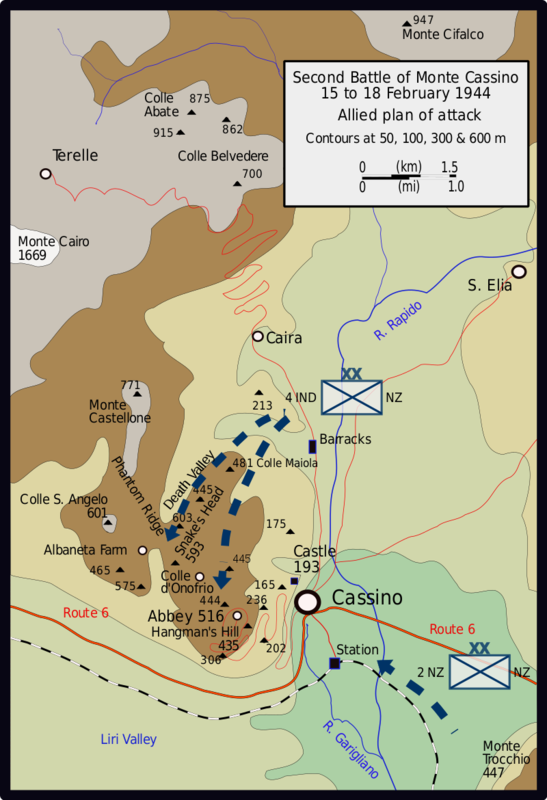 Shortly after, the NZ 2nd Division began the advance from the North toward the town of Cassino. This advance was made behind a creeping artillery barrage from around 750 Allied artillery guns that lasted well over 3 hours. Trying to imagine the scale and power of such a bombardment for the defending Fallschirmjager is beyond comprehension. This was partly the Allied plan, to make use of the shock and confusion to overrun the defenders. However poor coordination and the defenders ability to rally and organise quickly meant that the advantage quickly dissipated. 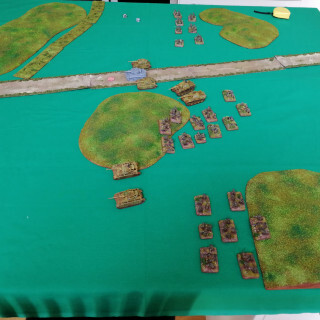 To further confound the problem, Allied armour was held up by the heavily cratered ground leaving the infantry to assault the town without support. 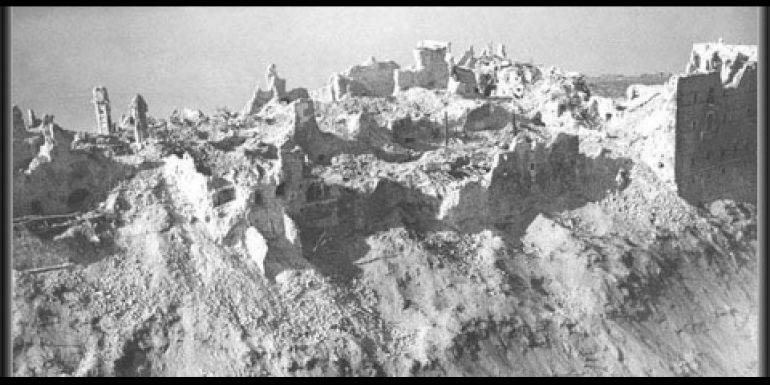 While the NZ 2nd Division were assaulting the town, the 4th British Indian had advanced up the hill to once again assault the monastery. For some unknown reason, the monastery that was the focus of such bombing and shelling in the last assault was left off of the list of targets for the Allied Air Force and Artillery this time. This left a highly trained and motivated defensive force dug in to highly defensible positions. The 4th British Indian Division encountered stiff resistance throughout their advance up the hill. They had slowly fought their way to point 236. The Rajputana Rifles led the assault and were due to be assisted by the 9th Gurkha Rifles who had looped around. In the confusion, the 9th Gurkhas had missed point 236 and had progressed to take point 435 further along the hill. 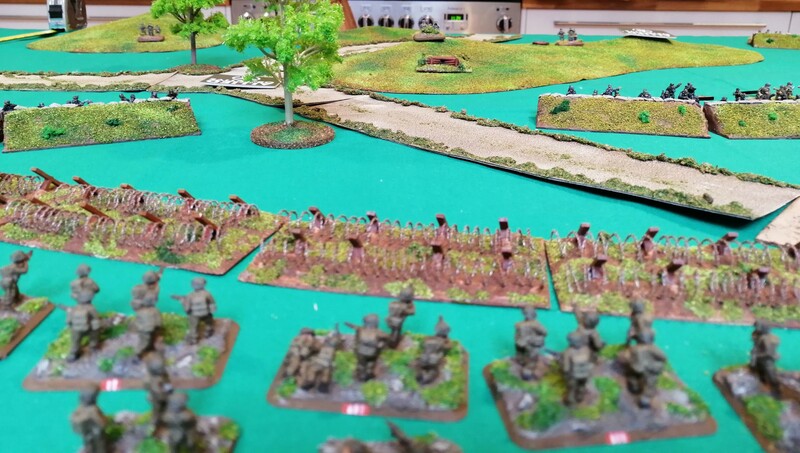 Meanwhile, the heavily defended 236 repelled the attack from the Rajputana Rifles. This level of confusion and fractured front line, pocket fighting, was typical of the battles at Cassino, especially along the hill tops. Company Headquarters 25 yards away’. 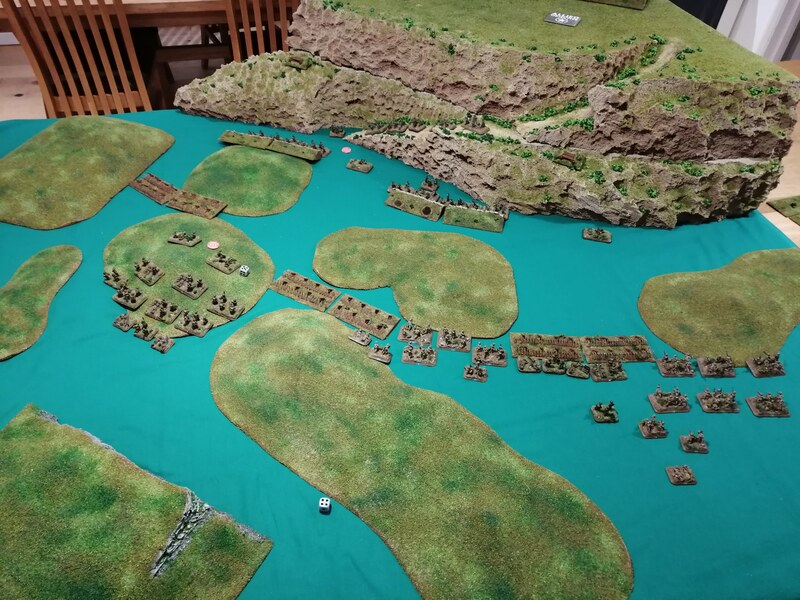 Despite the conditions and the tenacious defence, the New Zealanders managed to Capture Castle Hill and were slowly pushing through the town. Shermans from NZ 2nd Division had also managed to advance across the cratered and muddy landscape and, along with some infantry, had captured the station on the edge of the town. By the 17th March, the Gurkhas still held Hangman’s Hill (point 435) and the rest of 4th British Indian were now just 250m from the monastery. Point 236 had still not be taken allowing the Germans to seriously compromise the supply lines of the 4th British Indian. The Northern part of Cassino still lay in German hands and this allowed for a steady stream of reinforcements to keep the defences of the town solid and well supplied. 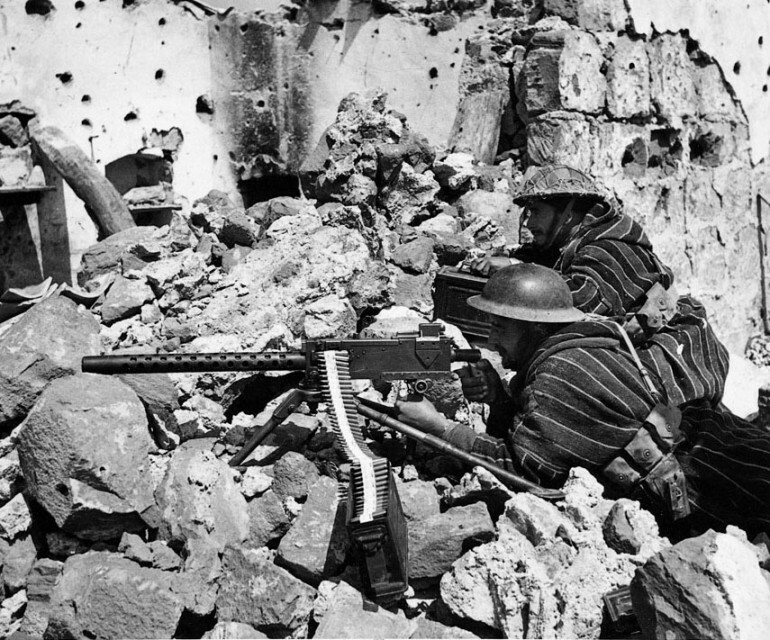 Several times the New Zealanders found German troops and snipers had infiltrated parts of Cassino that had previously been cleared. Further to the North, while the 4th British Indian were struggling up Monte Cassino, engineers had been preparing a small track looping around and connecting to Albaneta Farm, to the North West of the monastery. A surprise assault by tanks of the 20th Armoured Regiment was due to take place on the 19th March, using the newly prepared track. 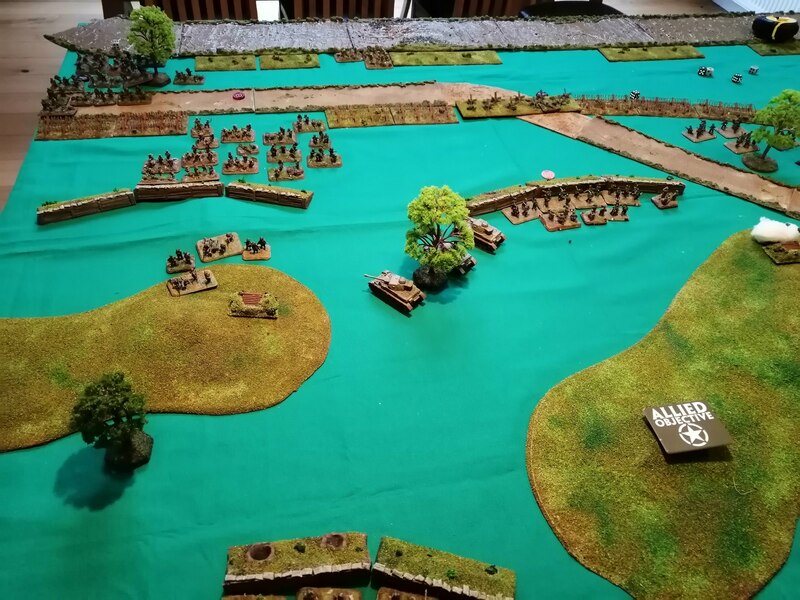 From their position, the tanks were unsupported by infantry however the 4th BI were also due to launch an assault, linking up with the tanks and pushing to the monastery. 1st Fallschirmjager launched a surprise and fierce counter attack shortly after the Allied assault started, driving between the infantry and the armour. 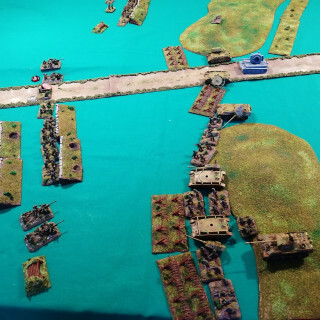 4th BI were unable to make any ground, leaving the tanks unsupported. In the difficult terrain, the armour made slow progress and by mid afternoon, all of the tanks had been knocked out or disabled. This surprise and timely counter attack had stopped the Allied assault in its tracks and effectively stopped the Allies in their attempt to take the monastery from the North. In the town of Cassino, progress had also ground to a halt. The defenders were still able to feed reinforcements into the town using a route down through Points 445 and 165. This being despite the Allies holding Castle Hill (Point 193) and the Gurkha’s holding onto Hangman’s Hill (Point 435). To cut this route off, Freyburg committed elements of the 78th Infantry Division into the town and to Castle Hill to free up defenders to launch an assault on Point 445 from Castle Hill. 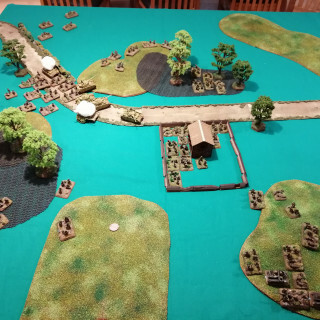 Again the fight was grim and bloody but resolute defending from 1st Fallschirmjager just managed to hold off the attack and the Allies fell back to Castle Hill. By this point, both sides were exhausted and gains were measured by metres. The Allied commanders felt that victory was close but with losses mounting, Freyburg took the decision to call off the assault. The order to withdraw was given on 23rd March. The next few days were spent digging in and extracting the isolated Gurkhas at Point 435 and NZ 24th Battalion that had also become isolated further down hill at Point 202. The NZ 2nd Division and 4th British Indian Division were withdrawn from the front and replaced by British 1st Guards Brigade and British 78th Division respectively. 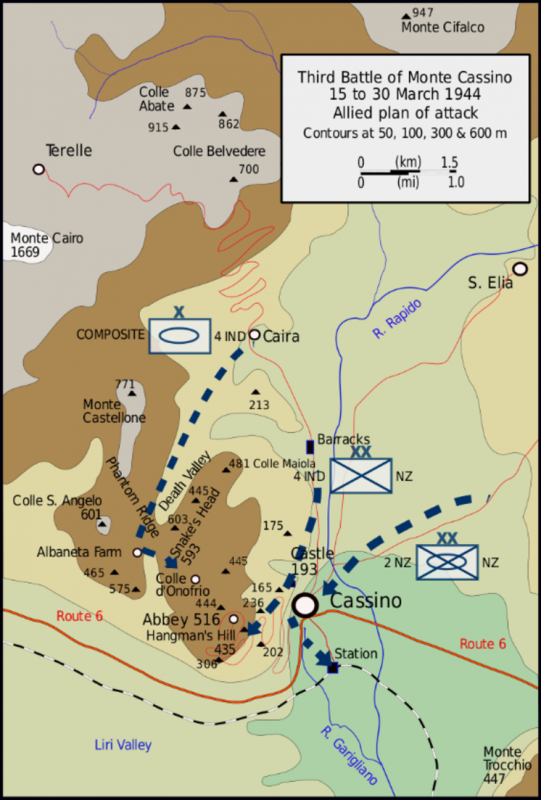 During their 6 weeks on the Cassino front, 4th BI lost around 3,000 men while the 2nd NZ Division lost 1,600. Meanwhile, the defending Fallschirmjager had taken an absolute mauling. Some battalions had been reduced to a strength of just 40 and their lines of defence had been stretched to the point where many lesser forces would have broken long ago. But they had held and continued to occupy the monastery and the road to Rome and Anzio remained closed to the Allies. 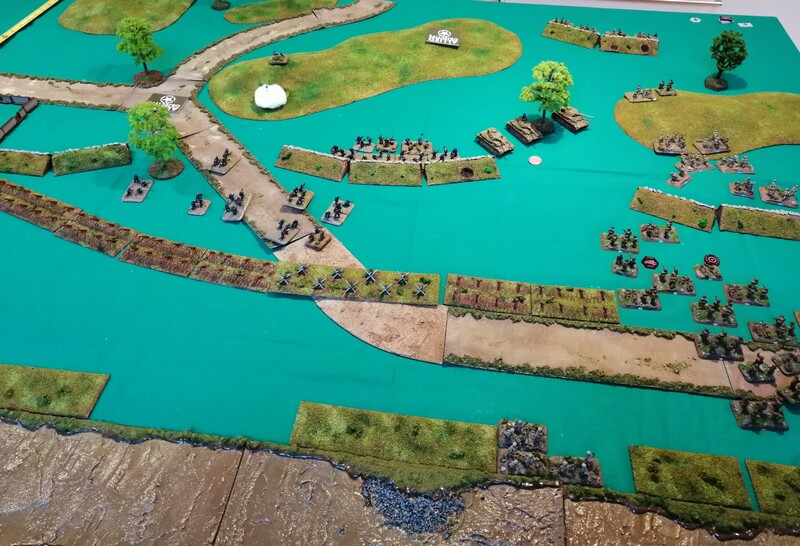 The German’s start the turn with FBP failing a morale check and being withdrawn from the battle. 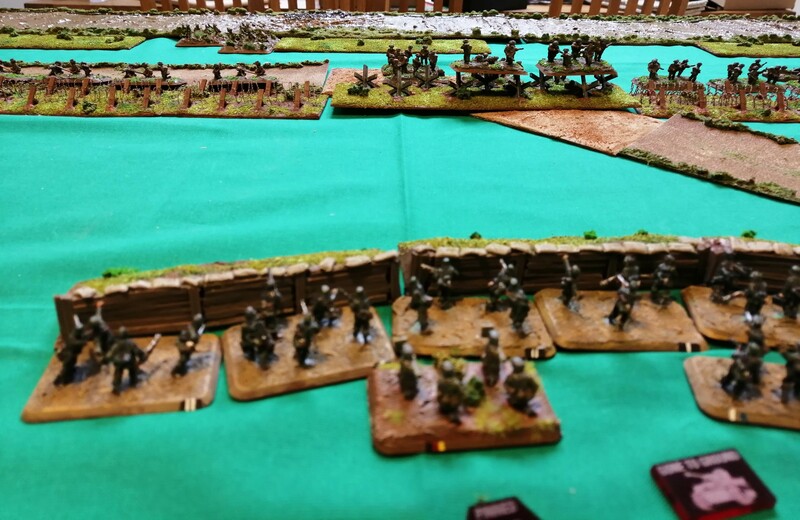 The German left flank is now looking very shaky! Once again, FGP fails to unpin, which given the supposed fearless reputation of the Fallschirmjager is nothing short of shameful! With some of the barbed wire now removed, FRP are able to advance upon the British trench positions. 1iC in the Panther also advances to support the infantry and both are within assault range. Another couple of Stukas arrive this turn and concentrate their bombs on the 2 M10s. Despite ranging in, they fail to hit the M10s which might leave the Panther horribly exposed! The 7.5cm guns start to bombard BRP in the hope of pinning them in place to support the assault. They successfully range in and hit a number of teams causing a pin but fail to do any damage – still a good result! 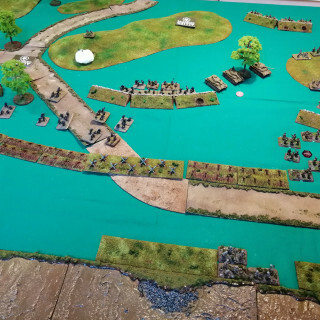 Finally, FRP and the Panter fire at the British in their troops but fail to cause any damage. 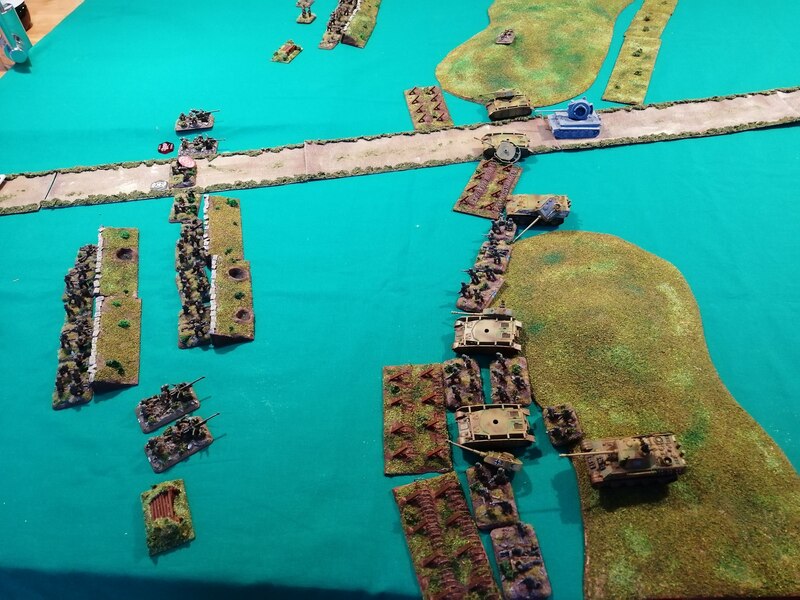 With the shooting done, the 1iC assaults the 6pdr teams with his Panther. The Defensive fire is ineffective against the thick armour of the Panther and the tank crashes into the gun teams, killing one. The remaining gun team is unable to fall back and is destroyed. 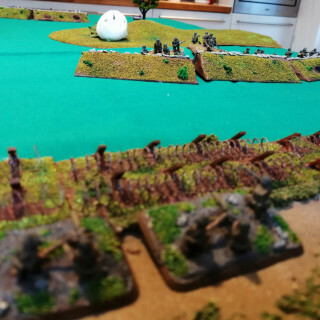 FRP launches an assault against BRP in their trenches. The defensive fire fails to cause enough hits to pin FRP nor cause any wounds, so the Fallschirmjager hit home, destroying 3 British units in the process. 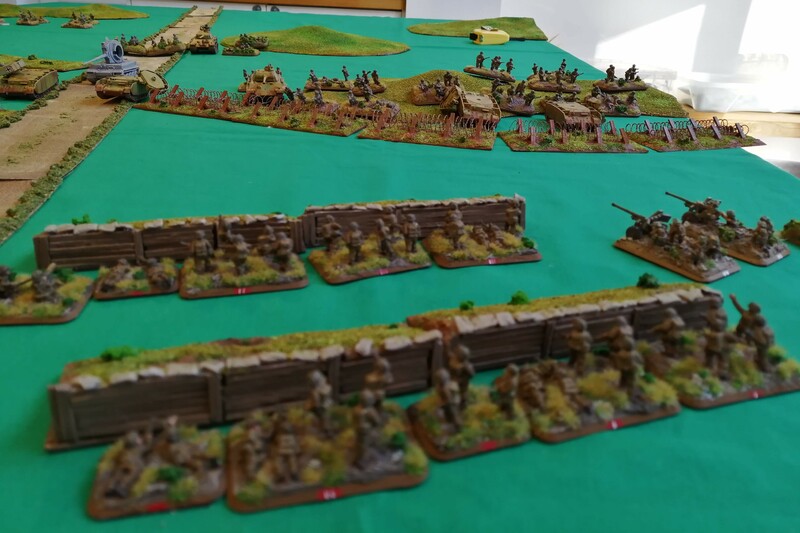 The rest of the British Infantry Platoon can’t muster a counter attack and fall back allowing the Fallschirmjager to occupy the trenches. With the German’s now making progress toward their objective, the British need to stop this quickly. 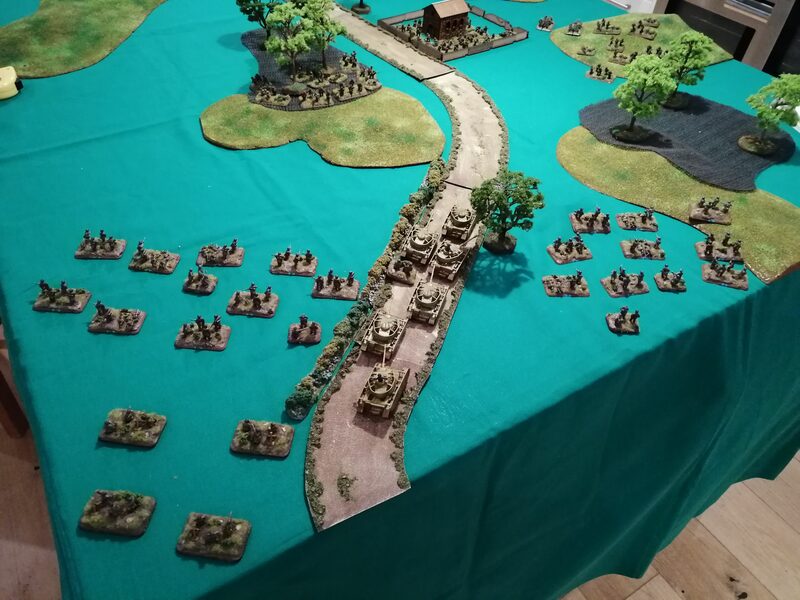 The last remaining 6pdr team fail to unpin again, which is not going to help stop the rampaging Panther. The MG team and what’s left of BRP fire upon FRP in the trenches. It causes a few hit but not enough to remove any stands. The M10s are able to shoot at the Panther and hit, rattling the armour and forcing the 1iC to bail out – this now effectively leaves the German forces without a commander! Over on the British left, the sniper kills one of FGP’s stands. The Naval guns fire again, with the bombardment catching some of FGP’s teams, destroying another stand. 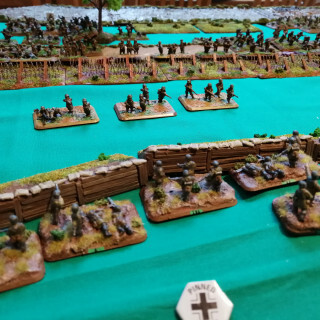 Have the British done enough to stop the Germans? The 1iC needs to remount to stop the entire German force melting away. It’s on a roll of a 3+ and the 1iC makes it, just, with a 3! Remounted, the Panther can continue and advances toward BRP! Over on the German right, and perhaps forced into action after being pummelled by the navy bombardment, FGP finally gets moving and advances up the board toward the sniper. 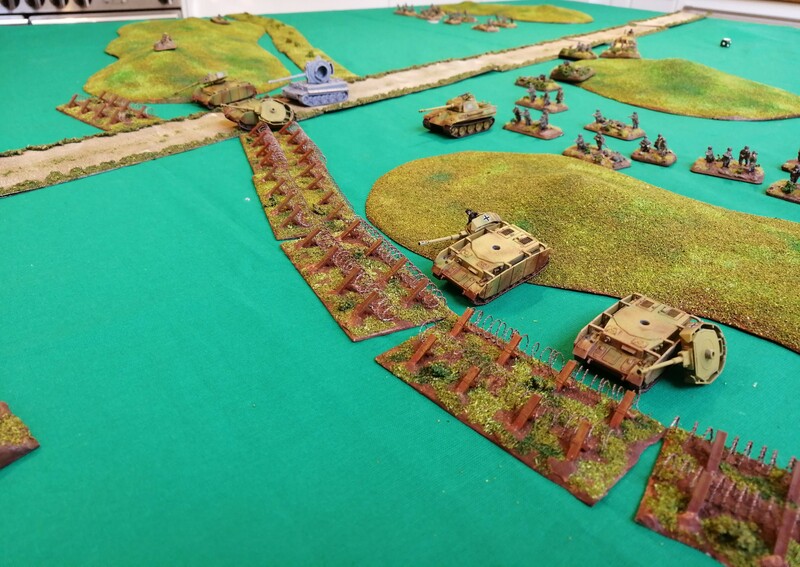 FRP advance out of the trenches toward BRP to support the Panther. The Panther is unable to hit BRP with any shots however FRP does hit the MG platoon, destroying the two teams. The Panther launches an assault against BRP. The PIAT team take aim and fire, hitting and penetrating the Panther. It doesn’t destroy the tank but it’s enough to cause the 1iC to bail out (again), halting the assualt! It falls to FRP to try to remove BRP. 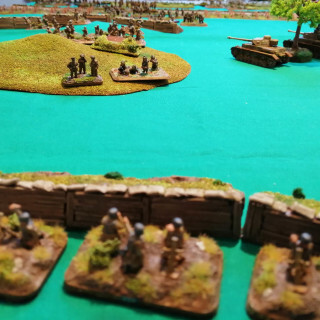 They assault, losing one team through defensive fire but hit home, killing a British team. 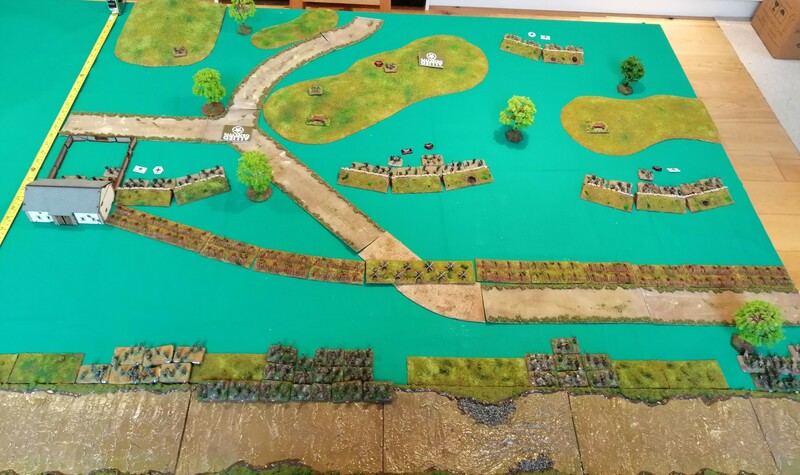 The British fail to counter attack again and fall back, allowing FRP to follow up to within 2” of the objective. With no British unit contesting it, this gives the victory to the Germans! This was an enjoyable game, particularly at the end with the somewhat unlikely and pyrrhic victory for the Germans. 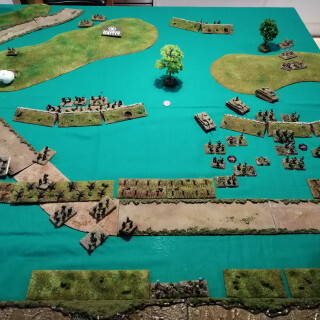 Had the game continued, it’s unlikely that the Germans would have held onto the objective and would probably have been pushed back, but, to win they only had to be in unopposed possession of the objective. 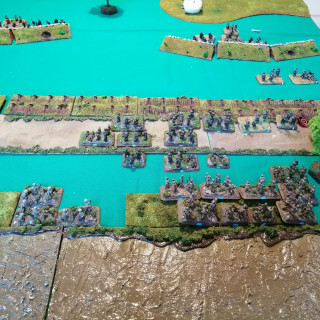 Tactically the British should have moved their left flank to cover their right and leaving the infantry in platoon in position on the left was a big mistake. This could have been enough to stop FRP rampaging through to the objective. 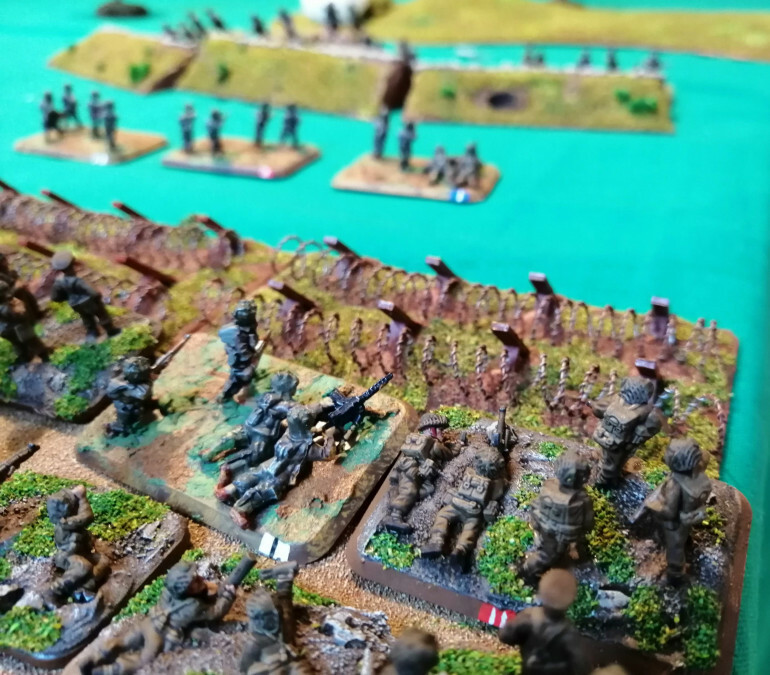 The Naval gunfire was perhaps not as effective as it could have been, perhaps the rules should have automatically pinned all German troops within a much bigger radius rather than the standard FoW rules of pinning from bombardment. However, the sniper on the left earnt his pay, tying down an entire platoon for pretty much the whole game. 1iC is able to finally remount its Panther and get going again. FGP is still not able to get up and advance in the face of the sniper. This is now really hampering the attack as the Germans cannot apply any pressure on the British left flank. Again there is no air support this turn for the Germans, so no pressure can be applied to the British back line. The 2iC panther attempts to cross the barbed wire but fails their cross check and stays stuck in front of the obstacle. 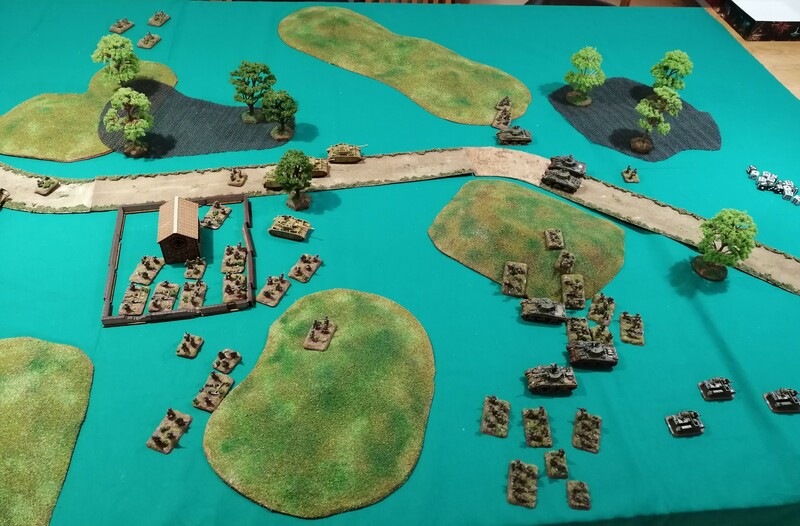 FBP and FRP continue to advance, getting up behind the destroyed Panzer IVs and in support of the Panther. 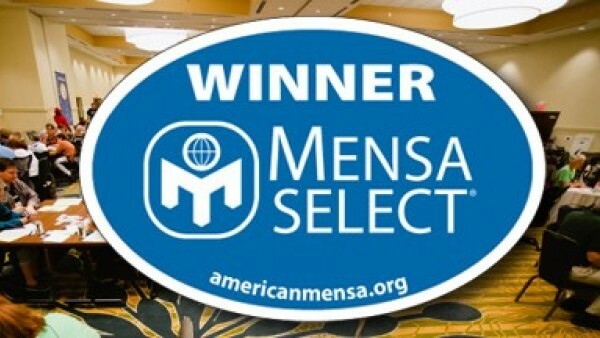 The MG team continues to move forward as well. Both FRP and FBP fire upon the 6pdr guns getting a couple of hits however as the gun teams are dug in, the shots fail to cause any damage. The 2iC Panther attempts to take out the MG Nest but fails to hit at all, firing wildly. 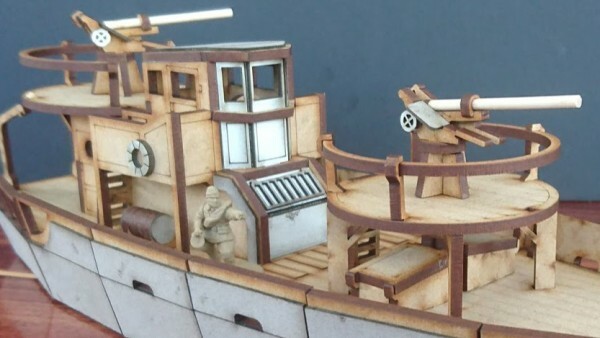 The 7.5cm guns repeat their bombardment causing a couple of hits but no damage. It does pin the MG team and 6pdr teams in place though. The British start their turn failing to unpin both the MG teams and the 6pdr teams. 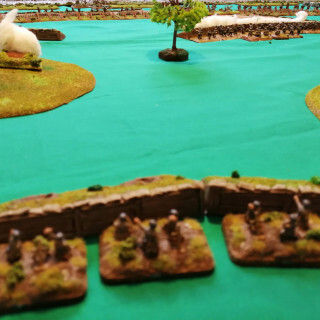 With still no movement, the British go straight to shooting. 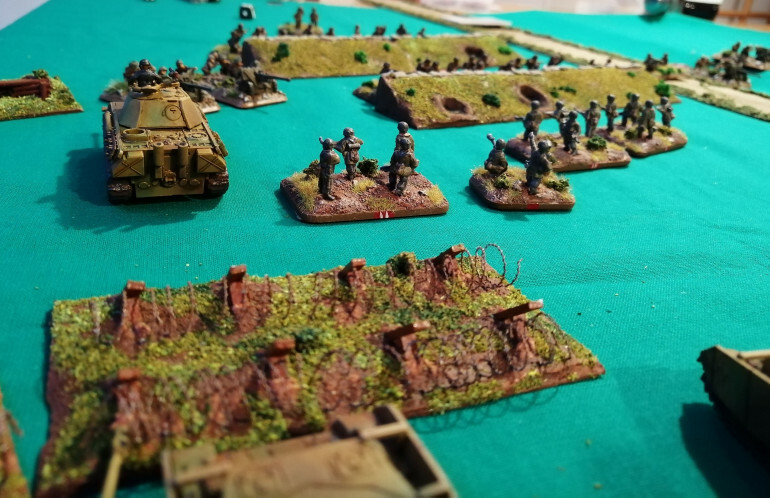 The unpinned 6pdr gun teams on the British right fire on the 2iC Panther. Trying to punch through the Panther front armour is a tough call for a 6pdr but they score 3 hits and are able to bail the Panther. The pinned 6pdr teams fail to score any hits at all. The pinned MG teams fire upon FBP scoring three hits and killing 1 unit. BRP also fires upon FBP causing another two units to be removed and pinning FBP in place. Both of the HMG nests fail to cause any damage this turn despite their best efforts. The sniper also fails to wound despite scoring a hit. FGP remains pinned down. Finally the remaining artillery guns fire direct at the 2iC Panther, scoring 1 hit. This solitary hit is enough to punch through the armour and destroy the Panther. There’s a growing tank graveyard in front of the barbed wire now! FBP unpins but FGP remains pinned for yet another turn. A couple of Stukas arrive this turn to harass the British. 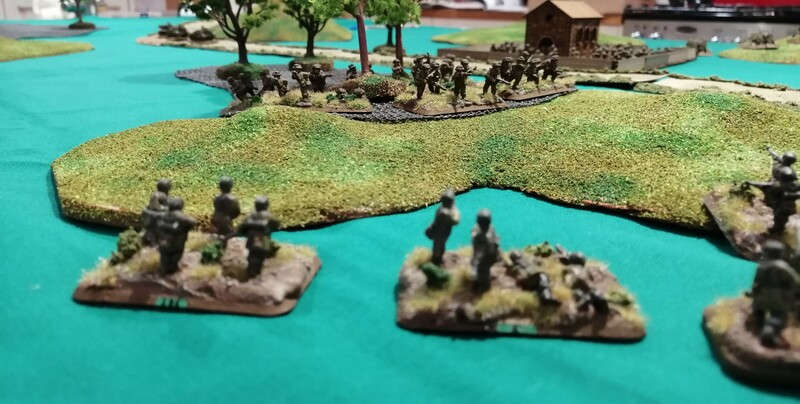 The Germans continue to advance. 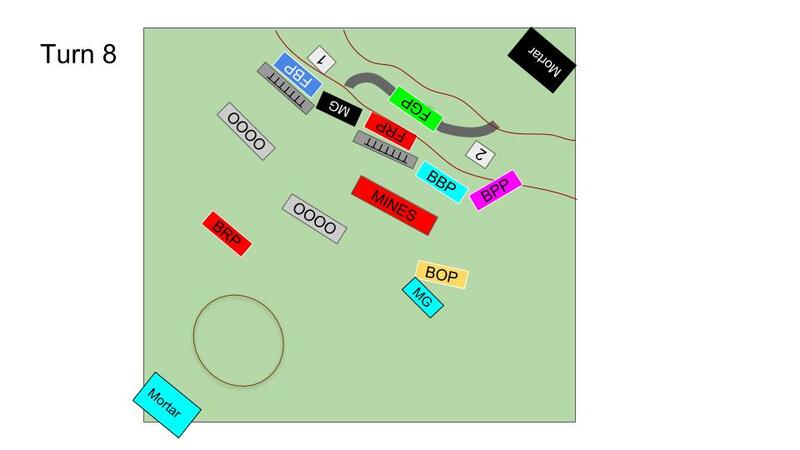 FBP and FRP both move up to the barbed wire, stopping in base contact with it. 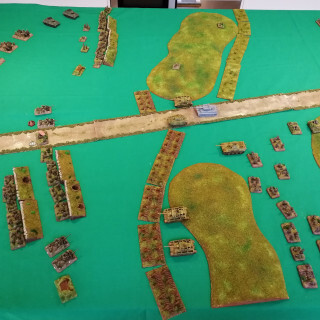 The MG team advances up the road while the 1iC Panther moves across to the German left flank to focus the attack there while also gaining cover from the hill from the British artillery. 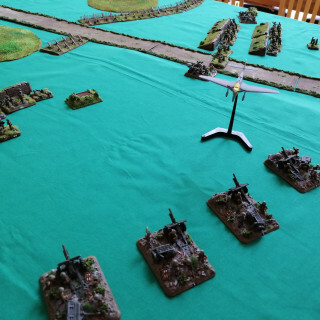 As the two stukas dive on British Artillery, the AA guns on the M10s try to stop them. They successfully bring 1 Stuka down but not the other one who is able to drop its payload, destroying another artillery unit. The 7.5cm guns continue to bombard the British MG and 6pdr teams. Again they hit but fail to cause any damage but this does keep the pinning in place. The 1iC Panther also fires on the 6pdr team hitting but failing to punch through the dug in defences. 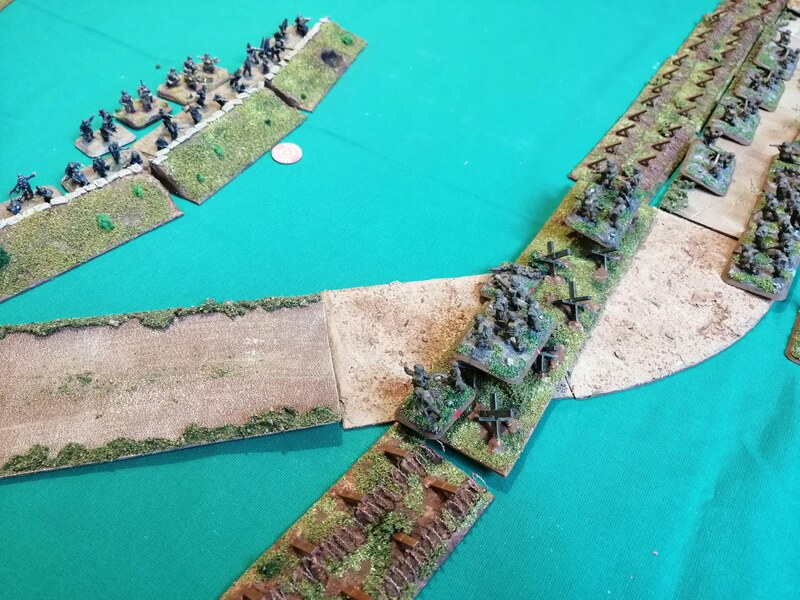 The small arms fire from FRP and FBP fail to cause any damage to the British line. The German attack is currently failing to find a way through the British defensive line and is stalled at the barbed wire. 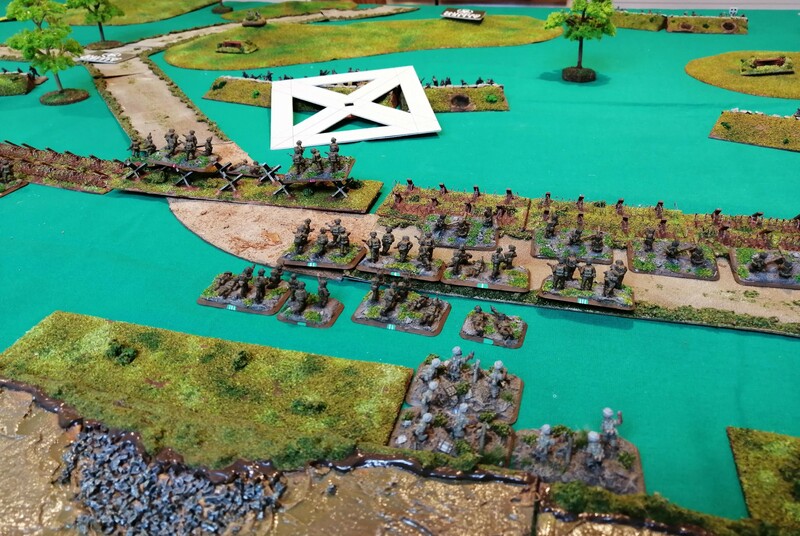 The British fail to unpin their gun teams and again refuse to move any units. The Sniper again hits but fails to wound. Both HMG nest 2 and the 6pdr guns fire on FRP sat just in front of the barbed wire. 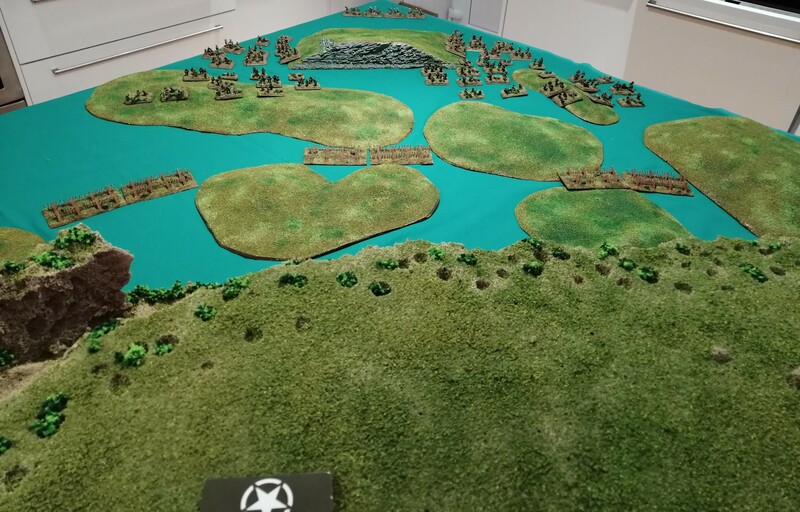 Together they score 5 hits and destroy two units, pinning FRP in place. BRP scores 5 hits but no wounds against FBP which pins them in place. The MG Teams fire upon their counterparts, destroying 1 unit. The rest of the British shooting fails to cause any damage beyond pinning FRP in place with weight of fire. The Naval bombardment catches the 7.5cm teams and pins them in place. 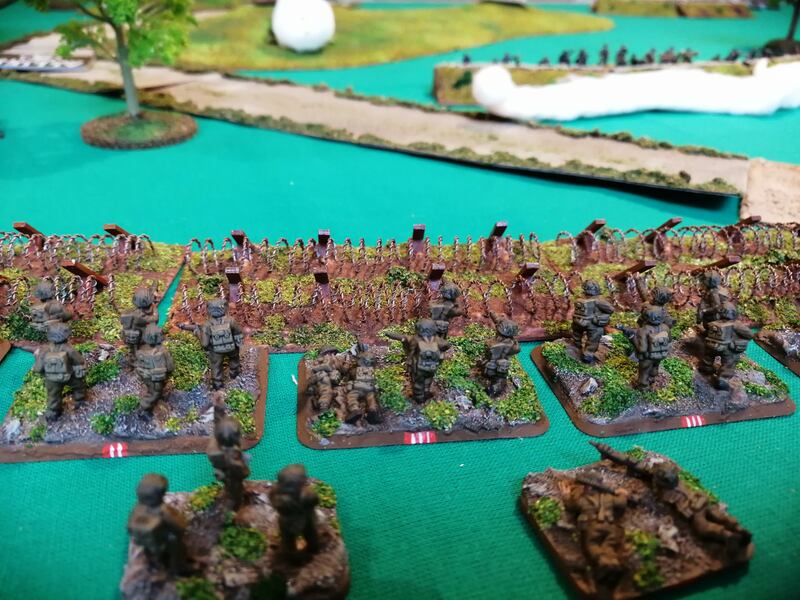 The Germans are able to unpin Red and Blue platoons as well as the 7.5cm gun team. Green platoon remains stubbornly pinned in place however and unable to advance for another turn. 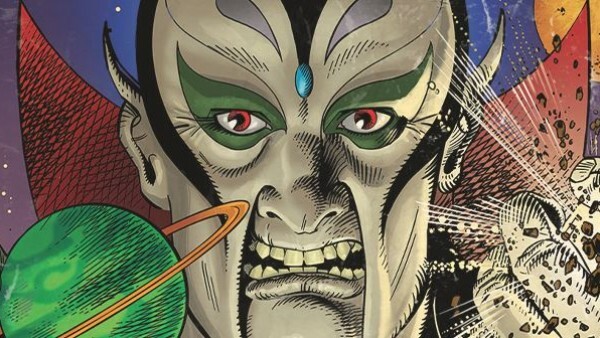 The last remaining MG team fails its morale check and is removed from play. 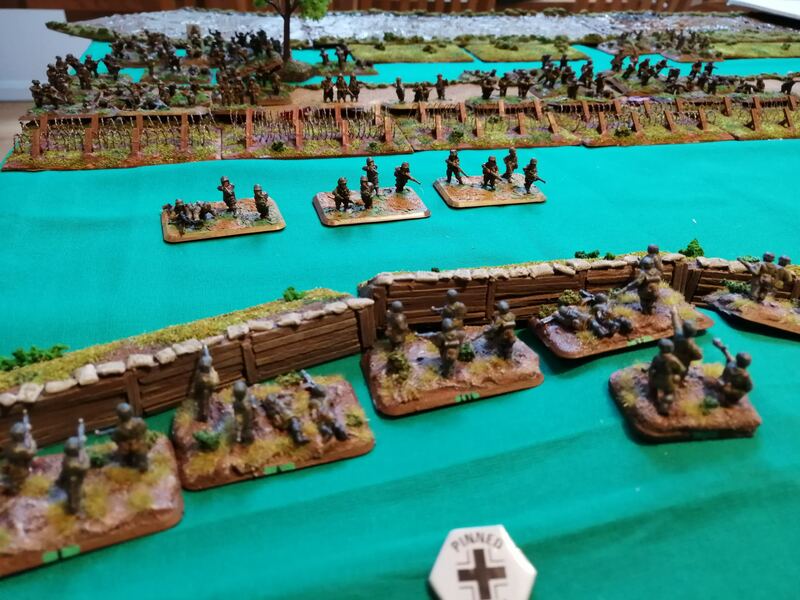 Both Blue and Red platoons try to gap the barbed wire. Blue succeeds and opens up the terrain in front of them to allow an advance toward the British trenches. 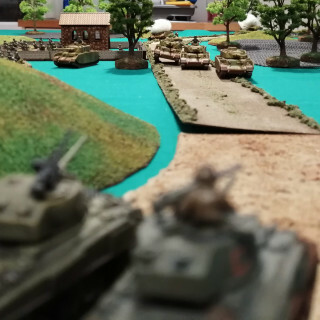 The 1iC Panther advances up alongside Red and Blue Platoon and fires unsuccessfully on HMG Nest 2. Another wave of Stuka bombers arrive and successfully destroy another artillery gun and pins the last remaining gun in place. 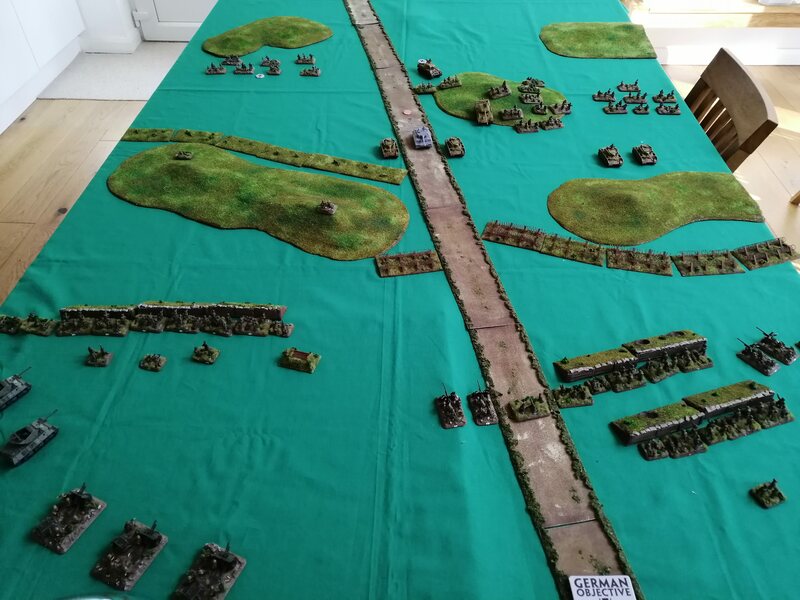 But that’s all the Germans can manage this turn, the attack has almost run out of momentum. 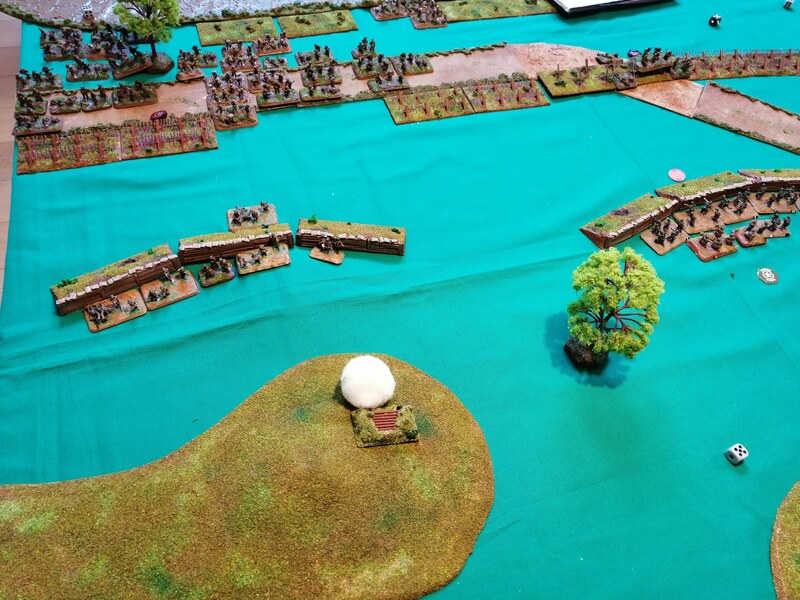 The British start their turn by having the last remaining artillery gun fail a morale check and leave the battle. This puts a dent in their hopes of stopping the last remaining Panther. To further add to the problems, both the MG team and 6pdr teams fail to unpin, restricting their firepower again this turn. 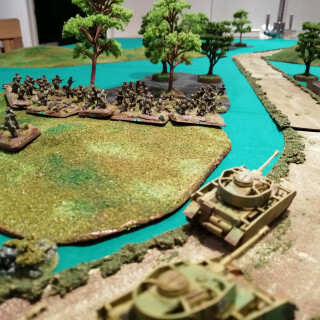 The M10s begin to move over to the British right flank behind the HMG nest, looking to open up an angle on the Panther which they cannot achieve this turn. The 6pdr teams fire on the Panther hitting twice but the shells bounce harmlessly off of the thick armour. The MG team, Red Platoon and HMG nest 1 all fire upon FBP. 8 hits are caused in total pinning FBP but these hits only convert to 2 kills. Meanwhile, nest 2 fires upon FRP hitting 4 times and causing another kill. Best read in reverse order. FGP fails to unpin and remains face down under the threat of the hidden sniper. The bailed Panzer IV is able to remount but the bailed 1iC Panther fails to remount. All units continue to advance up the board but the 7.5cm gun platoon starts to take a more central position. A good roll for the Luftwaffe sees another wave of Stukas arriving this turn. The AA fire from the M10’s fails to hit and the Stukas drop their bombs on the Artillery Battery, destroying one gun and pinning the remaining unit in place. The Tiger and the Panzer IVs fire upon MG Nest 1 but despite 3 hits, fail to destroy the nest. 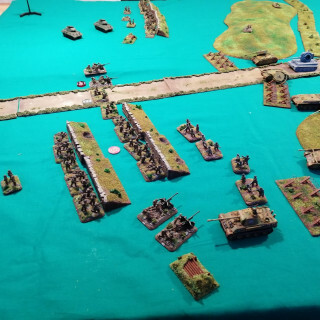 At the start of the Allied turn, the artillery battery unpin and are able to launch a new bombardment, this time on a Panther and 4 teams from FBP. 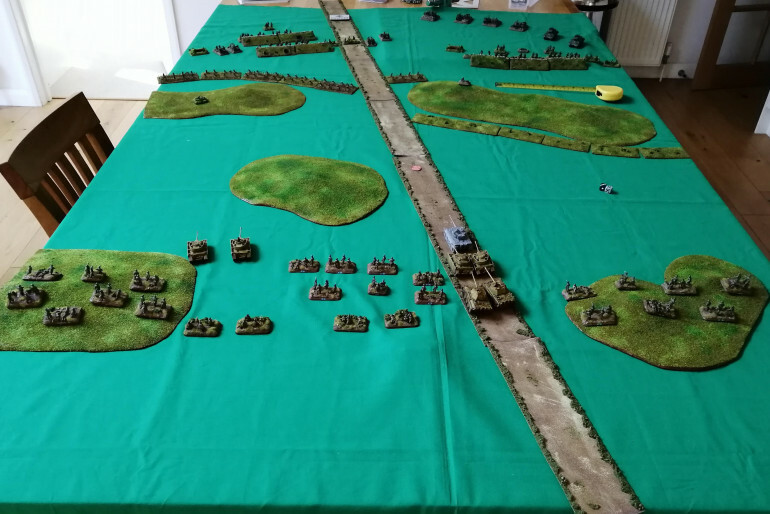 The artillery ranges in first time and successfully destroys one team and pins FBP in place. The Sniper continues to cause FGP probleme#s, hitting again but failing to cause any damage. It does keep FGP pinned in place and held up on the German Right flank. The lead tanks are now in range of the 6pdr guns just off of the road. With each gun able to fire 3 times, they score 4 hits, 2 on the Tiger and one on each Panzer IV. The shots aren’t enough to worry the Tiger however one of the Panzer IVs bail out. 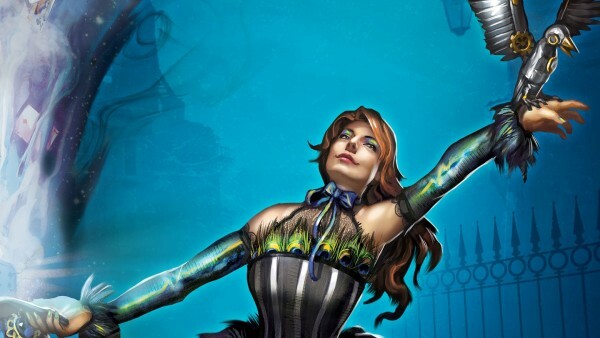 FBP unpins and is able to advance out of the ranged in artillery. FGP fails to unpin and remains trapped in front of the Sniper on the hill. The lone sniper is really pinning down the German right flank. The bailed Panzer IV remounts however the 1iC Panther fails to remount and remains out of action for another turn. 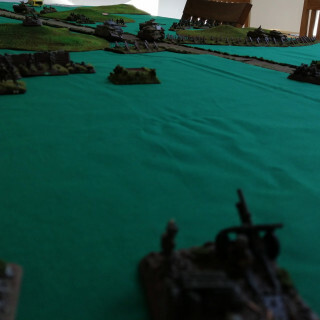 There’s no Stuka this turn however the tanks begin their advance. 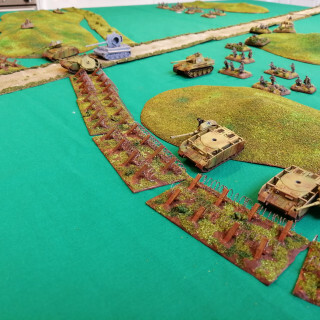 The Platoon of 2 Panzer IVs draws up to the barbed wire looking to cross it next turn. The 7.5cm guns remain stationary on the hill and prepare to bombard the Allied lines. The remaining infantry advance up. 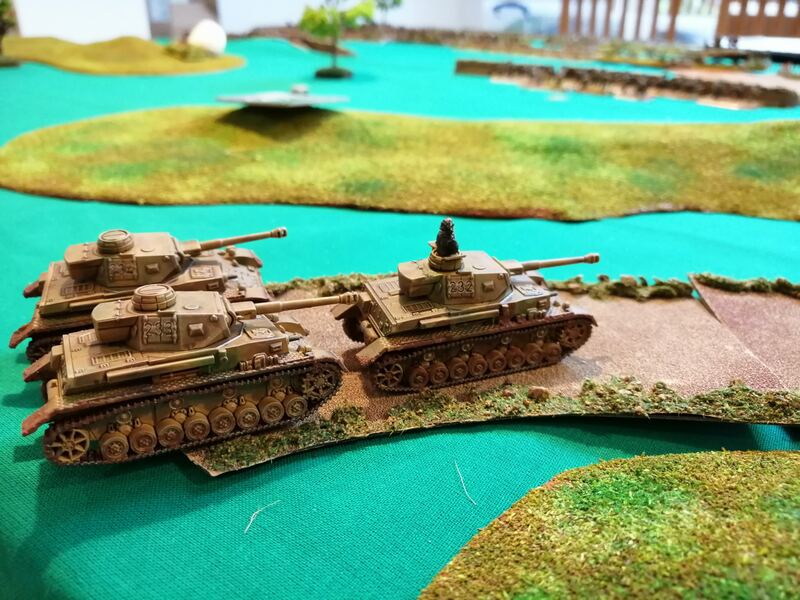 The Tiger and the Panzer IVs fire on the 6pdr gun teams. 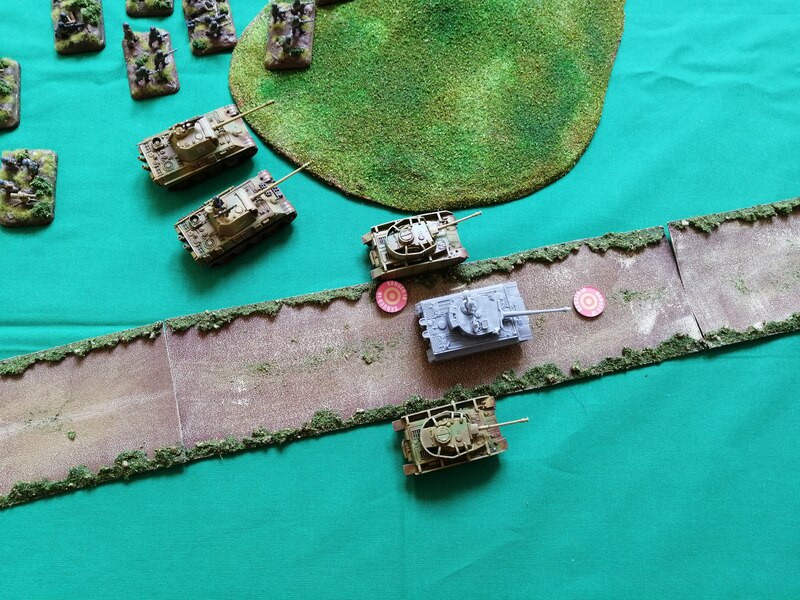 The Tiger misses while the Panzer IVs hit but fail to wound thanks to the guns being dug in. The two 7.5 cm guns bombard the MGs and 6pdr by the road. Despite being just two guns firing, they manage to hit an MG team and pin the MG unit in place. The British begin their turning by targeting the threat of the two Panzers and the barbed wire. The two 6pdr guns on the right fire upon the Panzer IVs at the barbed wire. They score 3 hits which quickly convert into two destroyed tanks. The 6pdrs next to the road fire upon the Panzer IVs advancing toward them down the road. They successfully bail one Panzer IV. The M10s can’t see the Tiger as it is behind one of the Panzer IVs but they can shoot at the IVs. They apply their 4 shots effectively, hitting twice and destroying both Panzer IVs. One of the 5.5” artillery guns can draw a bead on the Tiger and lowers its gun to fire direct. It has just one shot but makes it count, punching straight through the front armour and destroying the Tiger with a single shot! So in just one turn of shooting, the German tank capability has been significantly reduced – great gunning by the British anti tank crews! The naval gun fire falls well behind the German advance and causes no damage this turn. Firstly, apologies for the barely painted Stuka and unpainted Tiger 1. The Stuka is now finished but the Tiger is in the painting queue – I just didn’t have a painted one to use. 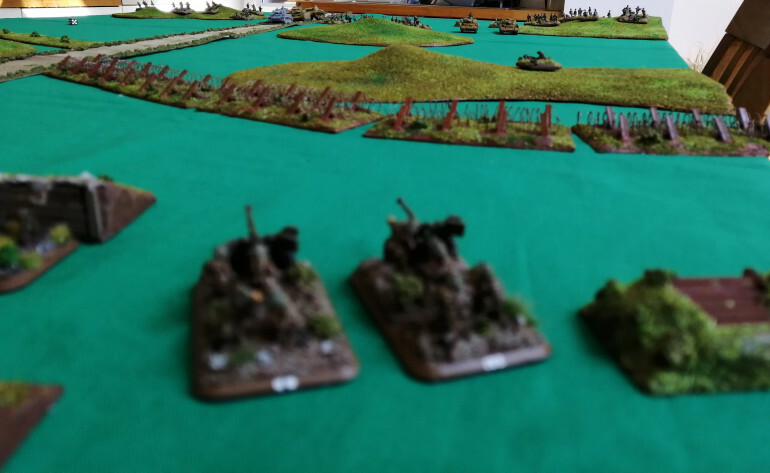 This was a short turn as the Germans just advanced. Where possible, the tanks moved at dahs speed. The Luftwaffe failed to turn up in turn 1 leaving the British unmolested. Everyone was out of range to fire and the British refused to move out of their positions and so no shooting took place. 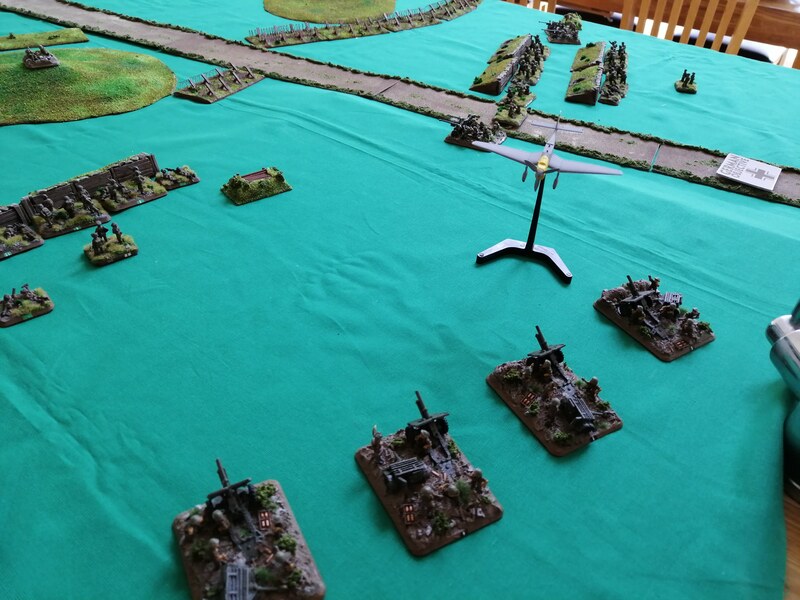 The Luftwaffe put in an appearance this turn and the Stuka decided to make a run at the British artillery. 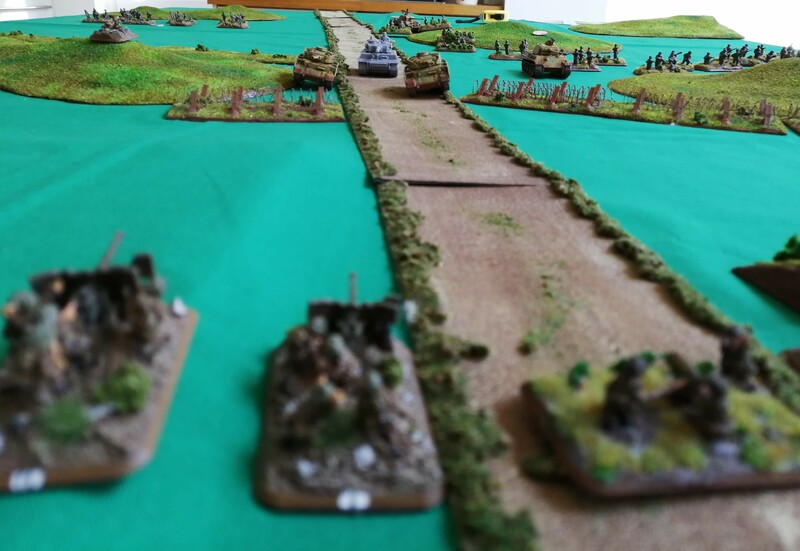 Otherwise, the entire German line continued its advance up the board. With the British lines drawing in range, the tanks moved at standard speed to apply some fire. With nothing else to shoot at, the M10’s turned their AA MGs to the skies to shoot at the Stuka bombers. They were able to apply enough fire to deter one bomber from arriving but not enough to stop the other. The Stuka unloaded on the artillery unit hitting one gun team. Being dug in, the gun team was able survive the attack but this does pin the artillery. The Tiger turns its gun on the HMG nest next to the road and is able to hit the target but the heavy protection of the nest is able to shrug off the hit. 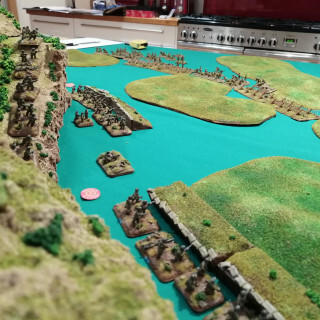 The British don’t move so we go straight to the naval gunfire support. 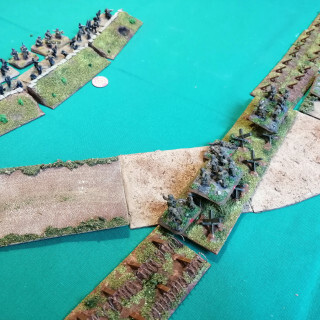 The 8d6 less 8” comes up with a 29” distance from the German table edge. The width comes up with 24”. 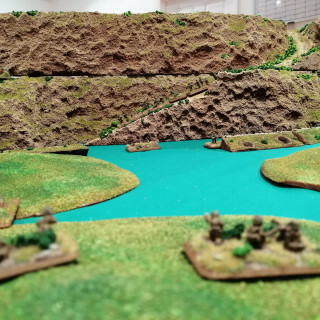 This lands just behind the Tiger, so great shooting from the Allied naval fleet! The shot hits the 1iC Panther, the Tiger and both Panzer IV’s but thanks to some good armour saves, only succeeds in bailing out the Panther and one of the Panzer IVs. The Allied big guns aren’t finished yet as the British Artillery unpin and begin to bombard the Tiger. 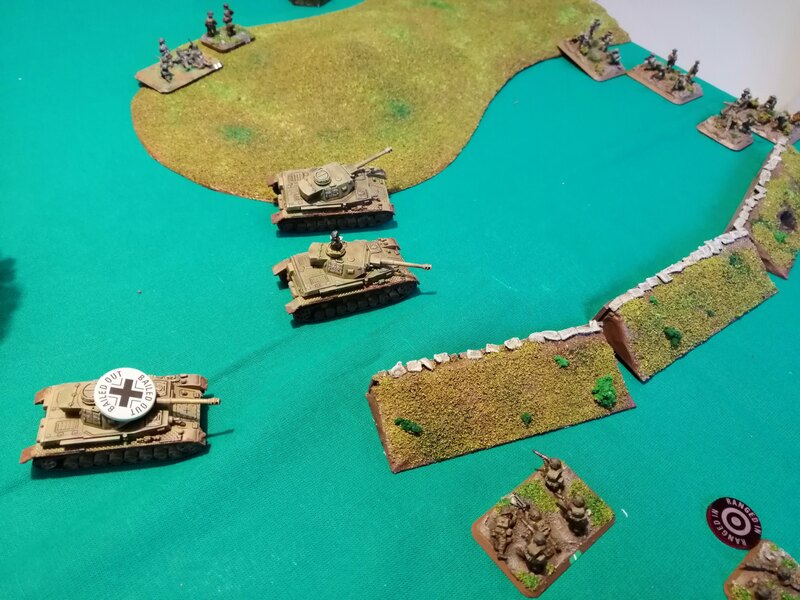 The shots land on target but the Tiger and Panzer IV pass their armour saves. 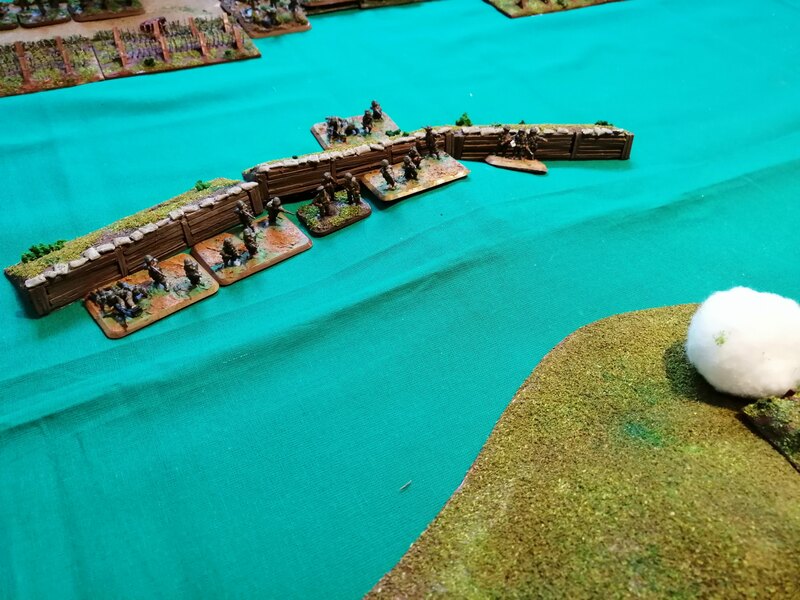 The British deploy their sniper from ambush on the hill behind the minefields. Fallschrimjager Green Platoon is in range and the sniper takes aim, hitting the leading squad. The squad saves, so no damage done but this is enough to pin FGP in place. 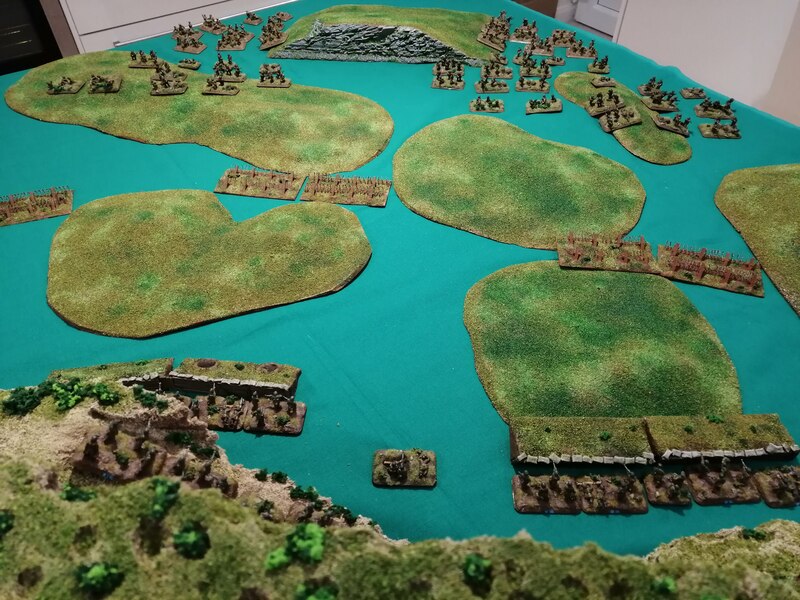 For this battle, we’ll take a semi historical perspective and inject a little ‘beer and pretzels’ gaming. Operation Fischfang was a German Counter Offensive against the Anzio beach landings in February 1944. This battle will focus on the final push as the German 26th Panzer Division came close to pushing the Allies back to the landing beaches. 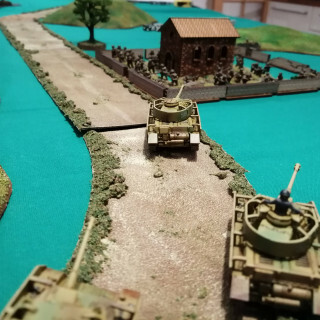 The counter offensive was launched down the Via Anziate, the main road running South from Campoleone and the 26th Panzer were able to include some new Tiger I tanks alongside a battalion of Panthers, so a good opportunity to bring out the big cats! The Luftwaffe also ran near continuous air attacks during the offensive, so this will need to be represented in the game. The offensive was hugely costly for the Germans and by the time they reached the last Allied line of defence, their casualty rates were running high. To represent this, we will run mixed platoons of tanks and platoons with reduced numbers. 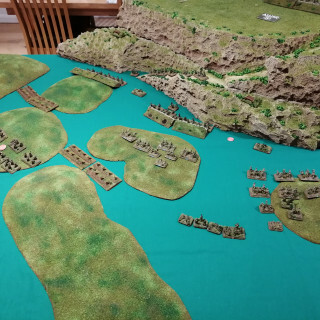 For the Allies, historically it was the naval support coupled with artillery units firing over open sights that actually stopped the offensive. These will need to feature in the battle. For this battle, they will be kept simple. 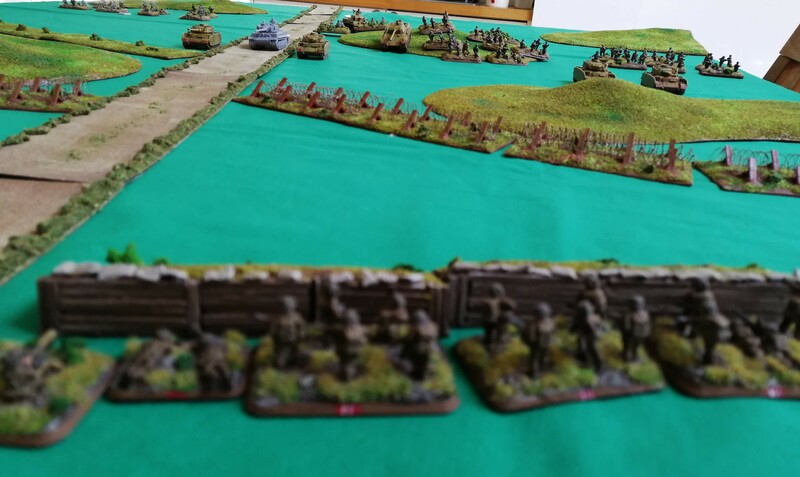 The Germans are looking to break through to the beach and so an objective counter is placed 6” from the Allied table edge on the Via Anziate. 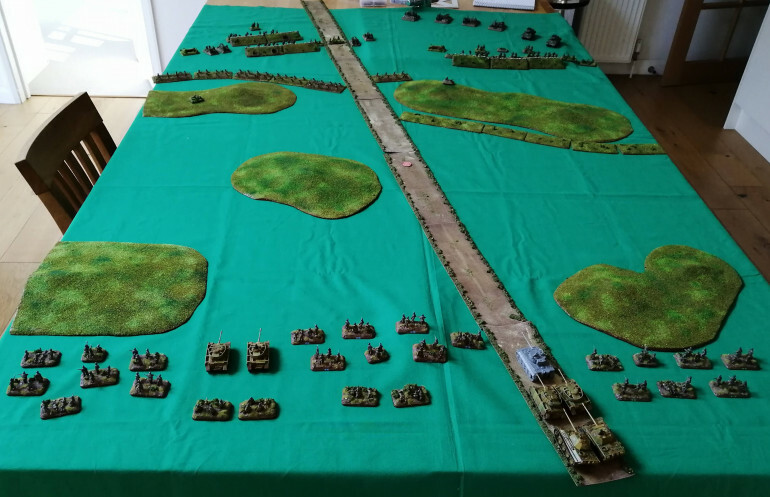 If at the start of any player turn a German unit is within 4” and no Allied unit is within 4”, the German player wins. The Stuka appears on a roll of 5+ and is deployed in the movement phase. It cannot attack if there are German forces within 16” of the intended target. 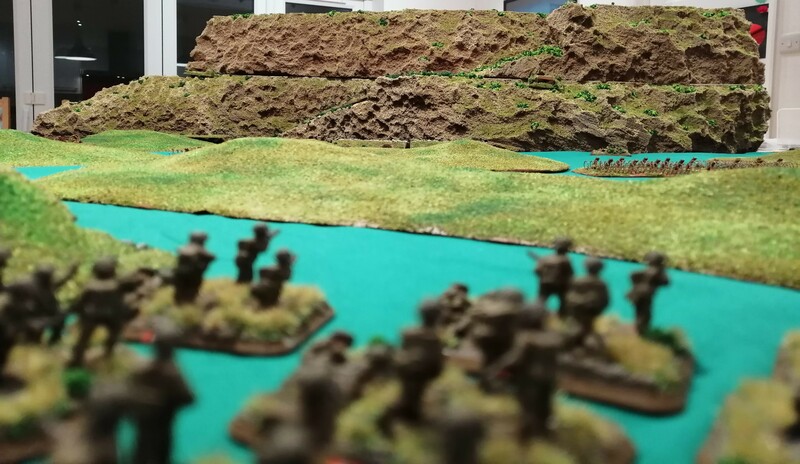 The early spring rains had started and the battlefield was getting turned into a quagmire. Any movement not on the road is in ‘area terrain’ for the purposes of movement rates. Furthermore, tanks and vehicles must roll a 2+ each time they move otherwise they become bogged down for the turn and unable to move. 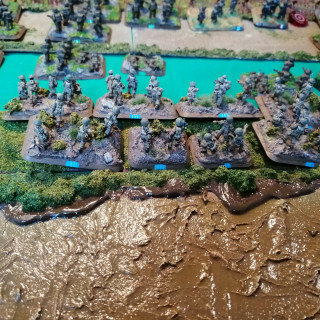 The heavy rain stops all Movement Orders as defined in the FoW rulebook. No artillery attacks in round 1. British Artillery have ranged in on the road prior to the battle. A ranged in marker can be placed anywhere on the road and no spotter is required to fire on this point. On even numbered turns, at the start of the Allied turn the naval bombardment arrives. This is randomly placed on the table and cannot land in the Allied half of the table. To randomly generate the landing point, 8d6 less 8” are rolled to determine the depth from the German starting edge. 10d6 less 10” is used for the width. Using a standard template, everything under it is automatically hit with a AT5, FP 2+ shot. Infantry saves are taken as normal. I’ve tried to use the standard NATO symbols where possible. 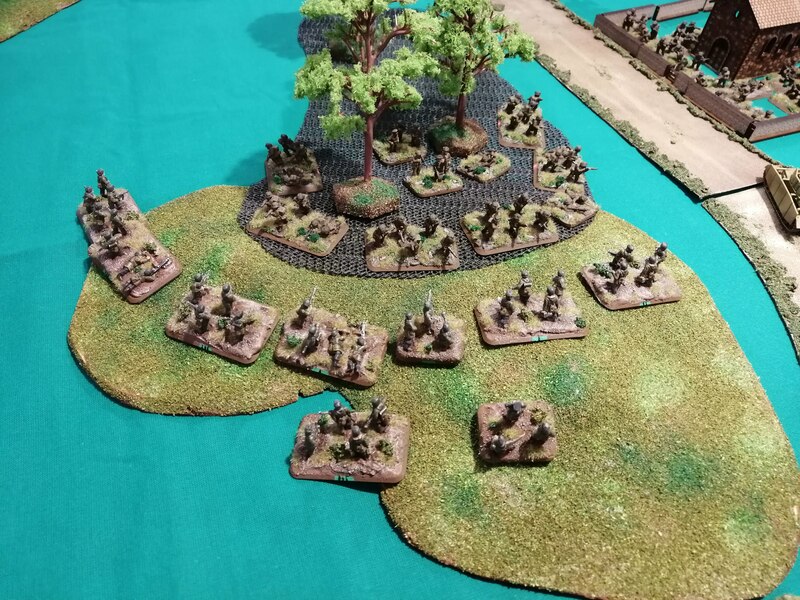 Infantry platoons are colour coded to the platoon with Fallschirmjager platoons starting F and British 1st Division starting B. Boxes marked 1 and 2 relate to the MG Nests. Boxes containing OOO are barbed wire. Boxes containing TTT are trench lines. White background tank units are German. The one containing the red circle is the 1iC and 2iC Panther tanks. 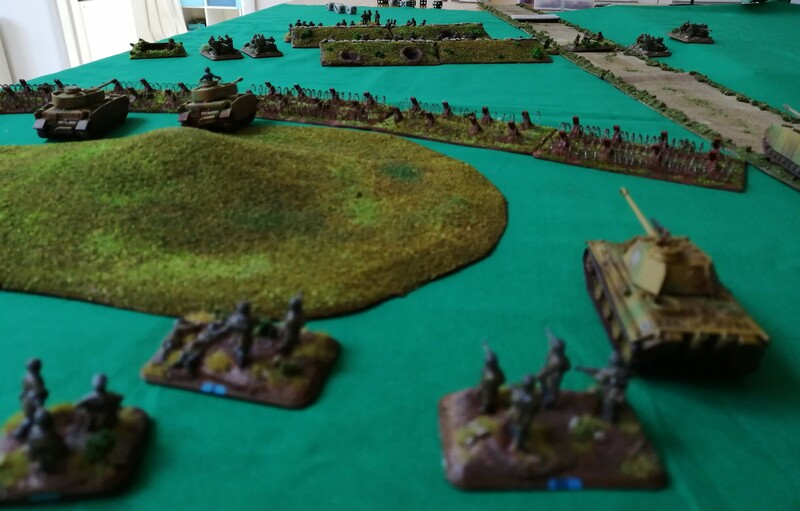 Unit with the heavy circle is the panzer platoon containing the Tiger 1. Pictures of the initial deployment can be seen below. The US II Corps had taken heavy casualties during the first Battle of Monte Cassino and were withdrawn to allow for reinforcements to arrive and for the two Divisions, (34th and 36th) to take some much needed rest. II Corps was replaced by the New Zealand Corps, transferred from British 8th Army. The New Zealand Corps (NZ Corps) was commanded by Lieutenant-General Sir Bernard Freyburg and consisted of the 2nd New Zealand Division and the 4th British Indian Division. The NZ Corps was however formed in a somewhat ad hoc way and had no formal Corps HQ, with the 2nd NZ Division HQ performing both the Divisional and Corps HQ tasks. Upon arrival, the NZ Corps were well aware of the difficulty of the task that they faced but were strongly pressed to launch a new offensive as quickly as possible to try to breakthrough to the now severely under pressure beach head at Anzio. This lack of planning was far from ideal however 2nd NZ Division, containing two Infantry and one armoured Brigade, was considered ideally suited for achieving a break through. Freyburg had originally planned an attack to loop around Cassino from the East and encircle the defenders. The mountainous terrain and lack of easy access required the attackers to rely on mules to carry supplies and this was something not in ready supply. In the end, Freyburg settled for a plan similar to that enacted by the US II Corps just a few weeks earlier. 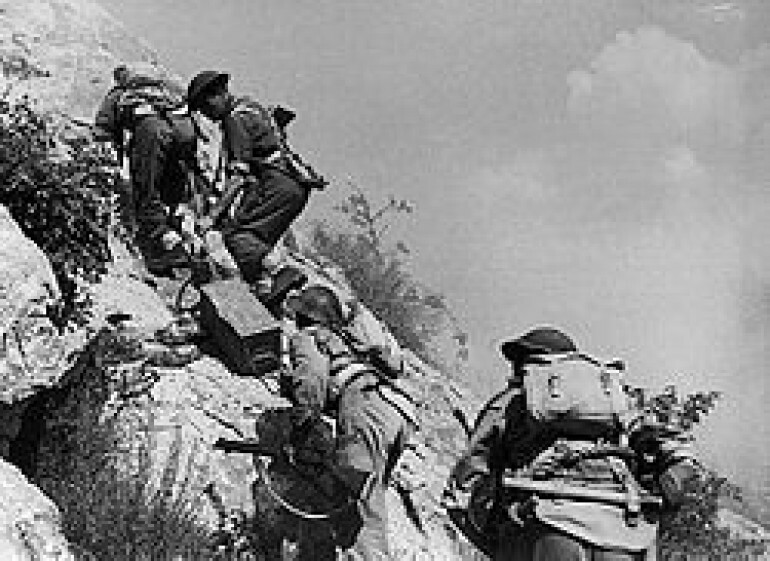 The 4th British Indian Division would attack up the hill to the East of Cassino and then turn West to tackle the Monastery whereas 2nd NZ Division would attack across the plains of the Garigliano and Rapido and assault the town of Cassino directly. Brigadier Dimoline, acting commander of the 4th BI Division, was sceptical of the plan and insisted that the monastery be bombed before any assault could be undertaken, believing it impossible for a defending army to not be using it for protection. Unbeknown to the Allies, the Germans had agreed not to occupy the monastery and use it as a defensive position. It was General Alexander, the Army Group commander, who eventually agreed to the plan to bomb the monastery and so on the 15th February 1944, in one of the most controversial Allied actions of the Italian campaign, Allied bombers flew over the monastery. 142 B17 Flying Fortresses, 47 B-25 Mitchells and 40 B-26 Marauders flew sorties over the monastery and dropped an estimated 1,150 tonnes of explosives. Between the bombing runs, Allied artillery pounded the hill top relentlessly. The following day, Allied artillery continued the pounding while fighter bombers flew repeated sorties to bomb the hill top. By the end of the second day, the monastery was a smoking ruin, a few shattered walls remained, poking up between the rubble. Following the bombing, Pope Pius XII remained silent on the matter. However some Cardinals and other members of the Catholic church were less charitable and were scathing in their condemnation of the bombing. Investigations following the bombing suggest that the only people killed at the monastery were over 200 civilians and monks taking refuge. No evidence has ever emerged that the Germans used the monastery for any military activities prior to the bombing and that all of their defensive positions were outside of the walls and lower down the slopes of Monte Cassino. Those that survived the bombing fled the ruins and monks led a number of the wounded down the slopes to German first aid posts. From there, the German troops transported the wounded to field hospitals further behind the front line. The entire bombing campaign had been planned by the Allied Air Staff and had been viewed as a separate, independent operation. As such, little coordination had taken place with the troops emplaced around Cassino. At the conclusion of the bombing, NZ Corps had only been in place for a few days and were not ready to launch an assault. This complete lack of coordination would prove to be costly for the Allied forces. With the destruction of the Abbey, the German army no longer felt an obligation to keep their agreement to remain outside of the monastery. 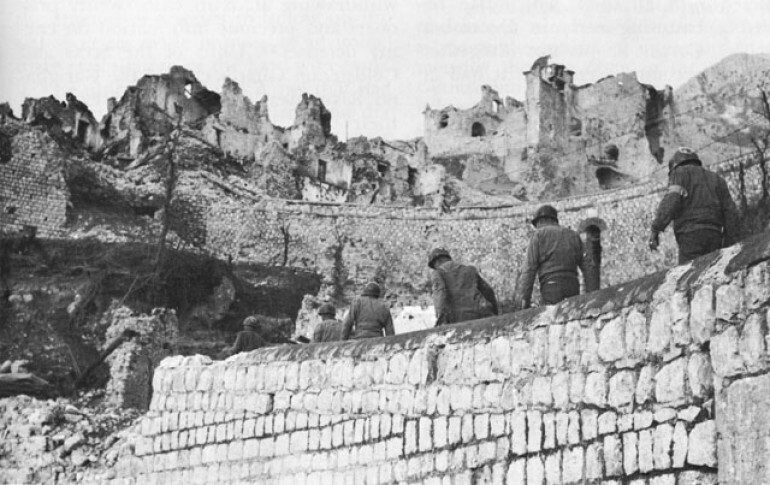 Troops from 1st Fallschirmjager quickly moved into the ruins and began turning them into a fortress and observation post. The Allied bombing campaign had only succeeded in handing the Germans a more defensible position and make the taking of Monte Cassino harder. In the days prior to the bombing, the 4th British Indian Division had crossed the Rapido and had been slowly advancing up the slopes to the East of Cassino. They then turned Westward and fought their way along the hill tops toward Monte Cassino, taking almost the same route that the US 34th Division had taken. By 16th February, the 4th BI had advanced to Snakeshead Ridge and were in sight of a key German defensive position, point 593. Just 70m separated the Allied troops from point 593. As night fell on the 16th, a company of 1st Battalion Royal Sussex Regiment were ordered to attack. 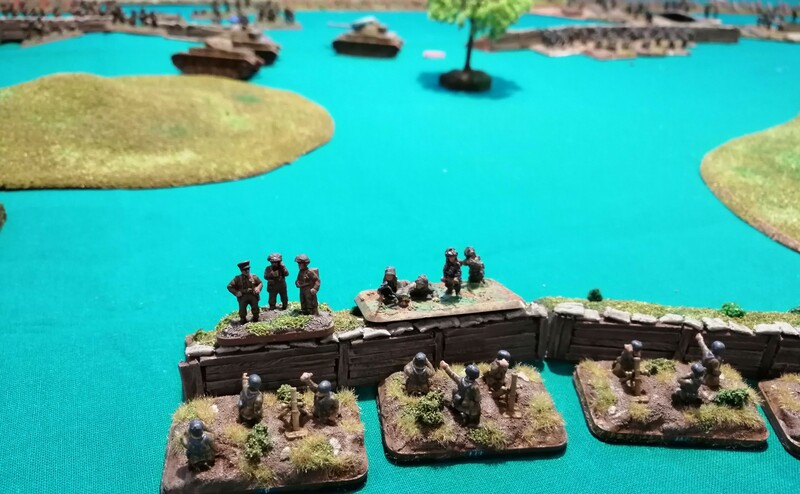 Despite the ground being rocky, there was little cover and any sign of movement was fired upon by the defending Germans. Additional defensive points were also able to lend their support to point 593 and the assault ultimately failed, with over 50% casualties. 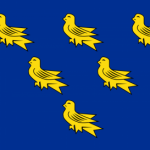 The Royal Sussex Regiment were ordered to attack again on the night of the 17th. The attack was proceeded by an artillery bombardment but, unfortunately for the 4th BI, to hit the monastery, Allied artillery shells had to fly very low over Snakeshead Ridge, with many shells landing among the British troops trying to advance. Despite this, the Royal Sussex Regiment attacked at midnight and managed to reach point 593. 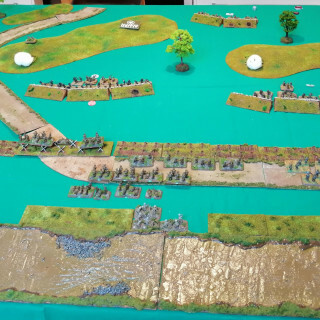 The fighting was brutal, bloody and often hand to hand however the defenders of the 1st Fallschirmjager just managed to cling to their defensive positions, beating back the Royal Sussex Regiment. The following night, the main attack was launched along the width of the hill top. The Rajputana Rifles took up the assault against point 593 from the Royal Sussex Regiment, the remnants of which were held in reserve. The 9th Gurkha Rifles were ordered to take another main German defensive point while the 2nd Gurkha Rifles were to directly assault the monastery. 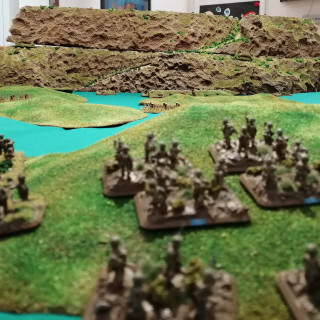 The terrain was far from ideal for such an assault but it was hoped that the Gurkha’s mountain training would stand them in good stead. The hopes proved faint and despite valiant efforts across the entire front, the 4th British Indian failed to make further ground. The assault was eventually called off with casualty rates running at close to 50%. The second part of Freyburg’s plan was being enacted in the Rapido valley at the same time as the 4th British Indian were struggling in the hills above. 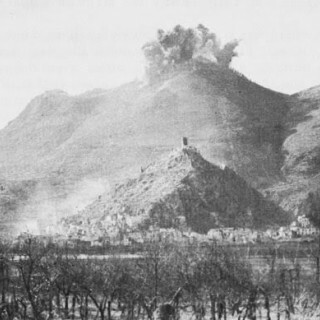 2nd NZ Division attacked across the plains toward the town of Cassino. On the night of the 17th February, two companies from the 28th NZ (Maori) Battalion advanced along the raised railway track into the town. The advance was hard going as German mortar teams had targeted in on the route while every bridge had been removed. Behind the Maori’s, NZ engineers worked relentlessly to rebuild the bridges to allow the armoured brigade to advance and support the infantry. 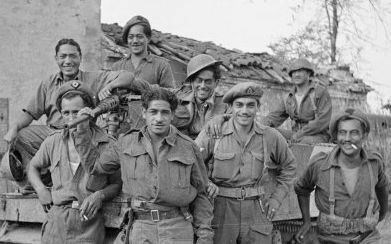 Despite the odds, the Maori’s fought their way through to the railway station in Cassino but by day break, they found themselves isolated. 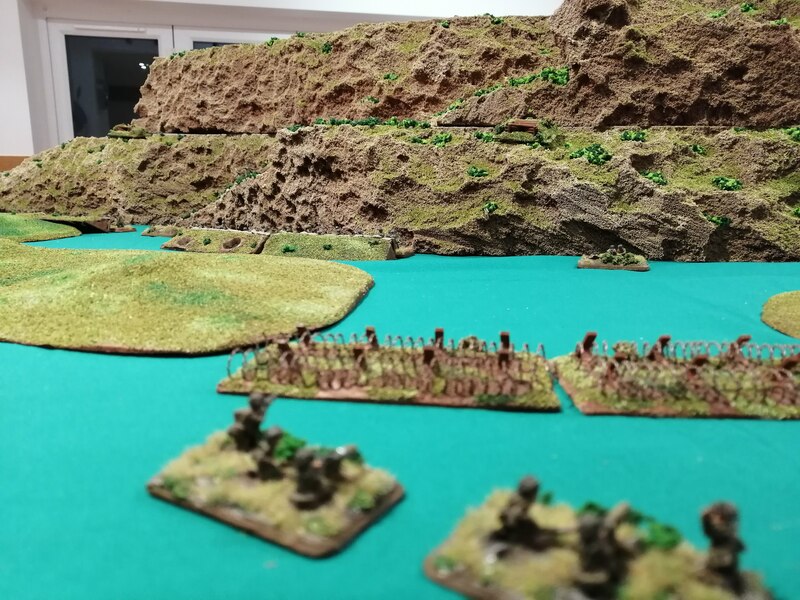 A near constant smoke and artillery barrage from the Allied artillery allowed the Maori’s to hold their position for much of the day despite constant German counter attacks. Toward the end of the 18th February, the Germans counter attacked with 2 panzers and, with no anti tank guns and with no further likelihood of advancing, the Maori’s were ordered to withdraw. 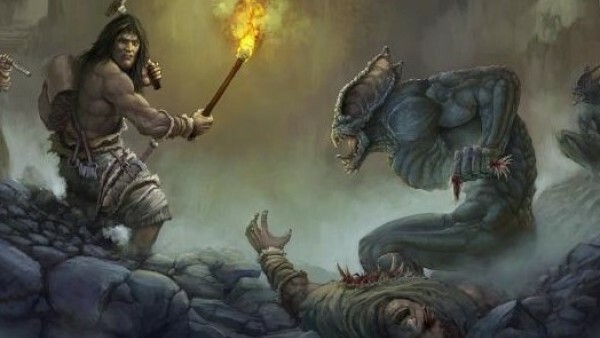 The Maori’s suffered 60% casualties in the assault and had advanced far further than the defenders had imagined possible. Kesselring is recorded to have expressed surprise that their counter attack was able to succeed and the belief on the German side was that Cassino might have to be surrendered. The second battle of Cassino had come at some cost to Freyburg’s NZ Corps. An estimated 800 casualties had been sustained during the assault. Unknown to the Allies, the German defenders had suffered far worse. By the time Freyburg had called off the assault, the defenders had lost an estimated 4500 men and were in no position to see off another assault. Had the Allies prepared and coordinated better at the outset of the assault, it’s feasible that they could have broken through. Unable to do so, both sides settled back to rebuild and reorganise. Heavy rains and flooding in the Rapido river valley also made further assaults highly problematic for a few weeks. 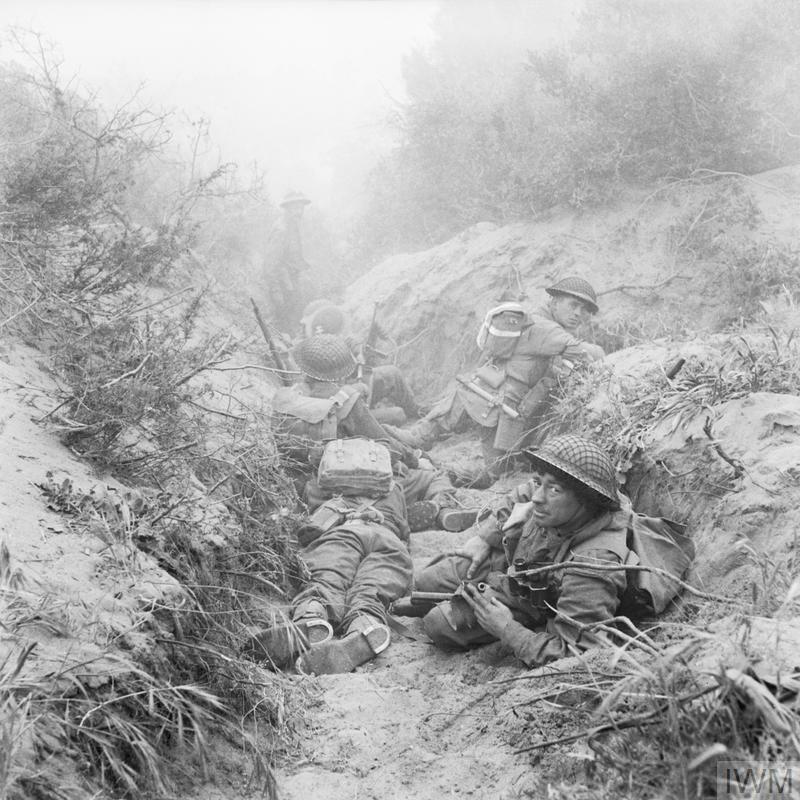 The initial counter offensive by the Germans against the British 1st Division at Anzio had pushed the British out of their salient and back to the positions held before their break out attempt. This line stabilised for a few days as both sides dug in although continued to test each other’s defences with minor assaults and aggressive patrolling. On 16th February, the Germans launched a new offensive codenamed Operation Fischfang. 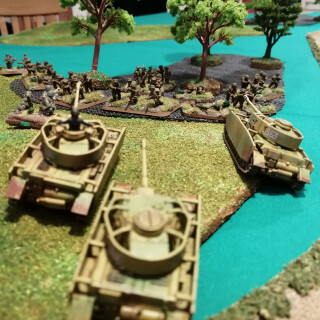 Their assault was once again launched down the Via Anziate and included a number of newly arrived Tiger tanks as well as several platoons of Panthers. The German attack punched through the British 1st Division’s defensive line, causing significant losses to the defenders. The British defensive line continued to crumble as the Germans pushed further South. Two days later, the Germans had almost reached the original Allied beach head and were assaulting the last defensive line. A number of assaults were launched against the last Allied defensive line between 18th and 20th February and included constant support by the Luftwaffe. The Germans came so close to pushing the Allies back into the sea that Allied artillery ended up firing over open sights at the advancing German tanks. Accurate gunning coupled with the punishing bombardment from the Allied Navy just offshore, eventually halted the German advance. The German advance had come at some cost, with an estimated 5,500 casualties whereas the Allies had suffered some 3,500 casualties. With the German army exhausted, they began to dig in around the Northern part of the Anzio beach head and rebuild their forces. Hitler however had other ideas and ordered Kesselring to continue the assault. 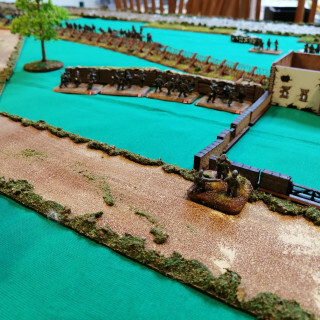 Against both their better judgements, Kesselring and Von Mackensen started another assault on 29th February against the US forces dug in around Cisterna. The US held their ground and rebuffed the Germans who lost a further 2,500 casualties. With both sides now exhausted and with the Spring rains turning much of the battlefield into a quagmire, both sides dug in to wait for late spring. 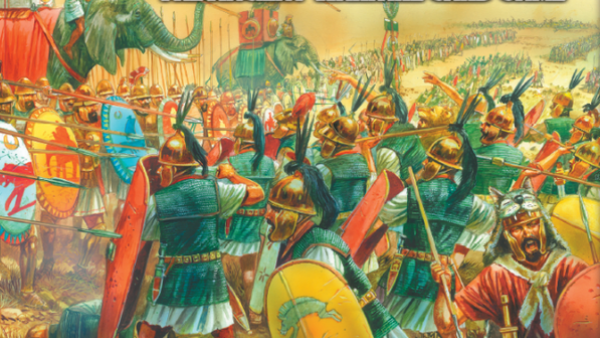 Lucas was given scant resources to create a stable beach head and had even less chance of delivering on his objective of going on the offensive and driving toward Rome. This did not however stop Allied commanders from being critical of his role, with Churchill himself being particularly vocal in his disapproval of Lucas’ perceived passivity. General Alexander visited VI Corps HQ on 14th February to impress on Lucas that he should ‘break out as soon as tactically possible’. After his departure, Alexander commented that he felt VI Corps lacked the determination to deliver. Lucas saw the writing on the wall and commented in his diary on a number of occasions that Operation Shingle was not deliverable. His perception proved accurate as he was replaced on 22nd February by Lucian Truscott. 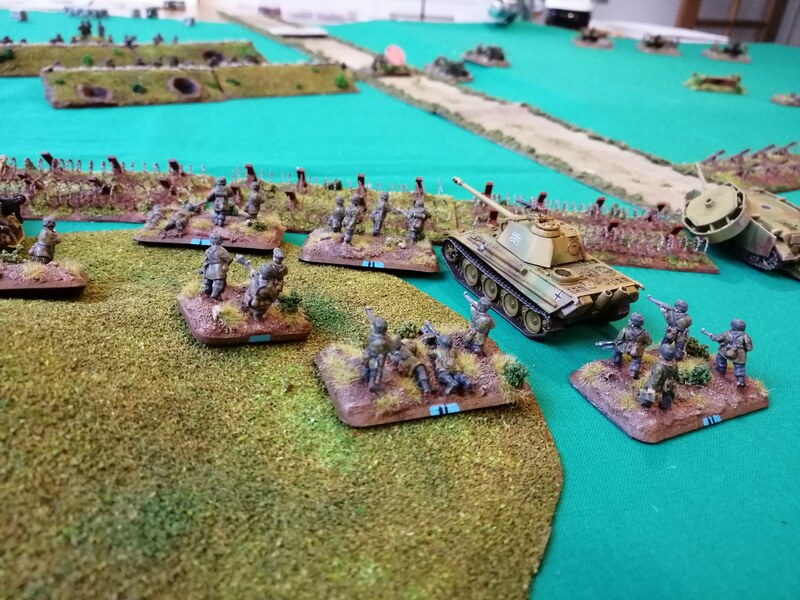 FBP are able to unpin and the last remaining tank from 1st Panzer passes its morale check (again! nerves of steel!) and is able to stay in the fight. 1st Panzer advances through the grounds of the chapel, up to the wall surrounding the grounds but fails to pass its crossing check. 2nd Panzer remains stationary to counter the now visible Shermans. FRP, FGP and FBP all advance up the battlefield, trying to remain in range of the retreating British. FGP fires upon SFOP causing 5 hits, it fails to cause any wounds but does pin SFOP in place. The Mortar team repeats its bombardment against SFRP and kills another team, and ensuring that SFRP remain pinned. The one remaining tank from 1st Panzer Platoon turns its MGs on the British MG team and is able to destroy both teams! That’s the first VP of the game awarded to the Germans for destroying a British platoon. 2nd Panzer, who remained stationary, makes good use of this extra aiming time and causes 3 hits against 1st Sherman Platoon. This cause 2 of the Shermans to bail out, leaving just one operational Sherman in the platoon. FGP launch an assault against SFOP. FGP loses another stand in the defensive fire but its not enough to stop the assault hitting home and SFOP loses another stand. SFOP counter attacks and is able to destroy two stands from FGP in a truly gritty combat. Undeterred, and overcoming the special British Bulldog rule, FGP are able to continue the assault and destroy a further stand from SFOP. SFOP decide to fall back after this as their casualties are mounting. Both of the bailed tanks in 1st Sherman are able to remount however the last remaining anti tank gun fails its morale check and is removed from the board giving another VP to the Germans. SFRP are able to unpin and can continue to keep moving. 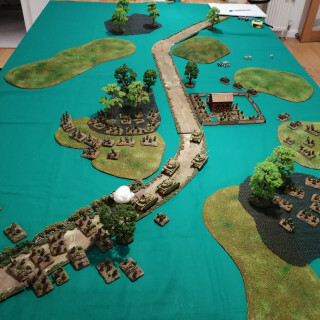 SFOP, having been reduced in numbers following the assault, fail their morale check and are removed from the battle giving a third VP to the Germans. 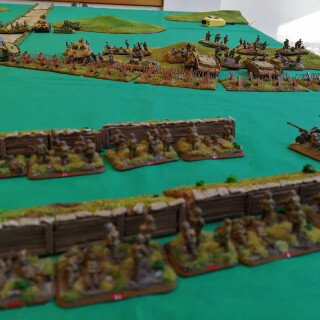 The remaining British infantry units continue to fall back. 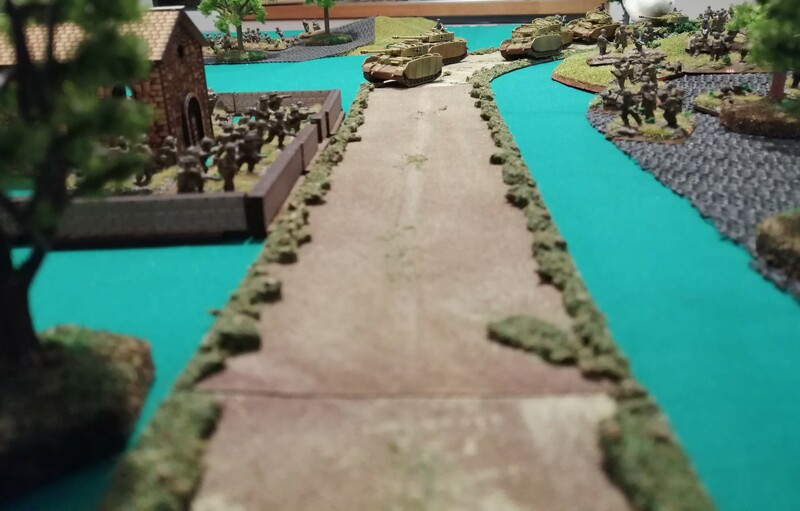 2nd Sherman Platoon advances to cover the infantry retreat whereas just one Sherman from 1st Platoon moves to draw lie of sight on the Panzers further down the road. 1st Sherman Platoon splits its fire with on tank firing its MGs on FGP but despite 4 hits, fails to cause any damage. The other two Shermans fire on 2nd Panzer, hitting twice but failing to penetrate or even cause the Germans to bail out from their tank. 2nd Sherman Platoon fires upon 1st Panzer and hits, causing the last remaining tank to bail out. 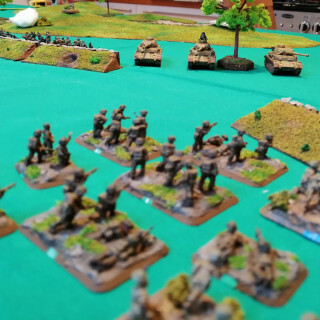 FGP passes its morale check and 1st Panzer remounts and also passes its morale check (yet again – surely some honour will be given to this tank crew?). 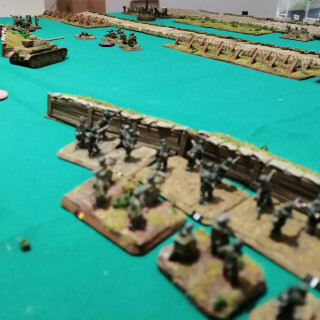 1st Panzer launches a blitz move, crossing the wall, whereas 2nd Panzer fails their blitz move but moves forward 10” under a standard tactical move anyway, trying to keep up with the retreating infantry. The remaining infantry platoons, including the mortar platoon (who are now out of range of anything useful) all advance southward. 1st Panzer fires two shots against 2nd Sherman and causes two tanks to bail out – great gunning from the last remaining tank in 1st Panzer! 2nd Panzer fires against 1st Sherman and scores 1 hit however this hit penetrates and destroys a Sherman. FGP fires upon the retreating 2iC and kills the 2iC. FBP fires upon SFRP, hitting twice and destroying one base. 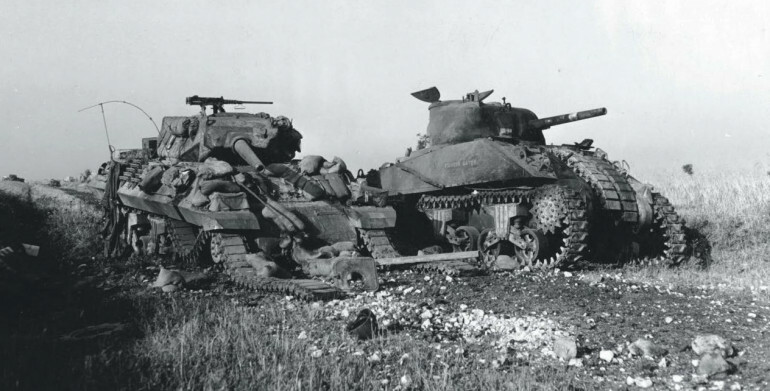 On the British turn, both of the bailed Shermans from 2nd Sherman Platoon fail to remount however the last remaining Sherman passes its morale check to remain in the fight. All of the British forces able to retreat do so and the Universal Carriers return to the extraction point and are removed from the battle. 1st Sherman are able to kill the remaining teams from FGP with their MGs. At this point, with the British turn spent and with most of the infantry team close or in the extraction zone, the battle is concluded. 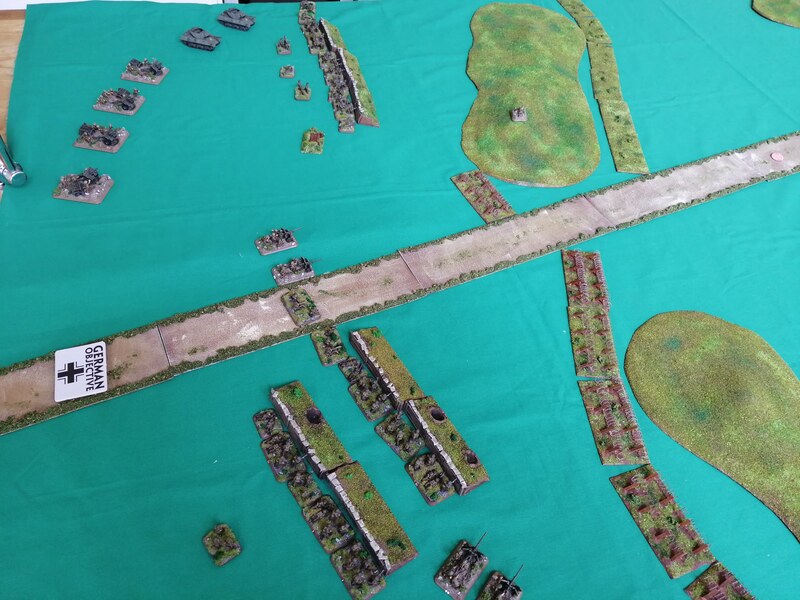 The Germans amassed 3 VP whereas the British were able to extract two depleted platoons, giving just 2 VP. So a narrow victory for the Germans and they can continue their squeeze on the salient. So in conclusion, a close win for the Germans. In hindsight, the Germans could have perhaps used their Panzers more effectively. Fire should have been focused on the Anti Tank guns much earlier to neutralise this threat. 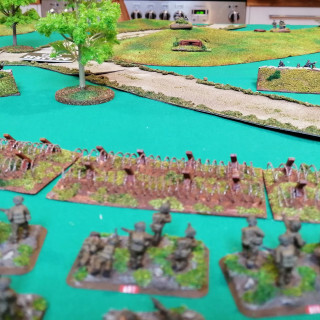 It could also have been sensible to split the Panzers with one platoon supporting the assault into the woods to dislodge the British earlier. From the British perspective, what would have happened had they not retreated? Despite losing a 6pdr, if the remaining gun continued to fire, could they have repelled the Germans? Best read in Reverse Order! The bailed out Panzer is able to remount and passes its Morale check. 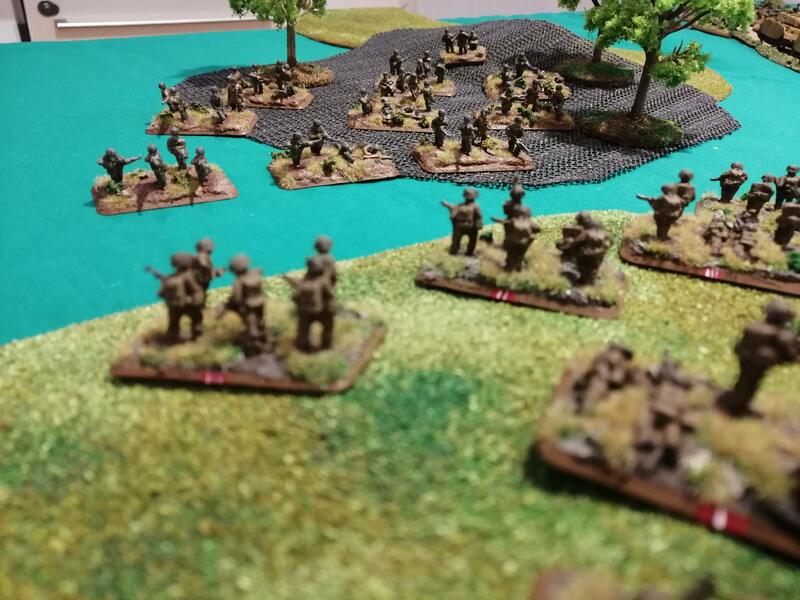 Both of the pinned Fallschirmjager platoons are able to unpin and get back into the fight. Not surprising given their fearless rating! FBP continue to advance up to put more units in charge range. 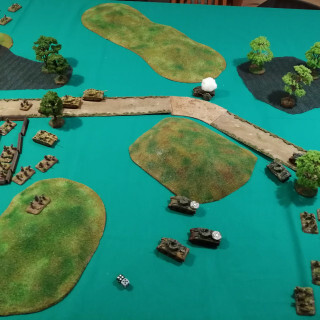 2nd Panzer platoon is able to blitz move off of the road and up to the tree line that SFOP are in. The command tank takes a further move to put the entire platoon in charge range. FRP decide to move at the double and dash 10” up behind the tanks to get closer to the fight. 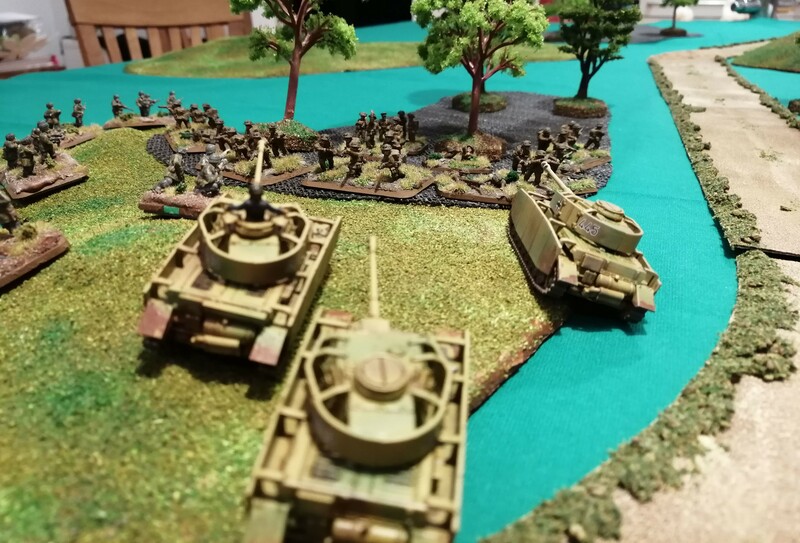 2nd Panzer platoon fire their main guns against SFOP with 5 shots. Only 2 hit and the bullet proof cover saves the British from taking any damage. FGP fire upon SFOP with 12 shots. Despite a lot of hits that pin SFOP, they fail to cause any damage, mainly thanks to the fact that SFOP are dug in with bullet proof cover. 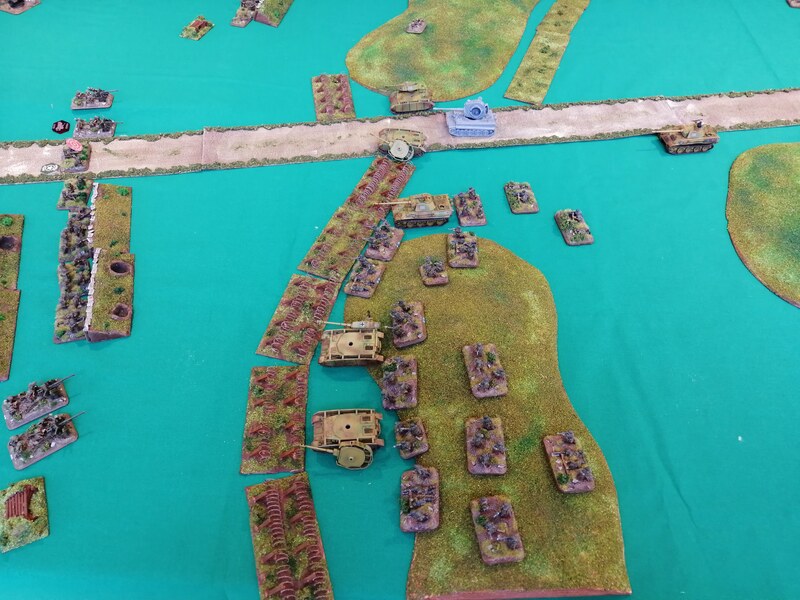 1st Panzer fires back against the anti tank guns on the hill. Two shots manage to hit with one of the shots destroying one of the guns. This puts a big dent into the British’s hopes of taking out the remaining Panzers. FBP fires upon SFRP but despite a lot of shots, fail to cause enough hits to damage or even pin the plucky defenders. However, the Mortar team launch a repeat bombardment against SFRP and are able to kill one team and pin the rest of the platoon in place. 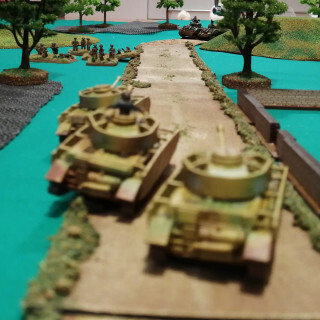 2nd Panzer launches a tank assault against SFOP. The defensive fire is ineffective and the panzers roll over two teams, killing them. SFOP counter attack but despite causing 5 hits, fail to penetrate the Panzer armour. 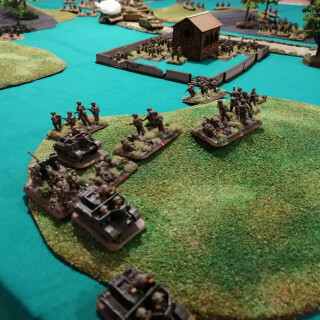 The Panzers try to continue the assault but, probably due to the grenades exploding against the top hatches, fail to counter attack and fall back. 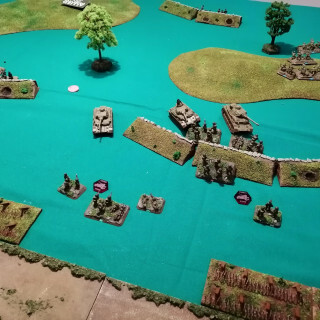 SFOP hold off the panzer assault! FBP launch their second assault against SFRP. Despite being pinned, SFRP are able to apply 9 shots and hit 4 times, killing one stand from FBP. This isn’t enough to hold off the assault and it hits home. FBP is only able to kill one stand from SFRP. SFRP, given the over whelming numbers they still face, decide to fall back rather than continue the fight. 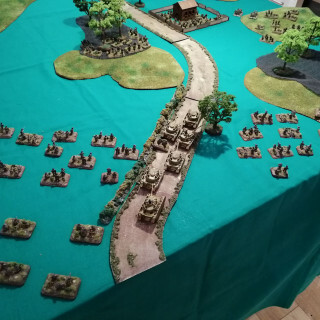 The British now receive help from the lead platoon of Shermans from the 46th Royal Tank Regiment who deploy on the road to the South. They immediately gun their engines and dash up the road to get closer to the fight to assist the beleaguered infantry. They’re able to get almost as far as the first turn in the road and have cover from the hill. 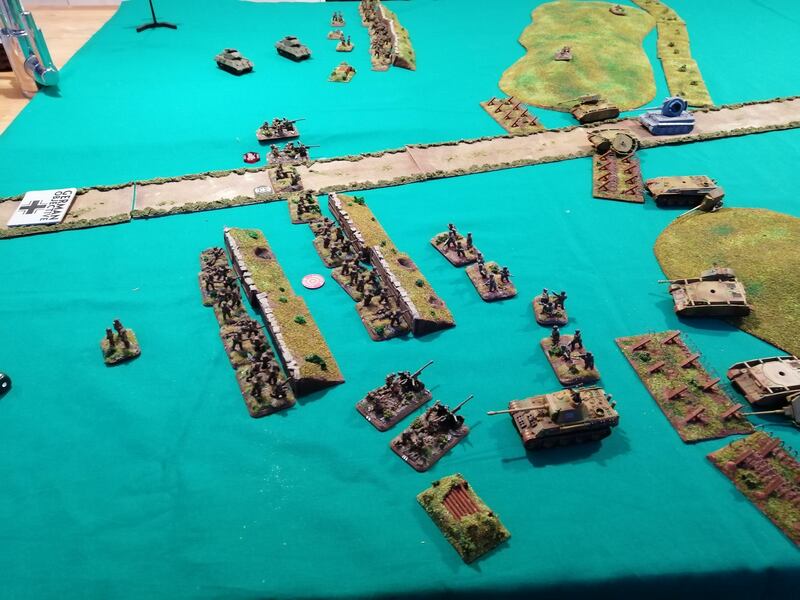 SFOP, with the tanks now threatening them, decide to start falling back, as do SFRP. The remaining anti tank gun passes its morale check and hitches up to the Universal carrier and starts to fallback as well. The MG teams remain in place to provide some covering fire and open up on FBP causing 7 hits and killing 1 stand. FBP are pinned in place again. FBP fails to unpin and remain in place. 1st Panzer once again passes its morale check and is able to stay in the battle. It tries a blitz move but fails. 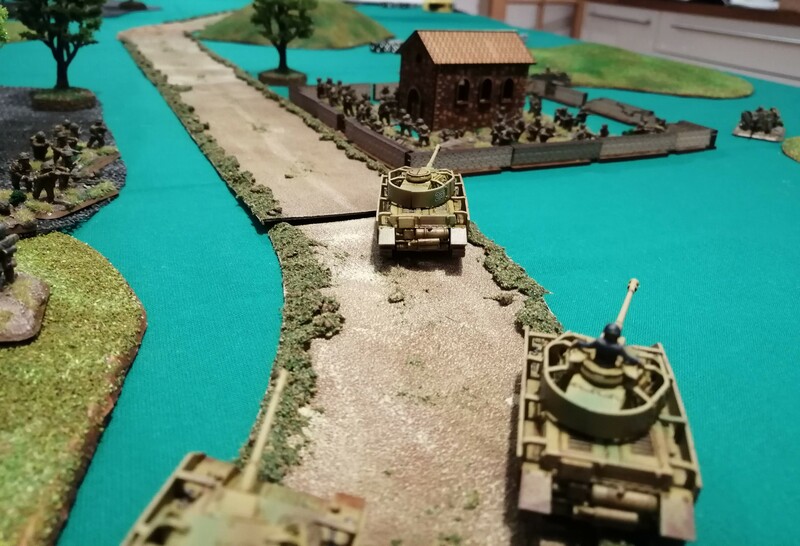 2nd Panzer advances along the road. 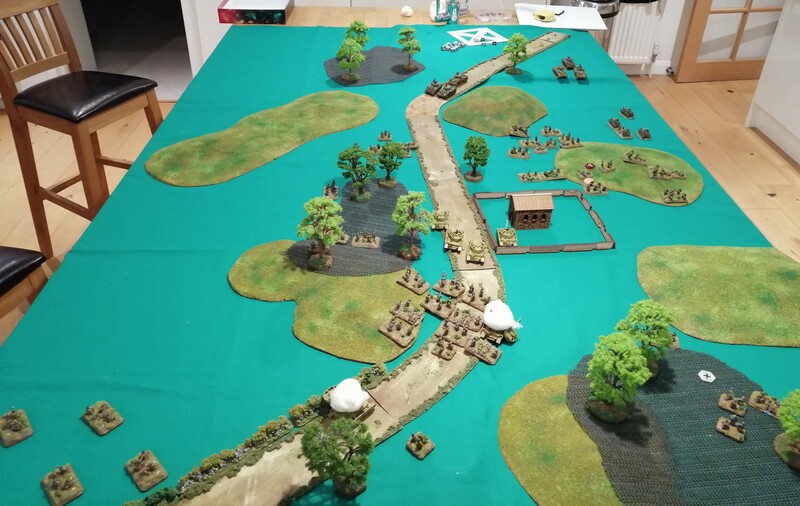 Both FGP and FRP advance on the now retreating Sherwood Foresters. FGP fires upon SFOP. With SFOP now out of their dug in positions are a little easier to hit and FGP are able to destroy 2 stands with their shooting but can’t pin the unit in place. The mortar team decide to change their focus and fire upon SFRP. They range in first time and pin the platoon in place, even if they don’t cause any damage. 2nd Panzer uses its MGs against SFGP. The 12 shots hit 7 times and kill one stand while pinning the rest in place. 1st Panzer fails to score any hits. 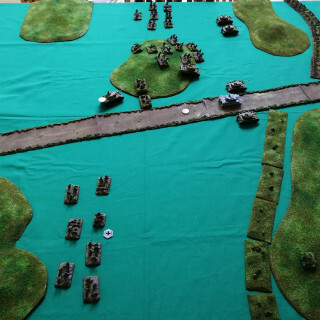 1st Panzer launches and assault against SFGP. The defenders fail to beat off the assault with their guns and 1st Panzer destroys the PIAT team in SFGP. SFGP decide not to counter attack and take the opportunity to start falling back along with the rest of the company. 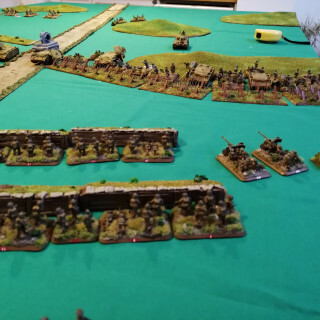 The 2nd Sherman Platoon arrives on the road and heads cross country toward the retreating infantry. 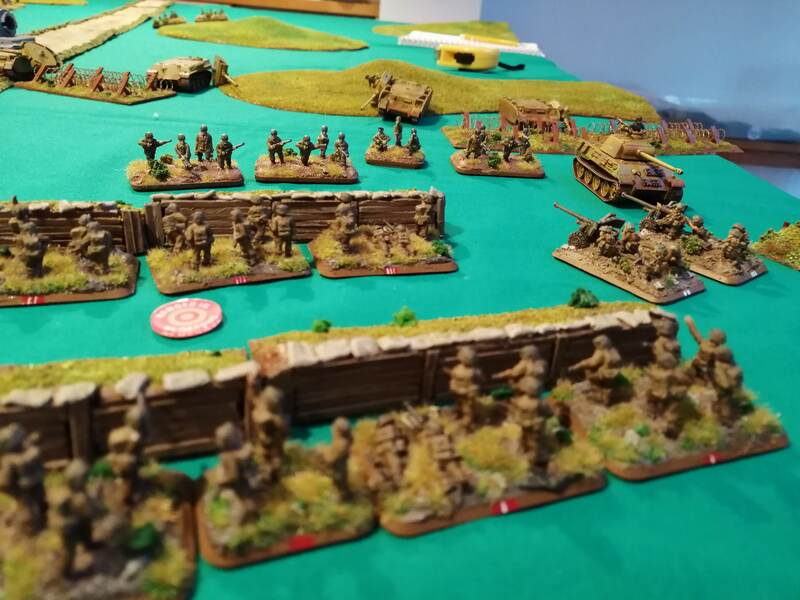 SFRP fails to unpin and remain in place within the ranged in mortars as well as in sight of the Panzers! The remaining anti tank gun passes its morale check and continues its retreat towed by the universal carrier. 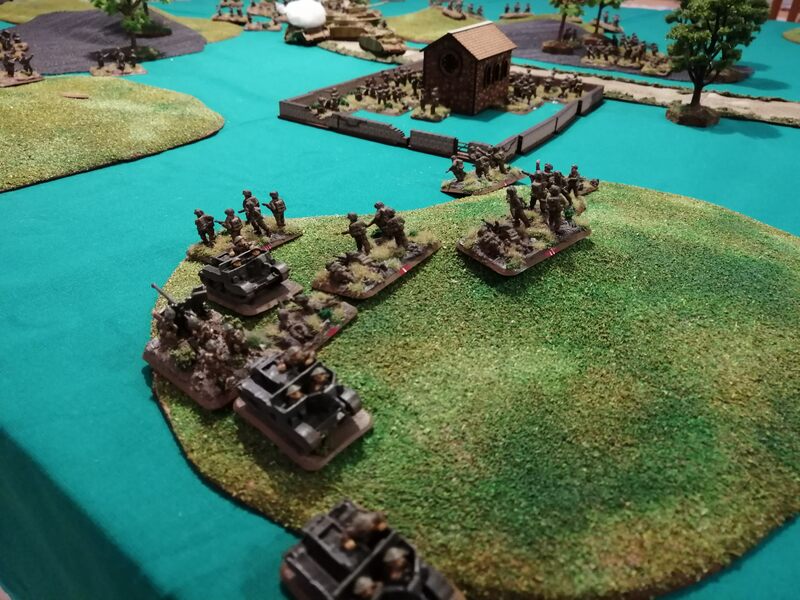 The 1st Sherman Platoon successfully makes a blitz move around the hill and is able to draw a bead on the Panzers down the road. SFOP, SFGP and the MG team all fall back toward their extraction point. Despite the blitz move, the 1st Sherman Platoon is unable to hit their targets, firing wildly wide. The remaining shots from the British all miss as well. 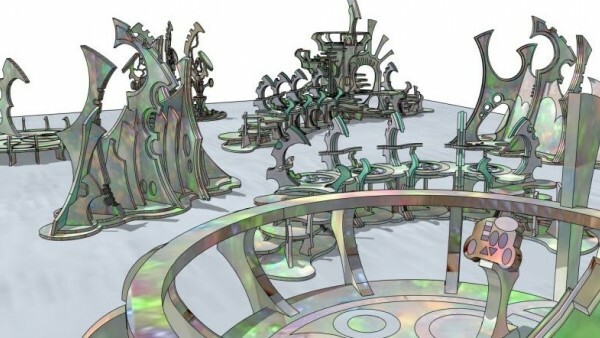 Unless you like to know the end before the beginning, this project is best read in reverse order! 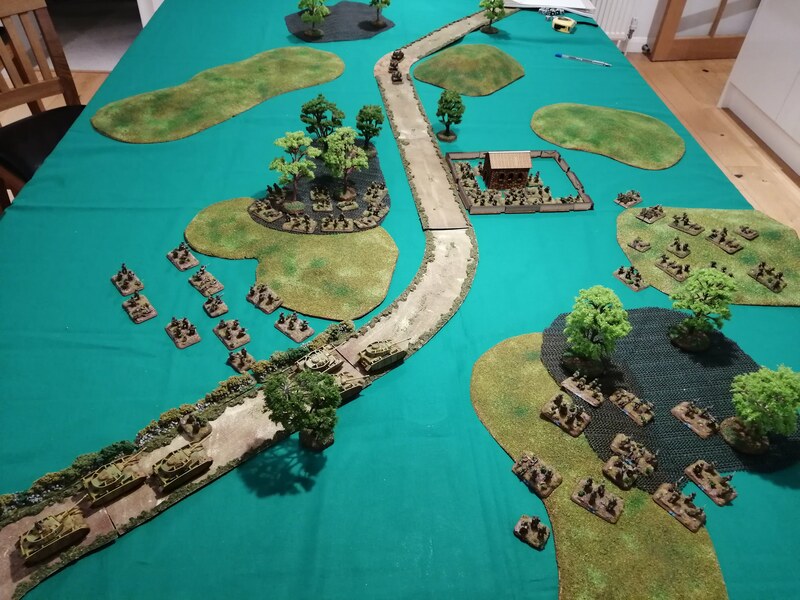 The newly arrived FRP advance their full 8” along the road, looking to get close to the action. 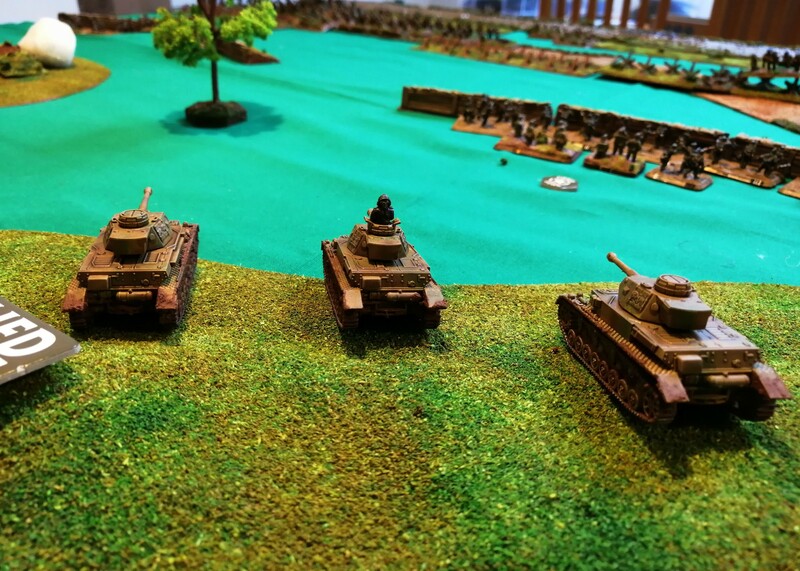 By advancing up the middle, they can lend their support to either flank while providing some cover for the Panzers. FGP Surround the SFOP position in the tree line, ready to get stuck in. 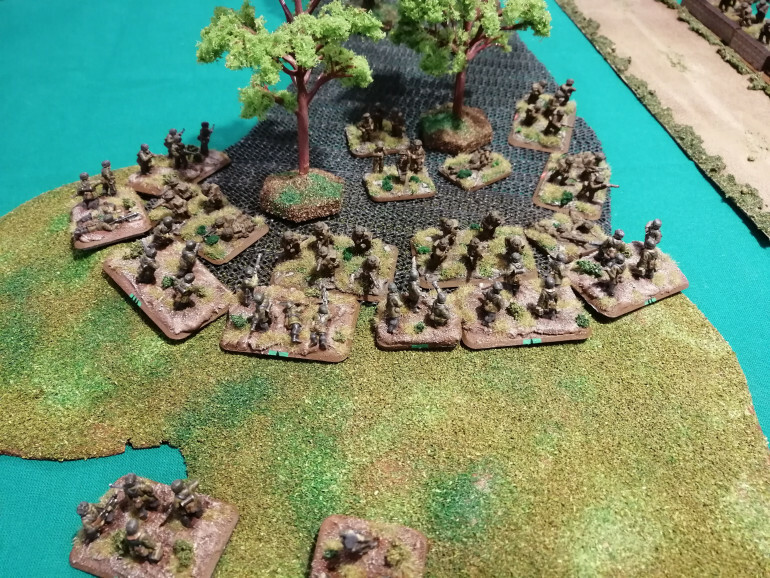 FBP, over on the German Right flnk, continue their advance through the trees to move within charge range of SFRP on their small hill. 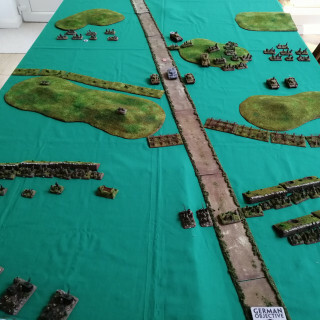 The lead panzer platoon fails their Blitz move and decide to move their full 10” along the road. 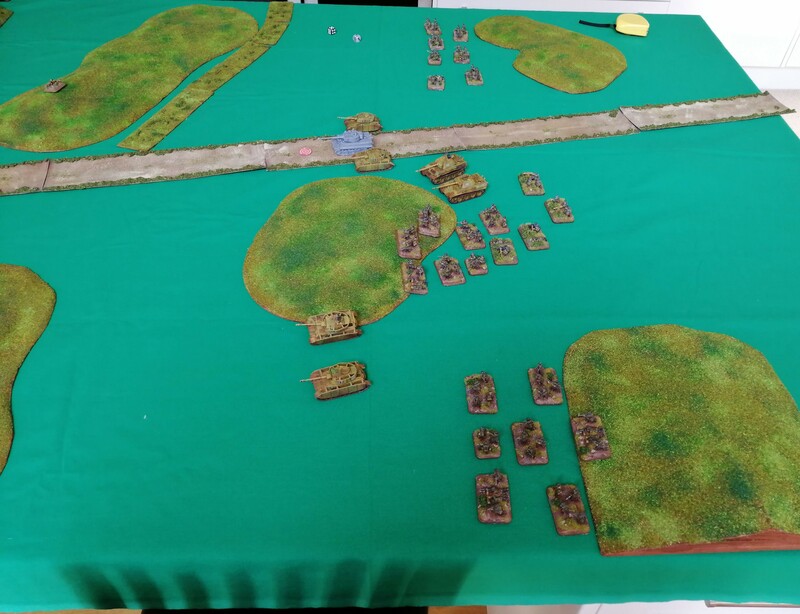 The 2nd panzer platoon also fails their blitz move and decides to move up behind the 1st panzer platoon. This is going to impair their ability to fire this turn. 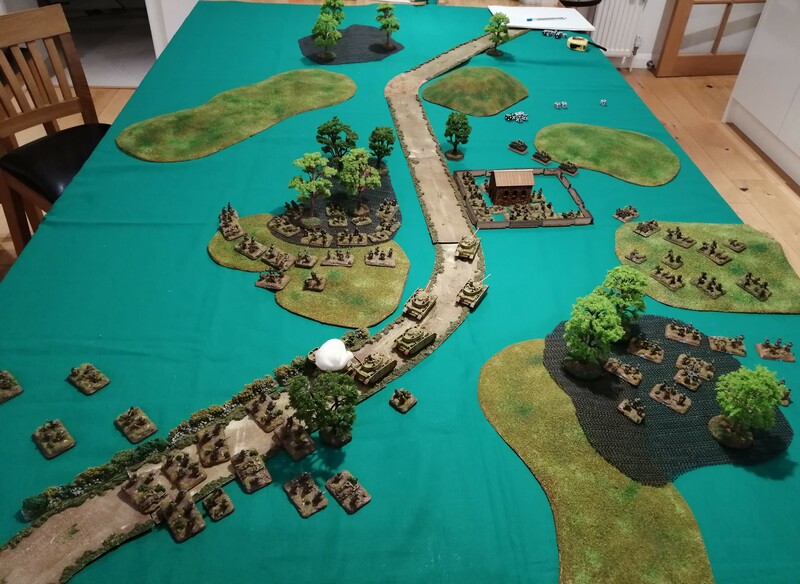 FBP is able to apply some fire to SFRP and hoping to at least pin the British in place ready for an assault. They only manage to hit 4 times and fail to cause any damage to the dug in Englishmen. On the other side of the road, FGP applies some fire to SFOP. 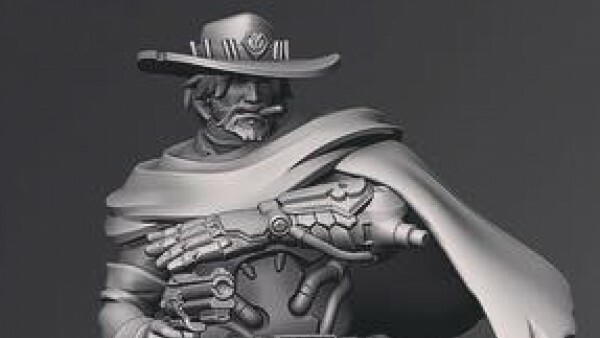 With the 10 shots available, they can only hit 4 times and cause just a single kill. Not enough to pin SFOP which is what they really want to launch an assault. The 1st Panzer platoon fire on SFGP using their MGs. That’s 8 shots but they fail to cause any wounds or to even pin their targets. 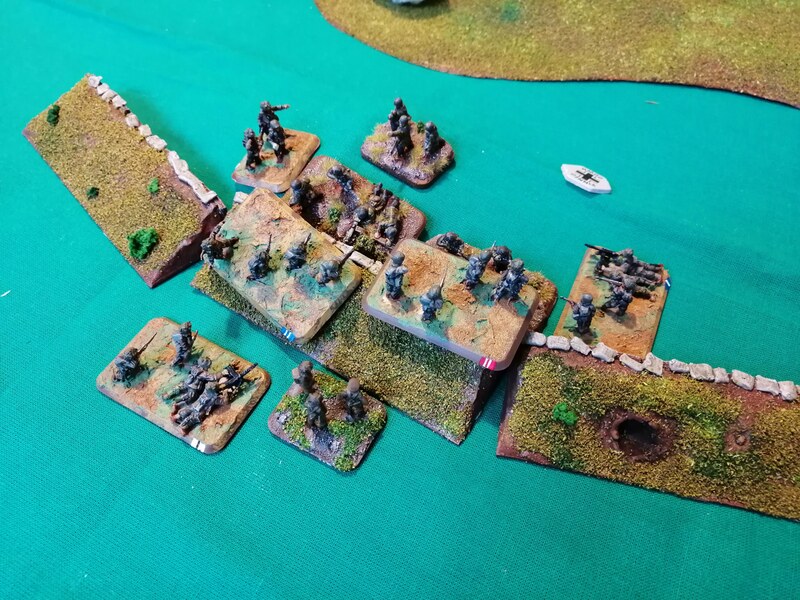 The mortar platoon launches a bombardment against SFRP and the anti tank guns on the hill, ranging in on the first attempt. The bombardment fails to cause any damage but it does pin both SFRP and the AT guns as they dive for cover from the incoming shells. If the Germans hope to push forward, they need to dislodge the British from their holes and an assault looks like the only real way of achieving this. FBP launches their assault against SFRP. The defenders, despite being pinned, are able to get 9 shots off and manage 6 hits, killing 1 stand from FBP. That’s enough to pin FBP in place and cause the assault to fail! 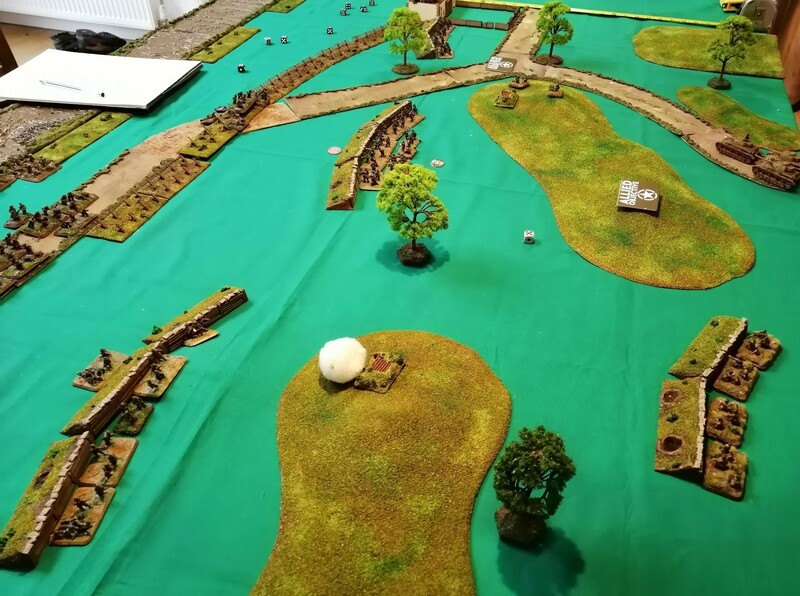 Across the road, FGP launches an assault against SFOP dug in around the tree line. SFOP is able to fire 16 shots in defence and scores 6 hits with 1 kill. That’s enough to pin the attackers and fend off the assault this round! The British on both sides of the road show their tenacity! At the start of the British turn, both of the pinned British units are able to unpin. The Universal Carriers continue to advance and get behind the Anti Tank guns, ready to hitch them up and remove them from danger. 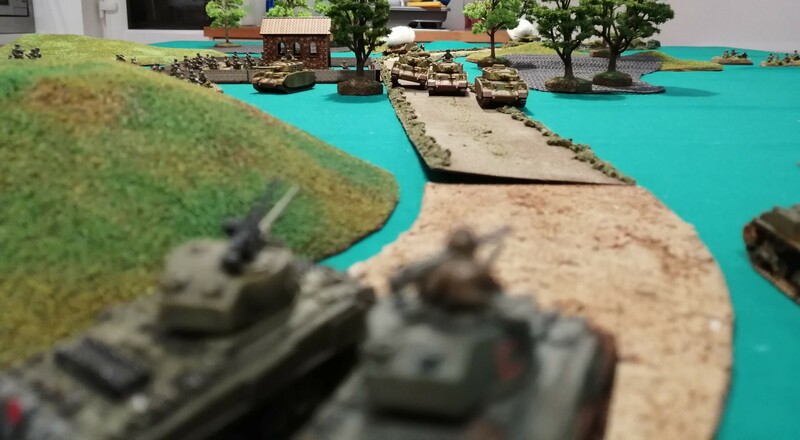 SFGP fires its PIAT against the lead 1st Panzer while the rest of SFGP fires their small arms against FGP. All of the shots miss their targets and the British fail to cause any damage. The 6pdr guns in the anti tank platoon fire against the 1st Panzer platoon and hit twice, both of which penetrate the panzer armour. One tank is destroyed while the second bails out. 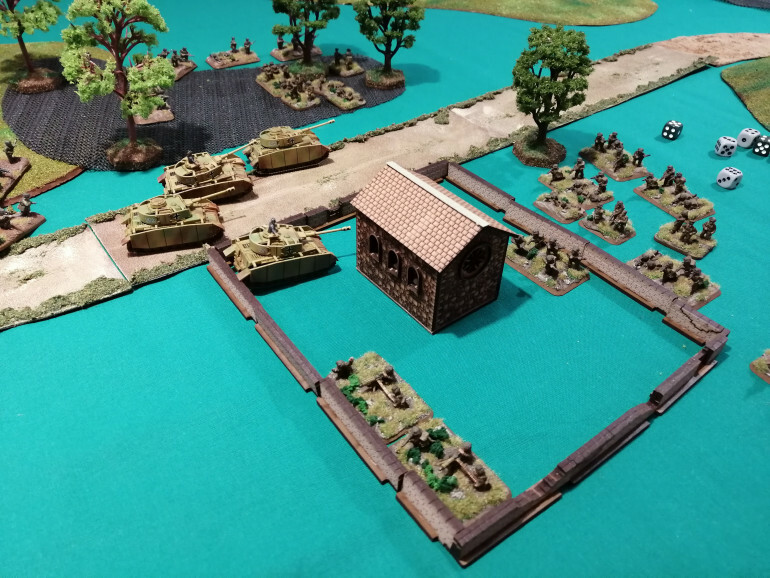 This leaves the 1st Panzer Platoon with just a solitary tank. 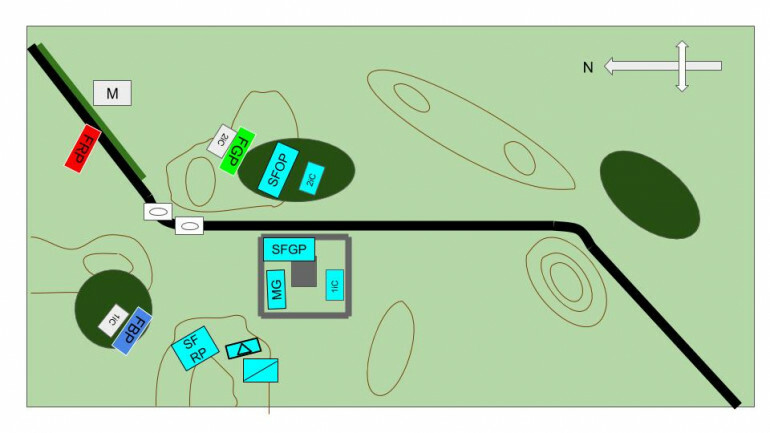 SFRP is able to continue to apply their fire to the now pinned FBP. Their nine shots cause another one stand from FBP to be removed. 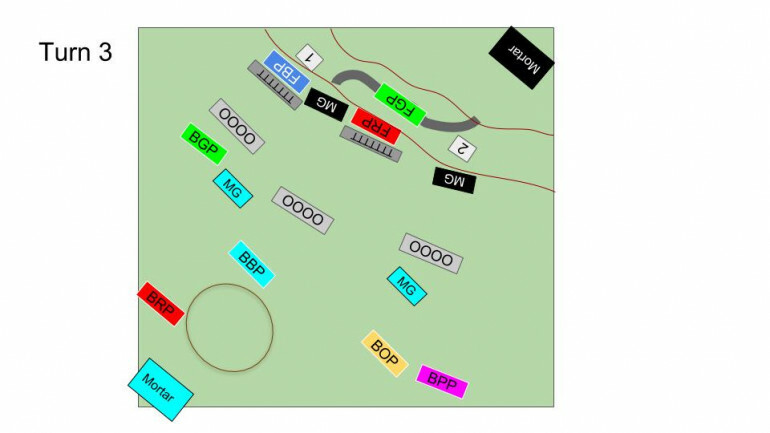 FBP is also in range of the MG platoon and their guns open up on FBP causing a further 1 stand to be removed. FBP is taking some punishment. 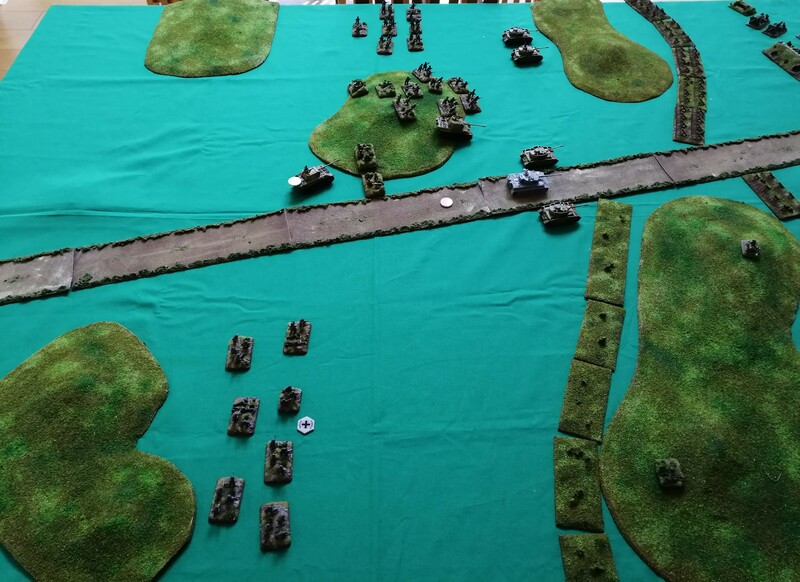 The Germans are attacking and so have the first turn. The immediate move is to push out of the pocket deployment zone. 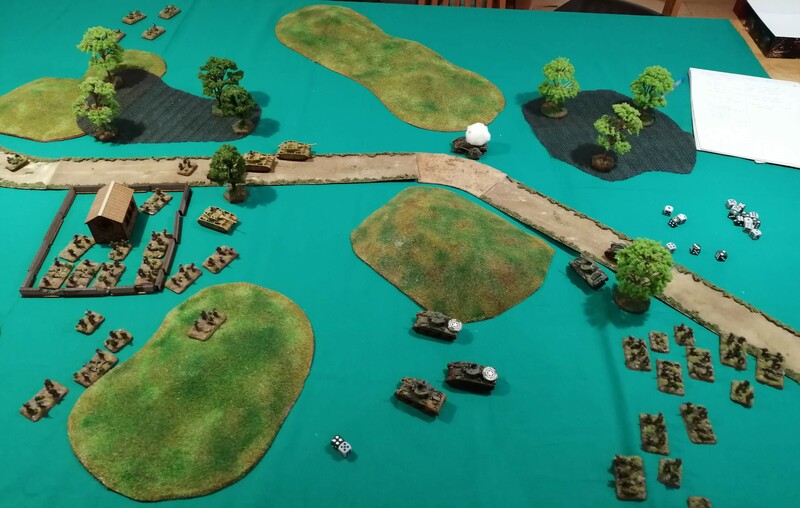 The two panzer platoons advance down the road. 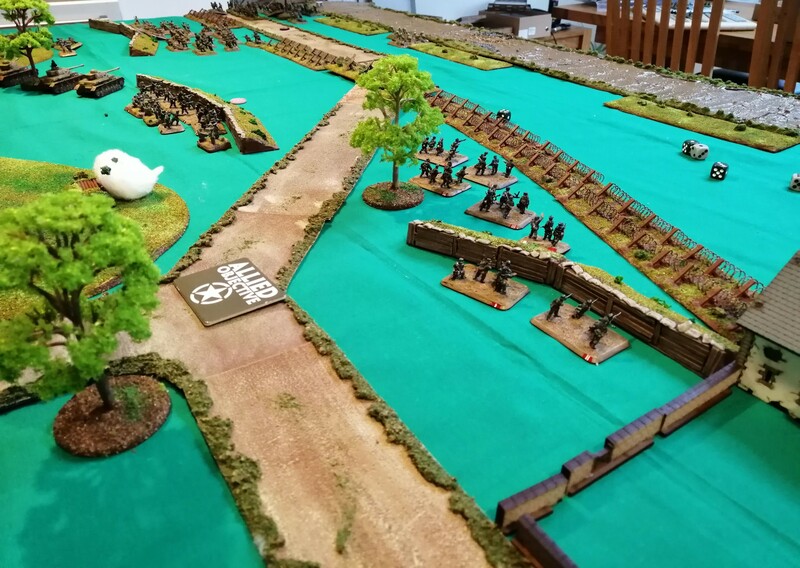 FBP advances toward the tree line and FGP advances southward toward the British cowering within the trees. FBP is out of range so cannot shoot. FGP is able to lay some fire down upon SFOP but, thanks to the British being dug in, is unable to cause any damage. 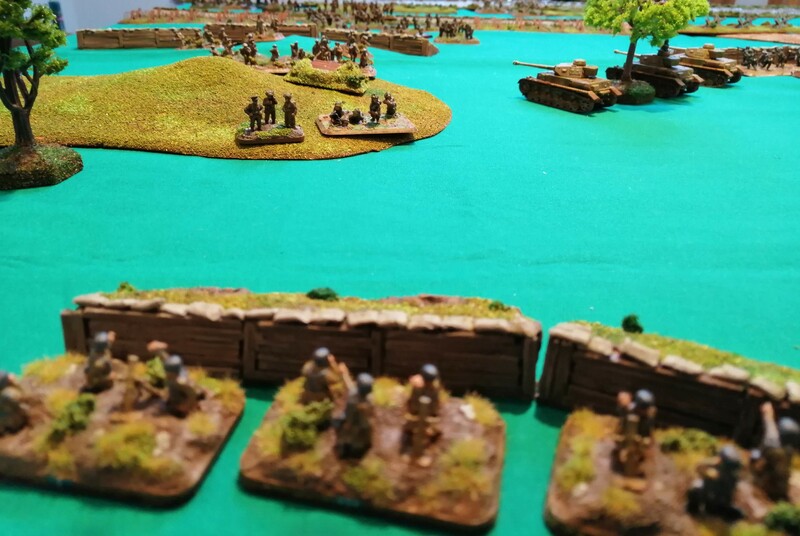 The lead tanks focus their fire upon the British units that can punch back, namely the anti tanks guns on the hill, but fail to cause any damage. The British are well dug in and choose not to move their main forces apart from the Universal carriers that use their Dash Movement to charge ahead 32”. Frustratingly for the British, their 6 pounder anti tank guns are just out of range of the German Panzers, so cannot fire this turn. SFOP is able to fire back from their fox holes in the woods upon FGP and with 6 shots, causes 1 base to be removed. 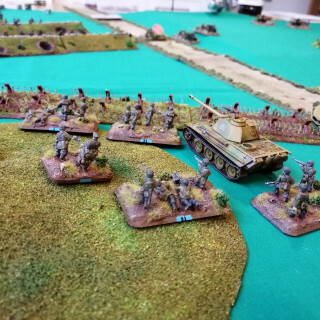 1st Panzer Platoon is able to apply some pressure to the defenders. With a Blitz move, they can freely apply their full rate of fire with their main guns to the Anti Tank gun platoon. 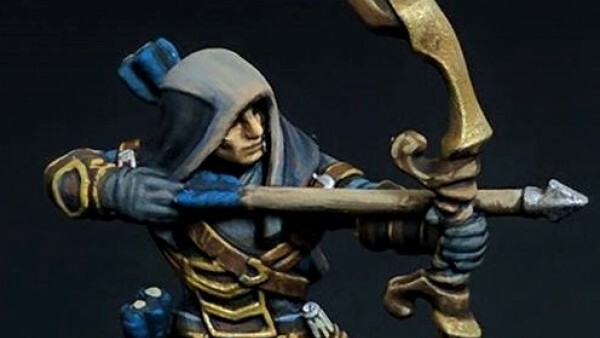 They score 3 successful hits but two are saved and the remaining hit doesn’t pass the fire power check leaving the defenders unharmed and ready to fight back! FGP continues to fire upon SFOP, scoring 2 hits but given the Forresters’ dug in positions, FGP fails to cause any damage. 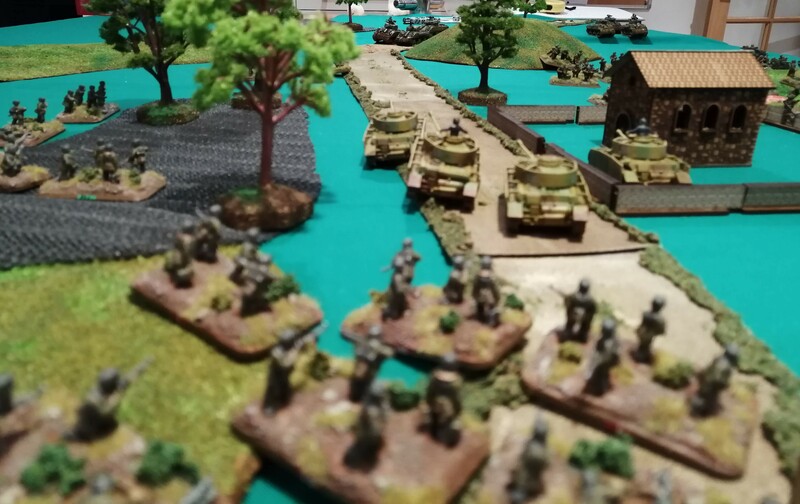 At the end of an ineffective turn, the German commander orders the 2nd Panzer Platoon to ‘Follow me’ and advance 4” to keep up with the 1st Panzer Platoon. 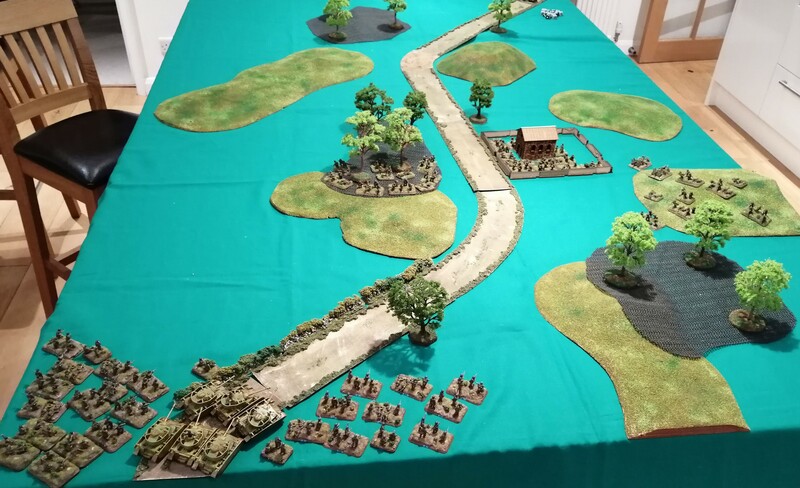 In reply, the Universal Carriers advance up behind the Chapel but otherwise, the Sherwood Foerresters don’t move from their dug in positions. 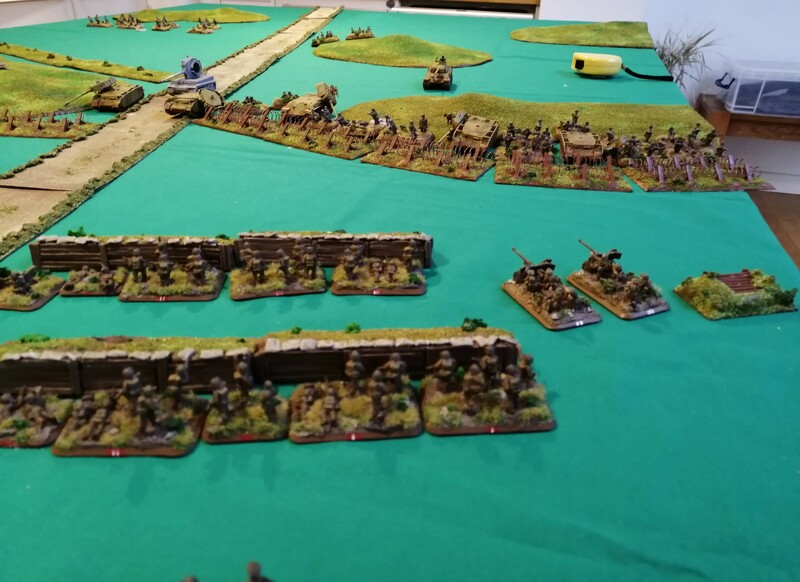 The 6pdr anti tank guns fire upon the 1st Panzer Platoon. With their 4 shots, they hit twice. The left tank is able to bounce the shot but the right tank is not so lucky and ‘brews up’. From the tree line, SFOP continues to defend their position and fire upon FGP, scoring 3 hits and one kill. 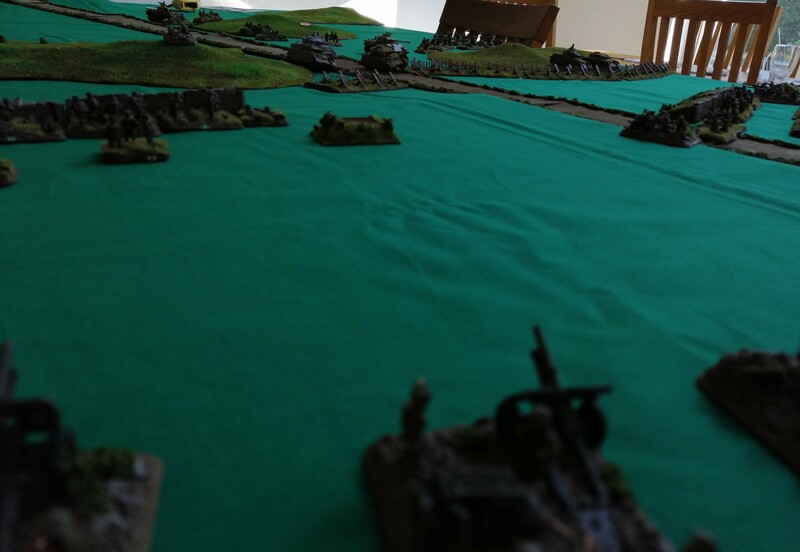 Our second table top battle takes place to the North of Anzio, on 4th February 1944. On January 30th 1944, Lucas launched a two pronged attack from the Anzio beach head. 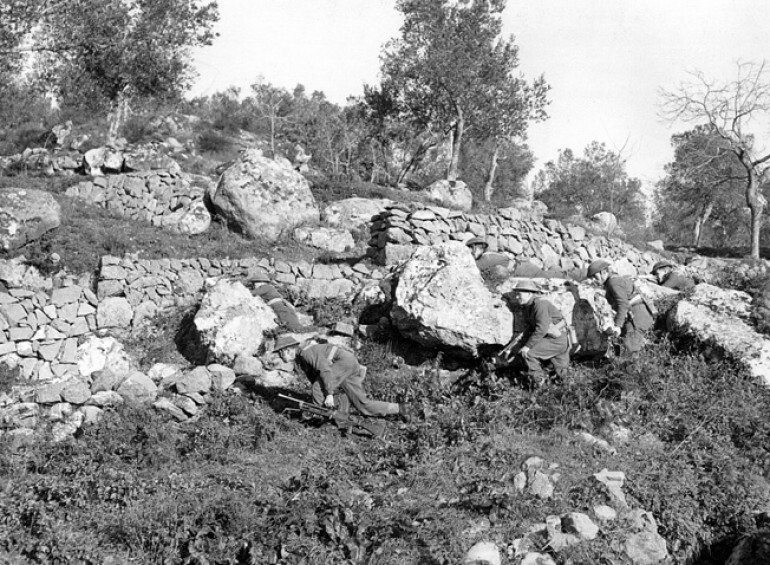 British 1st Division thrust North East toward Campeleone up the Via Anziate and, after several days of fighting, they were unable to progress. 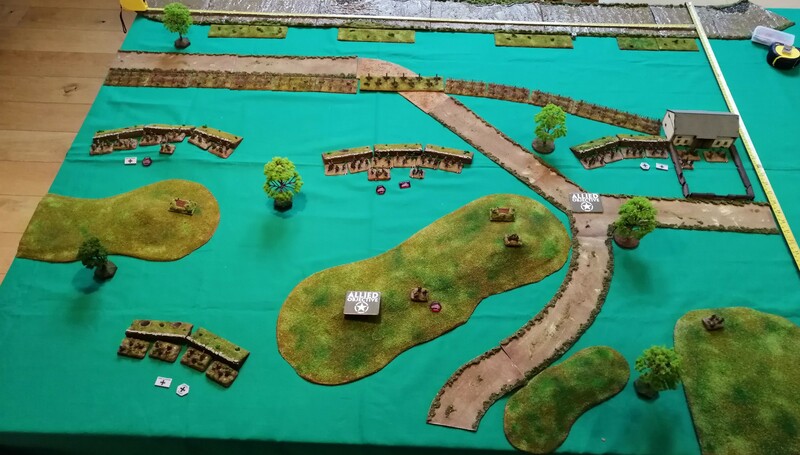 Worse, British 1st Division had created an exposed, narrow salient stretching up the road. The German forces had continued to gather and by late on 3rd February launched a counter offensive against the troops dug in just South of Campeleone. By midday on 4th February the situation was deteriorating quickly for the British as their organisation and defensive line crumbled. Many units found themselves cut off and surrounded and were fighting desperately. A number of battalions, including the Sherwood Forresters, found themselves isolated and tried to hold their ground. As the day wore on, losses mounted and at 5pm, they were ordered to enact a fighting withdrawal. The 168th Infantry Regiment, supported by the 46th Royal Tank Regiment, punched through the surrounding Germans to support the withdrawal. In this battle, we focus upon the 1st Battlion Sherwood Forresters who have been cut off toward the tip of the salient and have dug in around a small chapel just off of Via Anziate. 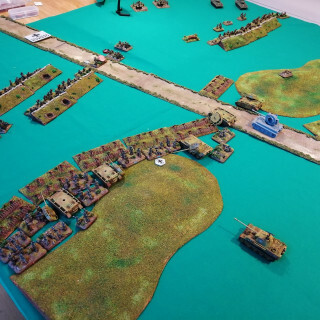 Heading down the road from the North are the 4th Fallschirmjager supported by two panzer platoons, with orders to remove the British as quickly as possible. 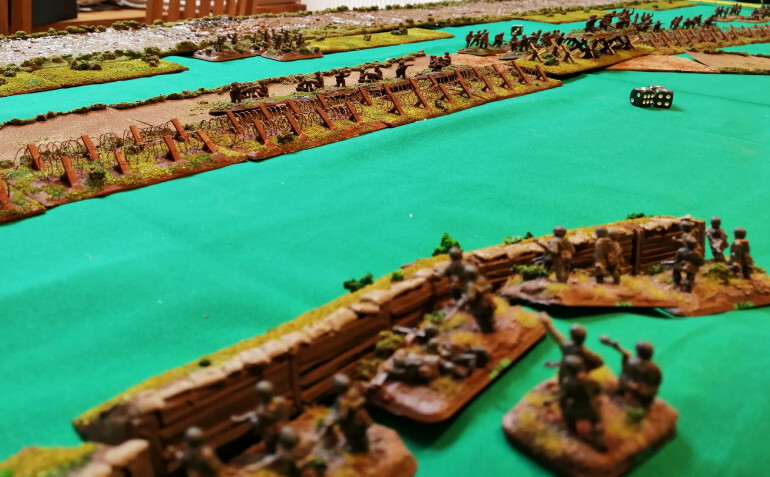 Game Scenario: This game hinges around the British ability to extract as many troops as possible from the front line. The Germans need to push forward and destroy as many of the British forces as quickly as possible. 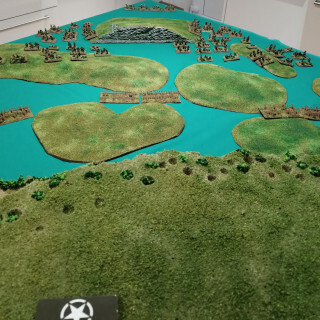 The British must hold their positions until the end of Turn 3. 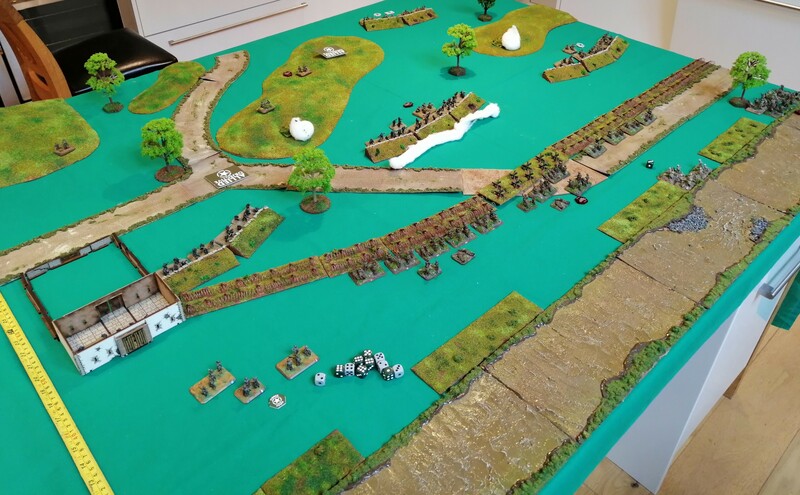 From Turn 4 onwards, the British can begin to with draw to the road on the southern edge of the board. When within 6” of the road and board edge, they are removed and considered successfully extracted. 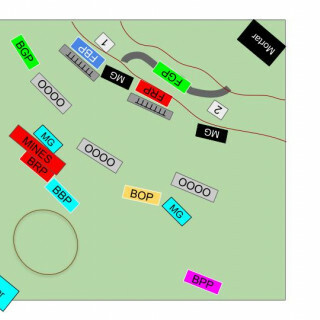 At the beginning of Turn 4, a platoon of Shermans from 46th RTR arrives at the Southern edge of the board on the road. 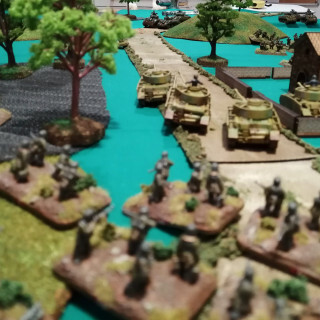 A second platoon of Shermans arrive at the start of turn 5. The Shermans do not count toward the victory conditions and are not extracted. 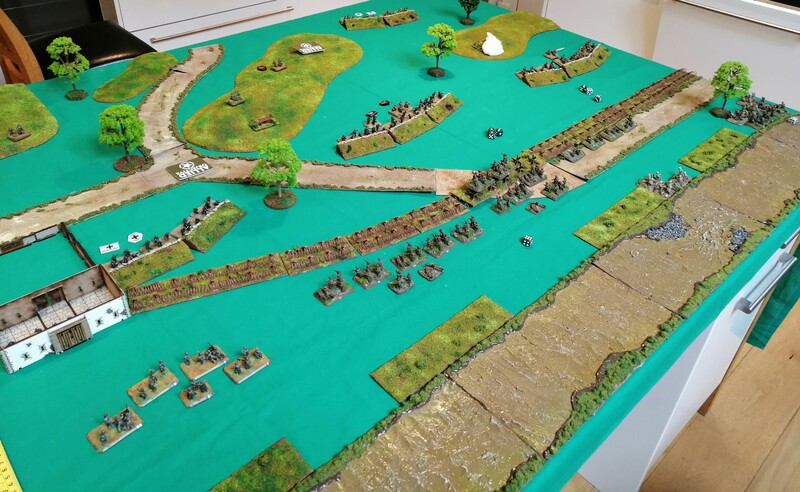 The Germans start the game on the Northern edge, deployed within 12” of the road and table edge. 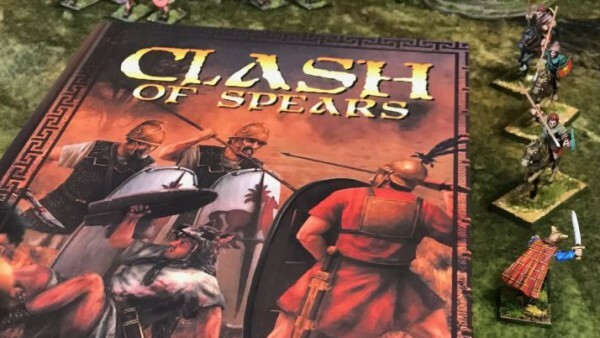 This will place the two forces very close together at the start of the game. 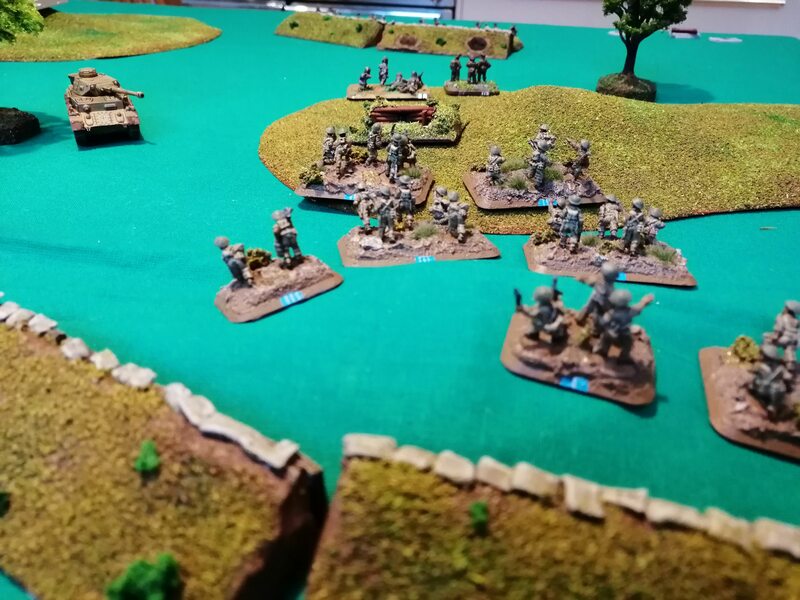 At the start of Turn 2, a third platoon of Fallschirmjager arrives. The British receive 1VP for each platoon they successfully extract (not including the Universal Carriers or Sherman Platoons). 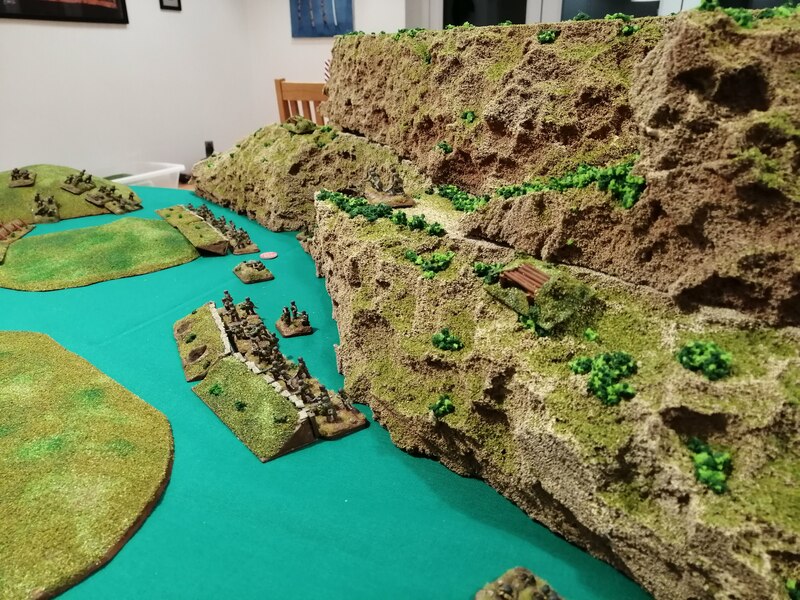 The British deploy their MG Platoon (MGP), 1iC and Sherwood Forrester Green Rifle Platoon (SFGP) behind the stone walls surrounding the chapel. 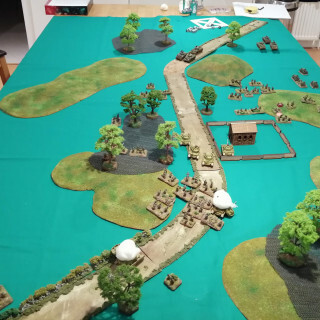 2iC deploys with SF Orange Rifle Platoon (SFOP) along the edge of the woods to the east of the road. 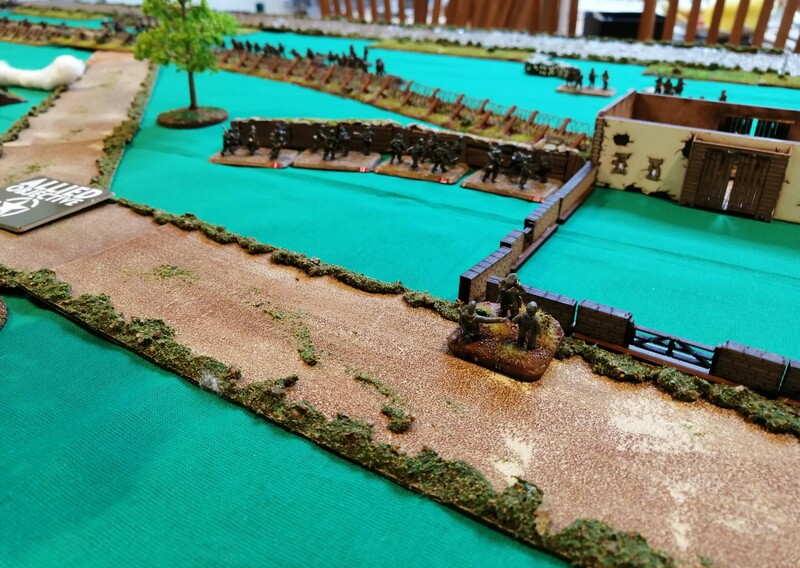 SF Red Rifle Platoon (SFRP) and the anti tank gun platoon (ATP) deploy on the hill to the West of the chapel. 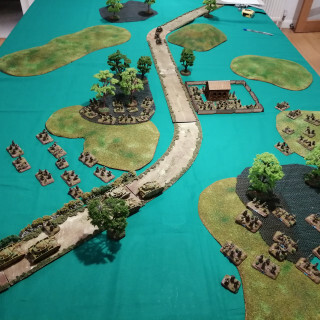 The Germans deploy their Fallschirmjager closely together either side of the road with Fallschirmjager Green Platoon (FGP) on the East with 2iC and Fallschirmjager Blue Platoon (FBP) with 1iC deploys to the West of the road. 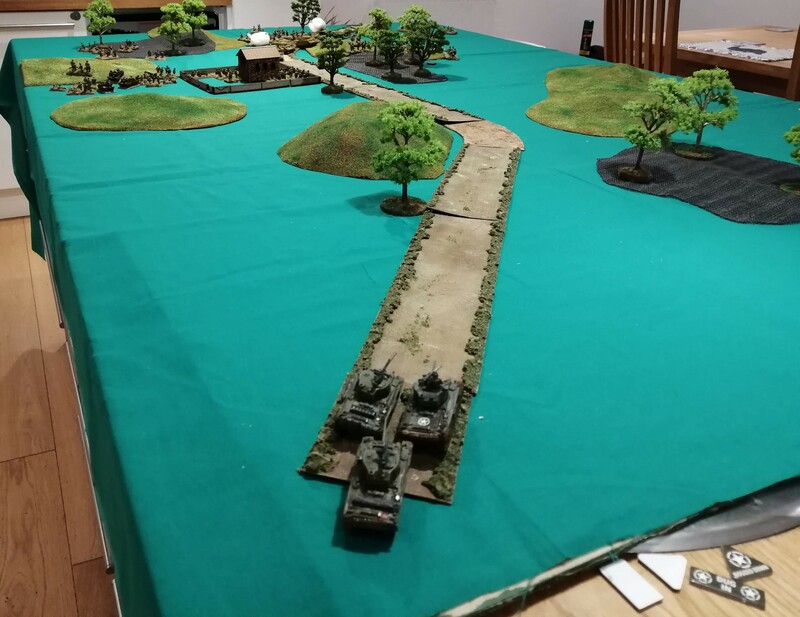 The two tank platoons deploy on the road itself, with Tank Platoon 1 (TP1) in the lead. 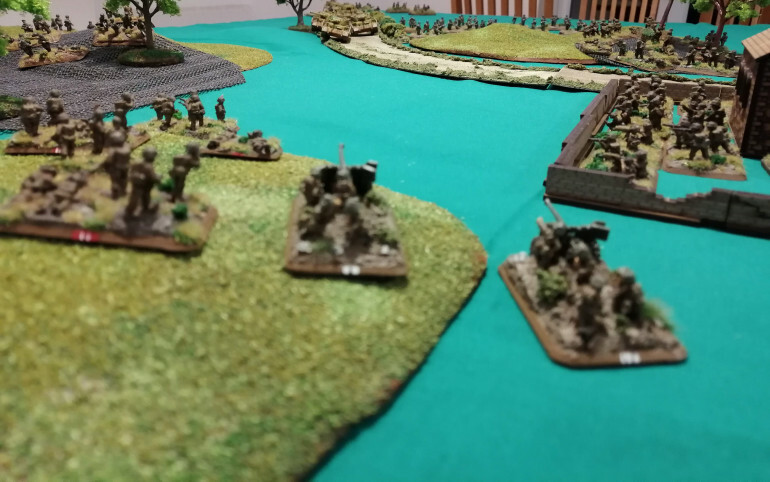 The Fallschirmjager Mortar Platoon (FMP) deploys at the corner of the board. On the 22nd January, the US 5th Army launched Operation Shingle, the beach landings at Anzio. The landings were devised by Churchill and, like the whole invasion of Italy, the Americans were very pessimistic around the entire plan. Clark, in command of 5th Army, viewed the operation as a distraction from Cassino and had been advised by others that it was a death trap, especially if a break through at Cassino could not be achieved. Clark cancelled the plan. He was however overruled by Churchill who impressed on Clark the need to open a new route to Rome and draw defenders away from Cassino. 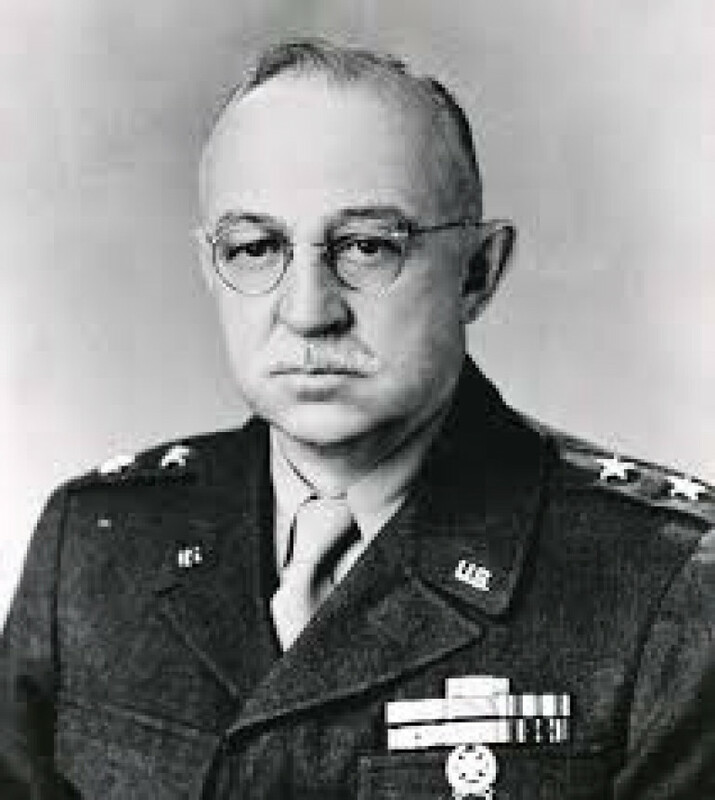 Clark relented and assigned the Anzio landings to Lt General Lucas’ VI Corps with orders to advanced quickly and threaten the rear of German XIV Panzer Corps. Lucas had to contend with limited availability of landing craft and a short planning horizon. The Allies were insistent on nothing delaying Operation Overlord and could only offer the landing craft until 5th February before they were needed elsewhere. To further compound the problem, there was only enough capacity to land 2 tank divisions. Clark and Lucas also felt that to ensure success, at least two Corps would be required and that just using a single Corps would lead to failure. Confidence in the US Command was low, even before the operation started. Surprisingly, the initial landings by VI Corps were largely unopposed and by midnight on 22nd, 36,000 men and over 3000 vehicles had been put ashore. 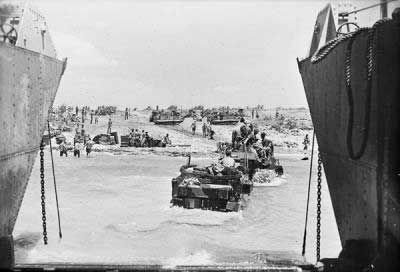 Allied forces had even advanced 3km inland while US Rangers had taken the port at Anzio. 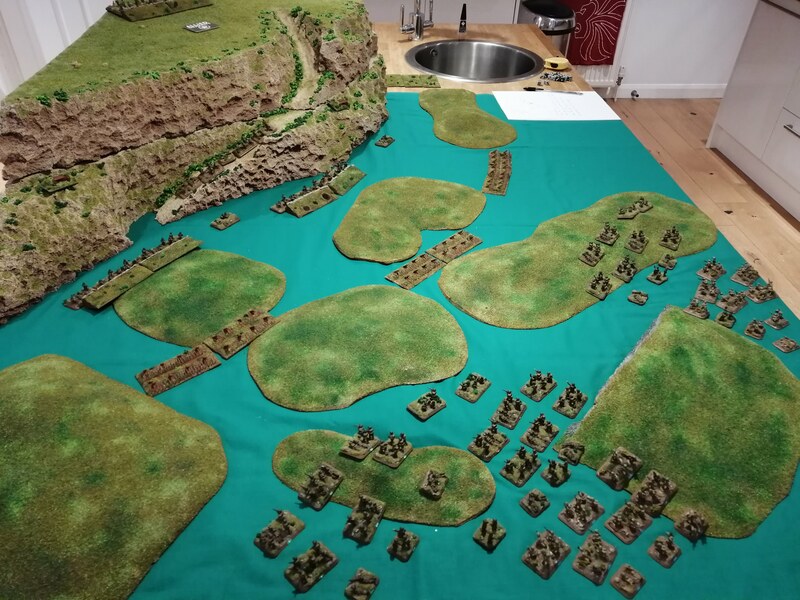 Over the next few days, VI Corps continued to build up their forces and, expecting a German counter attack, dug in around their beach head to protect the gains. This was against the expectations of the rest of the Allied commanders who were expecting Lucas to advance rapidly however given the resources at his disposal, Lucas also had a responsibility to not over extend and to protect the beach landing sites. Whether a more offensive approach would have worked is debatable and could have been costly. 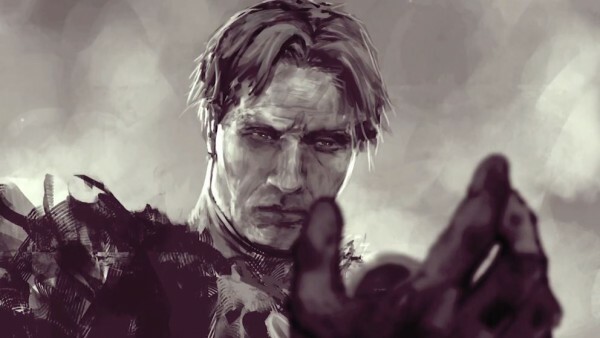 It is likely that Lucas’ pessimism around the whole operation was a significant factor in his decision to not go on the offensive. Kesselring had drawn up plans to handle beach landings at most of the obvious locations and allocated some defenders to protect and delay landings at these sites. His main defence relied upon a mobile force that could deploy quickly once the landing location was known. Within two hours of being informed, Kesselring had mobilised his defending forces, sending 4th Fallschirmjager and the Hermann Goring Panzer Division to take up defensive positions around the beach head. He further requested additional reinforcements be sent from France and Yugoslavia to contain the Allies. By 25th January, three German Divisions had surrounded the Allied beach head and Von Macksensen’s 14th Army took overall command. 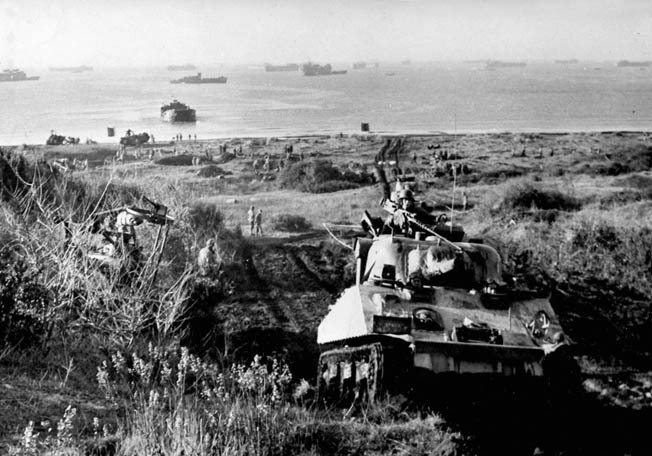 Further divisions were on route to the Anzio area to add to the German presence. By 24th January, the 40,000 troops were in place around the Allied beach landings. Troop build up continued over the next few days by both sides. By January 29th, the Allies had landed 69,000 men and over 200 tanks. The Germans had over 71,000 troops in place. On the North side of the landing zone were British 1st Division supported by 46th Royal Tank Regiment and 2nd Special Services Brigade. To the Northwest of 1st Division was a small US Ranger force made up of 4 Battalions from 6615th Rangers. The Southwestern force consisted of US 3rd Infantry Division and the US 504th Parachute Regiment. Lucas launched a two pronged attack on January 30th. US 3rd Division was to strike in land toward Cisterna and to take the Alban hills overlooking the landing beaches. 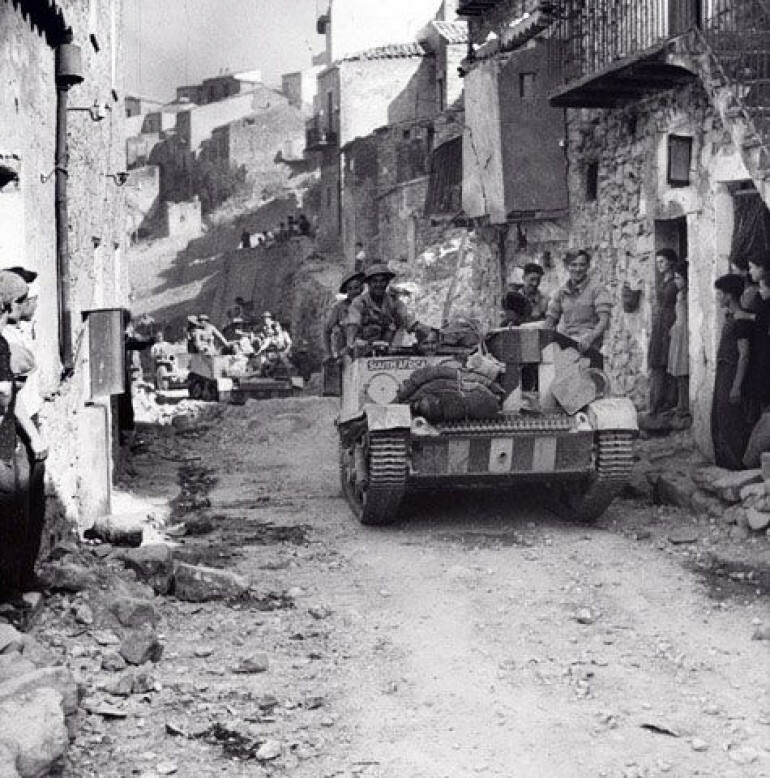 Meanwhile, British 1st Division was to drive northwards up the Via Anziate and capture Campoleone. Initially, 3rd Division made good progress, pushing almost 5km inland but eventually ground to a halt short of their target. They failed to link up with 1st and 3rd Ranger Battalions who had launched a daring raid inland but had become cut off and were facing fierce opposition from the Herman Goring Division. Of the 767 men in the two Battalions, only 6 returned to US lines with the rest either captured or killed. British 1st Division faced stiff opposition as they tried to push up the Via Anziate. They gradually gained ground but fell short of Campoleone and were left in a long, thin salient stretching up the road. German 14th Army continued to build up its troops and by early February had reached an estimated 100,000 in 2 Corps. With the Allied attacks contained and stalled, Von Mackensen ordered some small scale counter offensives on the 3rd February, particularly around the salient created by the British 1st Division. These attacks went well and, realising that the Allies were in a difficult position, Von Mackensen ordered a full scale offensive at 11pm that night. By the early hours of 4th February, the fragile British front line had fallen into a disorganised, incoherent mess and started to collapse. Individual companies found themselves isolated and cut off, not sure in which direction to withdraw. By mid morning on the 4th, the tip of the salient, now almost 3km long but less than 1km wide, was being squeezed on all sides. 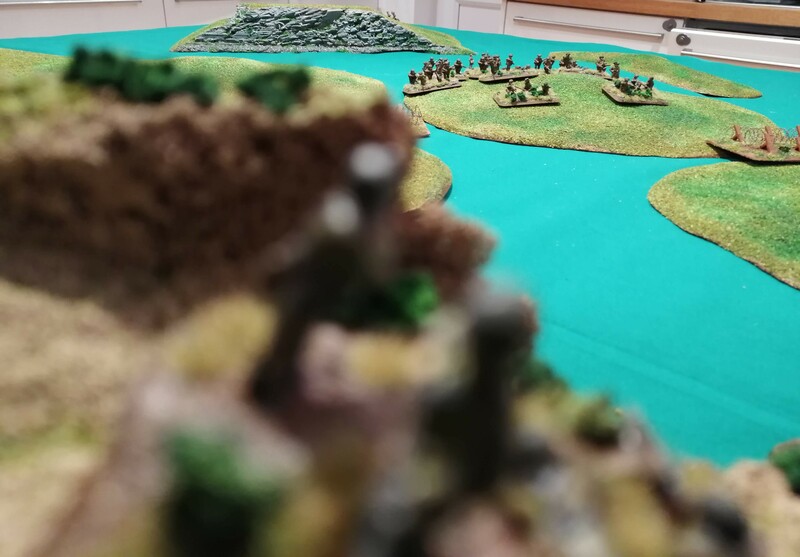 3rd Brigade found themselves surrounded and cut off North of the collapsing salient and Lucas ordered the newly arrived 168th Brigade to try to stabilise the situation. 3rd Brigade held on for most of the day, taking heavy losses while 168th Brigade fought their way to their positions. At 5pm, 3rd Brigade was ordered to make a fighting withdrawal under the cover of artillery. At that moment, 168th Brigade, with support from 46th Royal Tank Regiment, broke through and assisted in the extraction of the remaining elements. For the next couple of days, both sides utilised artillery and bombing runs to disrupt the enemy and soften up the targets. In the case of the Germans, this proceeded a renewed offensive launched late in the evening of 7th February. Several British Battalions were almost surrounded by the offensive and escaped only through giving ground. The German offensive slowly pushed the British back and by 10th February, the salient ceased to be. The last remaining team from AP B unpins and, with the 2iC there, is able to pass the morale check. RP E unpins however both RP G and RP F remain pinned. The last remaining team from RPD fails their morale check and are removed from the battle. The Engineers roll another 6 bringing their bridge score to 7, just two away from potentially being able to bring in some much needed armour reinforcements. RP E advances further past the old trench line of Green Platoon. 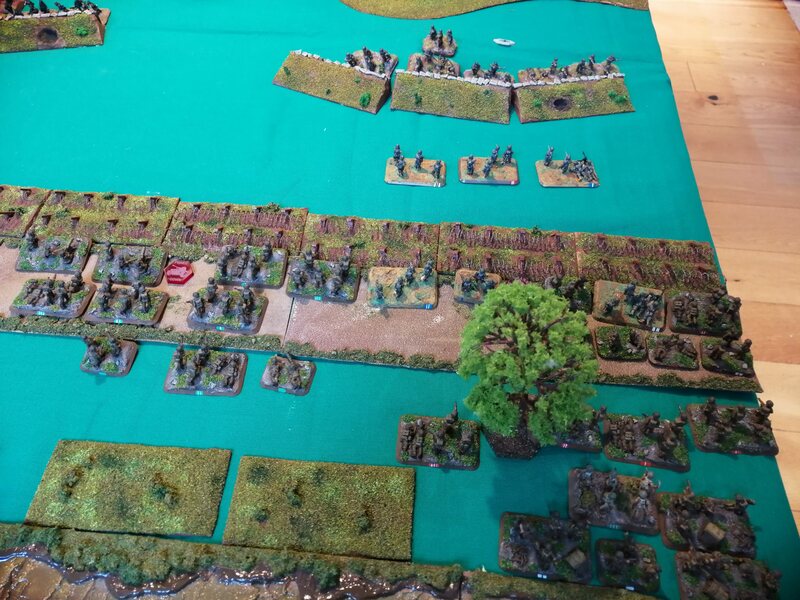 AP B with the 2iC rush past HMG 2, deciding that this can be left for the advancing rifle platoons behind them. 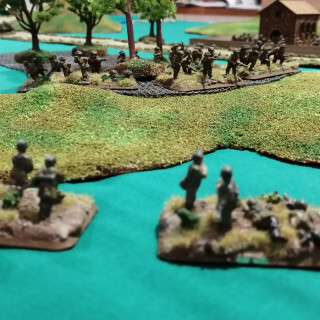 The 2iC sees the objectives and a largely unprotected mortar team further inland from the river! RP E fires its bazooka at the Panzer IVs but misses. 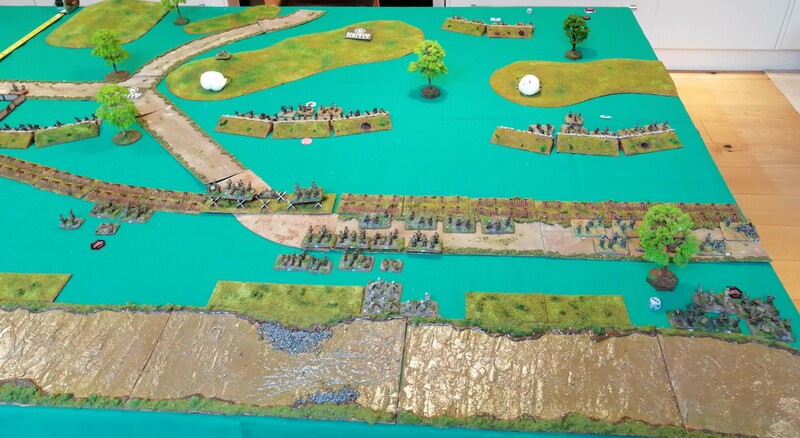 The pinned RP G fire their rifles at HMG 2 rolling 2 dice and getting 1 hit. The nest fails its save and RP G has to make a 6+ firepower check rolling a 6! 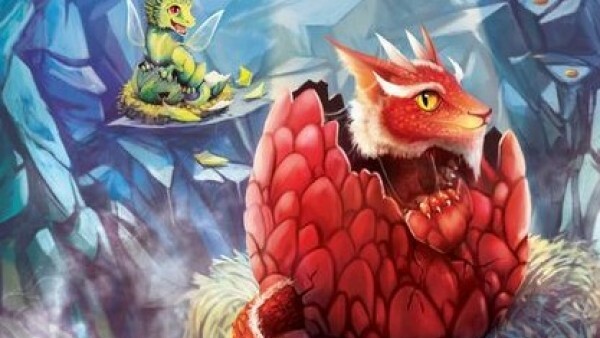 But, as this is a nest, the FP needs to be retaken and a 6 is rolled again! So where the flame thrower failed, the pin point accurate rifle fire delivers! Clearly RP G has spent plenty of time on the range practicing. The mortar team attempts to bombard the tanks in a desperate attempt to support the rifle teams. Despite ranging in first time, they fail to hit the tanks and cause any damage. Finally, the supporting tanks target the Panzer IVs but fail to hit. 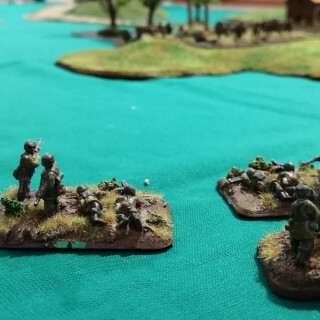 The Germans continue to move Red Platoon up and they are rejoined by the German 2iC. The Panzer IVs make a blitz move and start firing on RP E hitting 6 times and killing another team. Red Platoon are in range of the US mortar teams and open fire, killing 1 team. Black Platoon fail to cause RP G any problems. 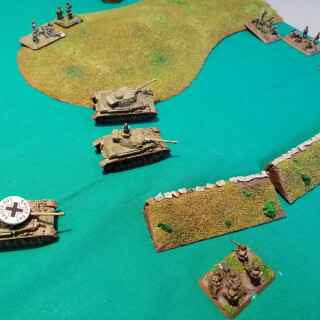 The German mortars launch a repeat bombardment and are able to kill another team from RP F.
The Panzer IVs launch an assault against RP E. RP E get a bazooka shot off before the assault hits home and manage to hit and bail one of the Panzer IVs. It’s not enough and the tanks roll over RP E killing another two teams. RP E try to counter attack but, fearful of the tanks, decide to fall back instead while the tanks consolidate their gains. AP B passes their morale check and stays with the 2iC. Meanwhile, RP F unpins but RP G is not able to. The Engineers fail to add to their bridge this turn. The 2iC accompanied by the last remaining team from AP B advance to within assault range of the German mortar teams. RP E also advances while RP F takes up position in Green Platoon’s trench. AP B, 2iC and RP G all shoot at the German Mortar teams. They score 4 hits, not enough to pin them and fail to convert these hits into kills. 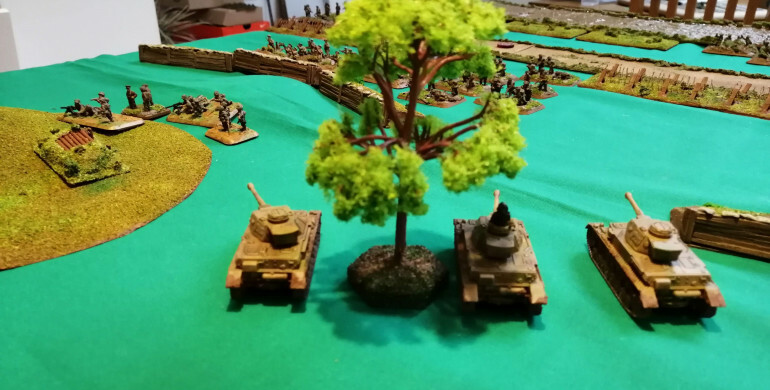 The tank support once again fails to hit anything and RP E’s bazooka hits a Panzer IV but fails to break the armour – had it, another bailed or destroyed tank would have left the tanks taking a morale check! Meanwhile, the US mortars repeat their bombardment against the tanks and cause a hit but can’t penetrate the armour. 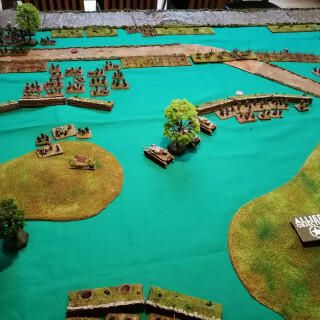 RP G fire their rifles at Red Platoon, killing one team but Red Platoon is looking likely to close in behind the 36th and close of their retreat. In defiance of the odds, the 2iC leads the last remaining team from AP B into assault against the German Mortars. The mortar teams fire with their rifles but fail to wound and the assault hits home. 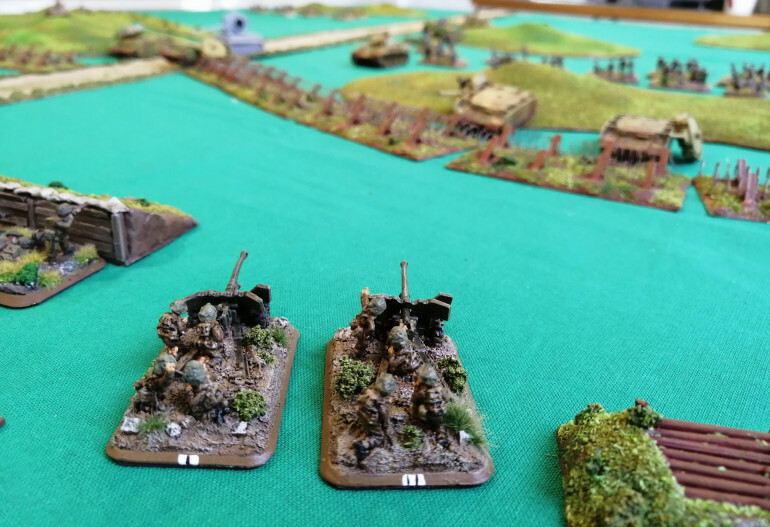 Between them, the 2iC and AP B kill two mortar teams. The rest of the mortar teams can’t stomach any more and fall back, leaving the 2iC and AP B to take their trench. Surely there will be commendations for the 2iC and AP B?? More importantly, that scores the US player another Victory Point! 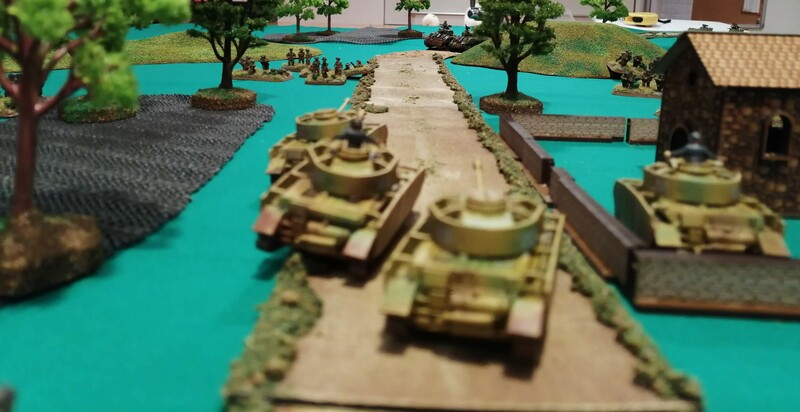 RP F decide to launch an assault against the two operational Panzer IVs. The tanks look to be expecting this as their 8 shots of defensive fire cause 6 hits and kill two of the teams, including the bazooka team. This halts the assault before it even starts and pins RP F in place! 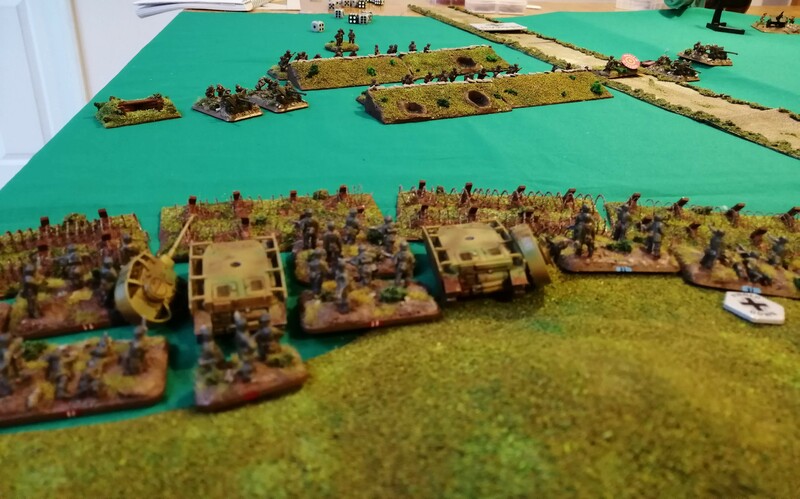 The bailed Panzer IV successfully remounts and the tanks continue their advance on the now almost defenceless 36th. 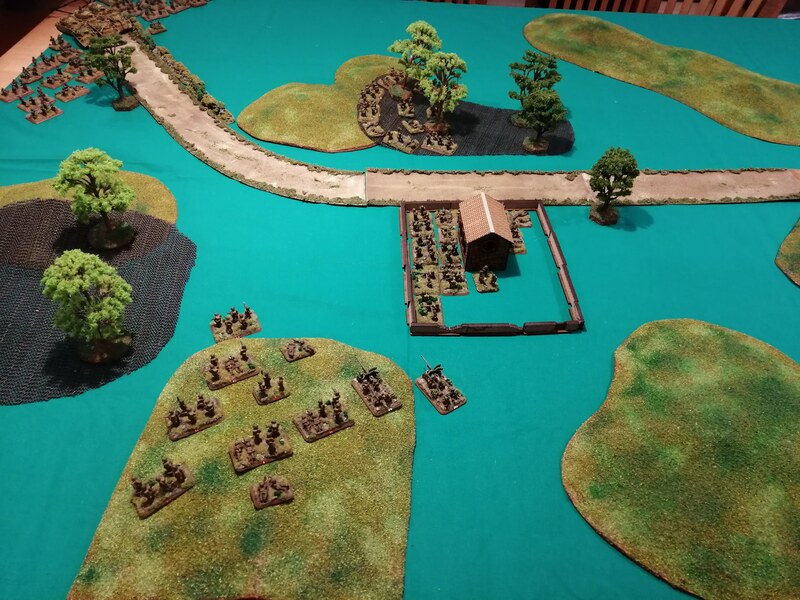 Red Platoon also continues to advance along the road, looping behind the 36th Rifle Platoons. Red Platoon fires upon the US mortar teams and kills another. HMG 1 gets line of sight to RP G and kills another two teams. 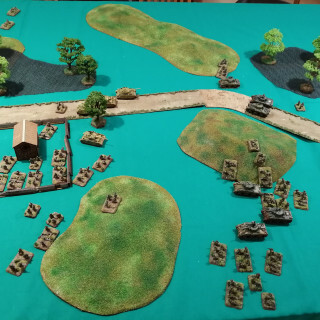 Black platoon and one of the Panzer IVs fire on RP G and between them kill three teams. RP E has taken massive casualties this turn! 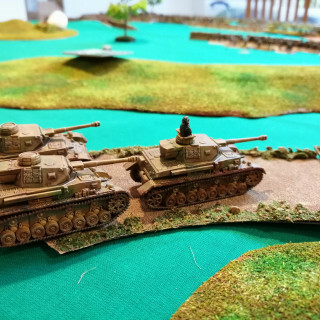 The two remaining Panzer IVs fire at RP F and kill two teams. 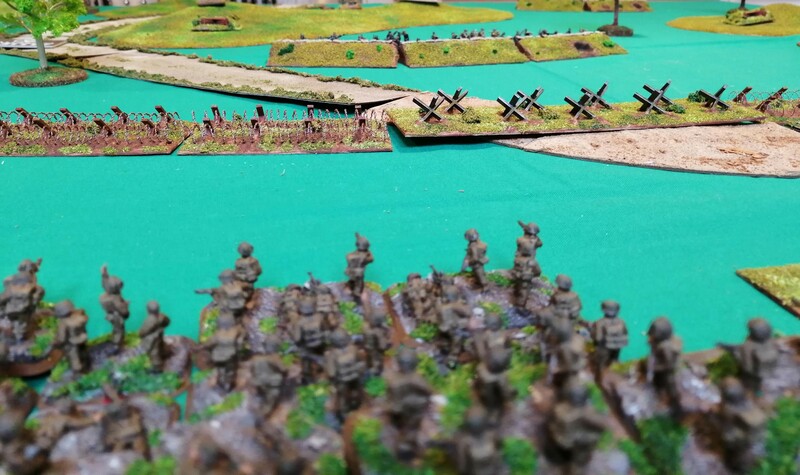 At this point, with the score standing at 3-2 in favour of the Germans, the 36th concedes. Apart from the Engineer platoon and RPF, all of the remaining platoons require morale checks to remain on the table. 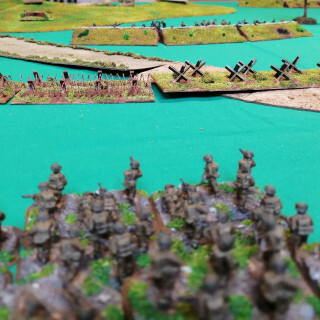 RPF is down to just a few teams and there is no way of countering the German armour. It was a valiant effort and 2iC and AP B should be commended on their heroic actions but, as in the real battle, losses for the 36th became so great that they had to withdraw. Indeed, the losses were so great that the remaining Infantry Regiment of the 36th was not sent over the Garigliano but was sent up river to support the 34th Infantry Division. With the huge number of casualties taken, Congress investigated the US Army after the war concluded on their conduct during this assault. 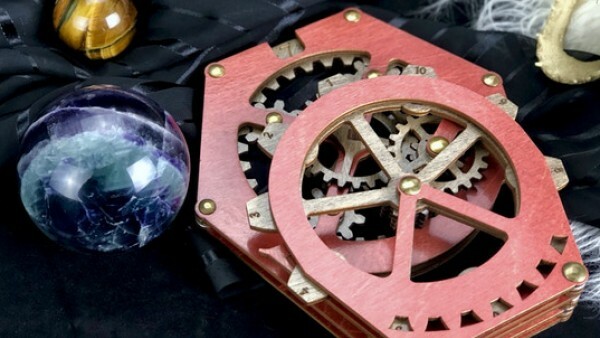 Once again, this project blog best read in reverse order. RPD unpins and passes its morale check to remain in place! The MG teams also unpin and pass their morale check. On the 36th right, a rousing speech clearly lifts the troops as both AP B and AP F both leap up ready to continue the assault. 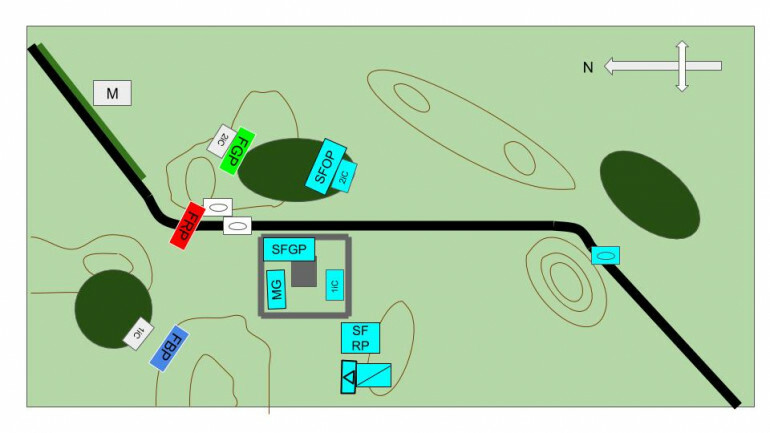 The last US rifle team deploys, RP G, and is fortunate to arrive toward the right flank as well, free from the minefield. There are now a lot of US forces on the right ready to go – can they push the advantage? RP E tries to gap the barbed wire and is successful – this removes the obstacle from in front of them although they cannot move further this turn. RP F also try to gap the barbed wire but fail. 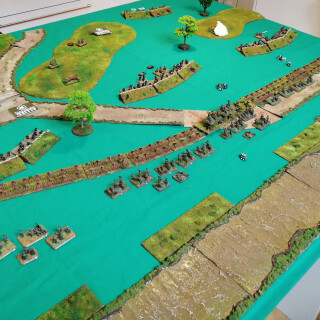 However, the remainder of AP B who have not crossed the entanglements make good use of the gap created by RP E and rush round and through, advancing on Green Platoon, still pinned down in their trenches! The newly arrived RP G waste no time advancing as well, heading through the newly formed gap in the barbed wire. RP D, now finally unpinned, moves up to join the remnants of RP C left seeking shelter in the tank traps. The Engineers make good progress on the bridge this turn, rolling 3 sixes to take the bridge score to 6! 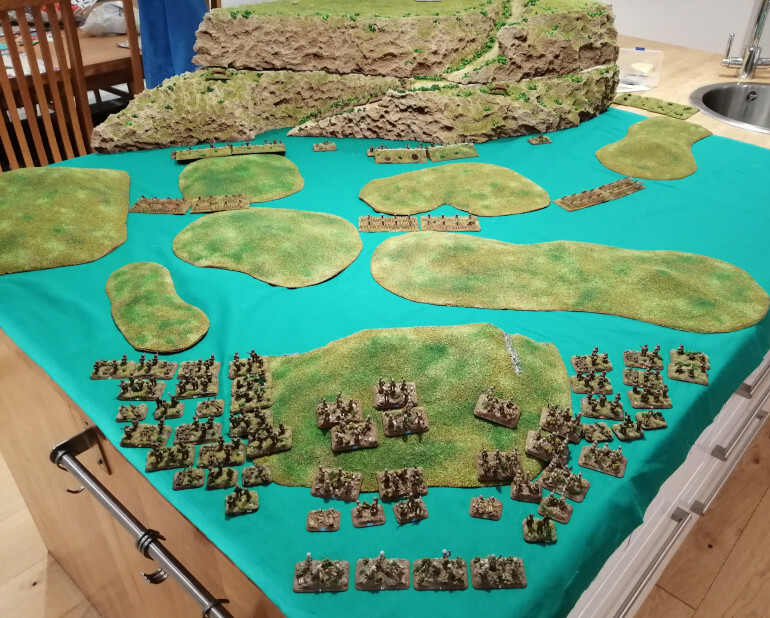 Just three more required to build the pontoon bridge and hopefully get some much needed armour support. 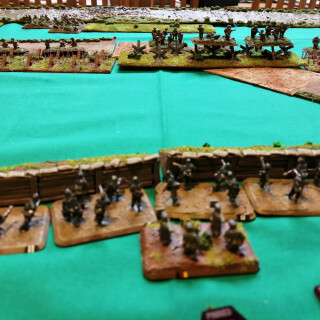 The two remaining MG teams continue to fire upon Green Platoon in their trenches and despite their reduced firepower, manage hit and kill one team. 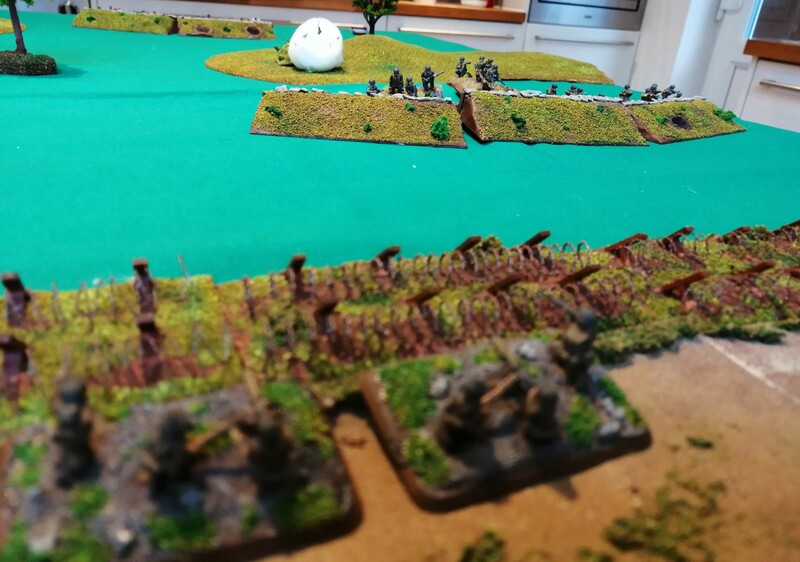 AP B, now within charge range fail to score any telling hits despite the flamers! The tanks again smoke the HMG nests and attempt to take out HMG 2 with a direct shot. It proves unsuccessful however the mortar team repeat their bombardment against Black Platoon and manage to kill a team. The 36th are finally starting to deliver some payback! 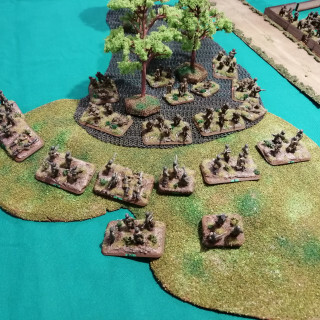 AP B, now in charge range of Green Platoon in their trench, has a choice to either sit in the open or charge and take a lot of defensive fire from both Green Platoon and HMG 2. 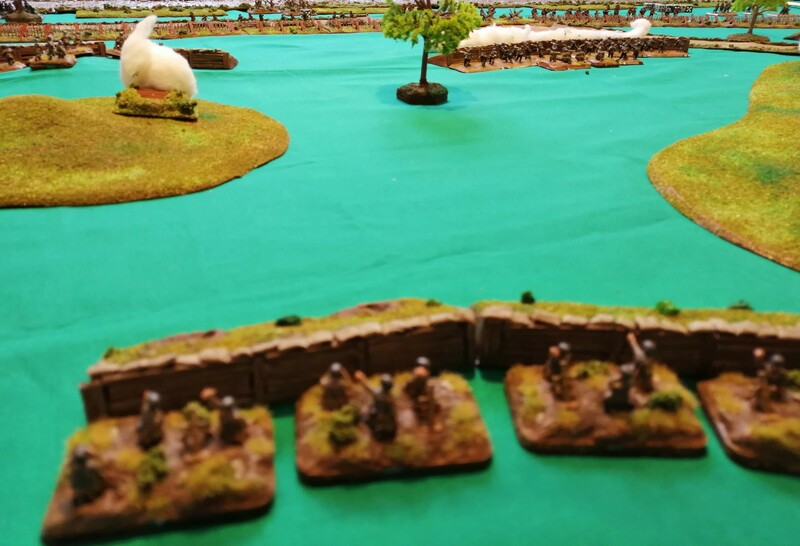 It’s a tough call but leaping up, waving his SMG, the 2iC urges APB forward into the assault! Green Platoon fire at the charging Americans but only manage two hits which are both saved. HMG 2 also opens fire but can only manage one hit which is again saved. 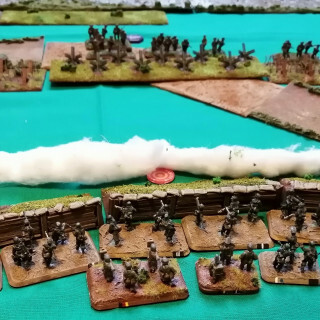 With no lost teams and not enough hits to pin the valiant Americans, they hurl their grenades and leap into the trenches to engage the Germans up close. 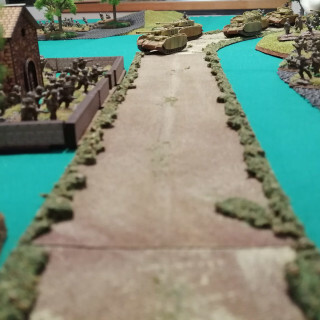 The assault is near flawless in its lethality and leaves just a solitary German team alive. The Germans counterattack but clearly dazed and bloodied from the assault, fail to cause any damage and the Americans finish off the job. 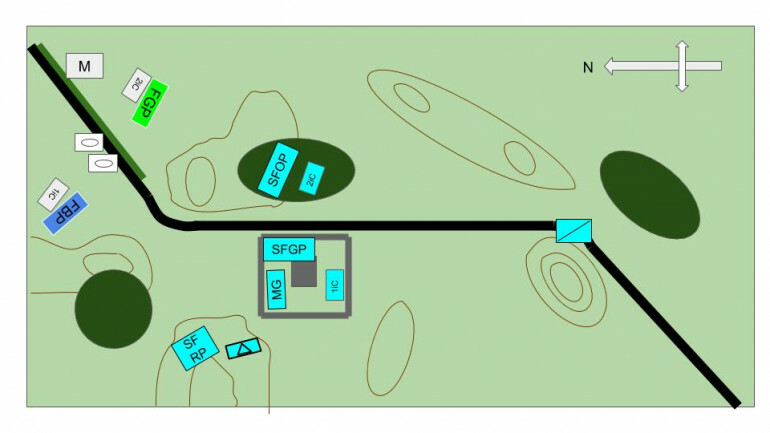 With all resistance removed, AP B can occupy the trench and consolidate their gain. 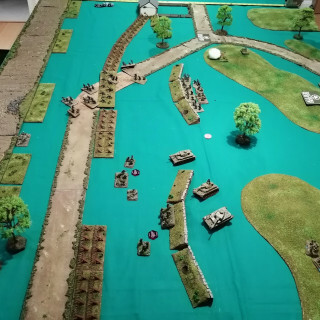 Suddenly, at the end of the 36th 5th turn, the heroics of AP B and 2iC have eliminated Green Platoon, gained their first Victory Point and started to expose the German left flank! 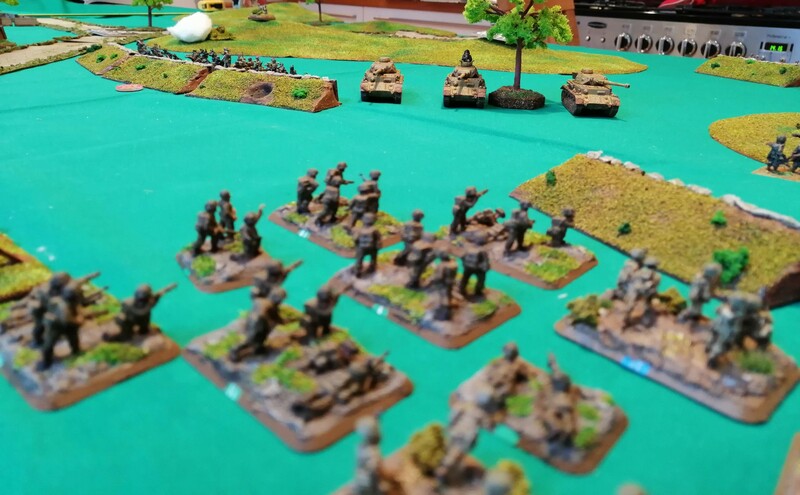 At the start of the German turn, Black platoon try to unpin but fail. Perhaps the events further up the trench line have them shaken? 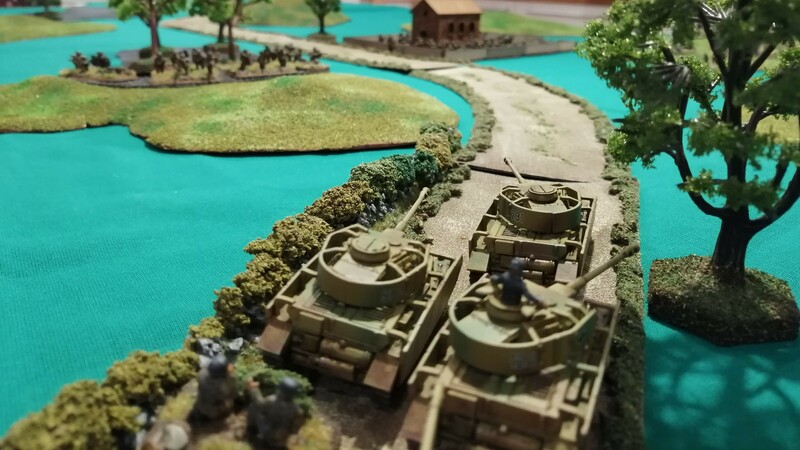 Visibly concerned, and wanting to plug the open hole in the trench line, the Germans deploy their three Panzer IV tanks on the road at the back of the board. 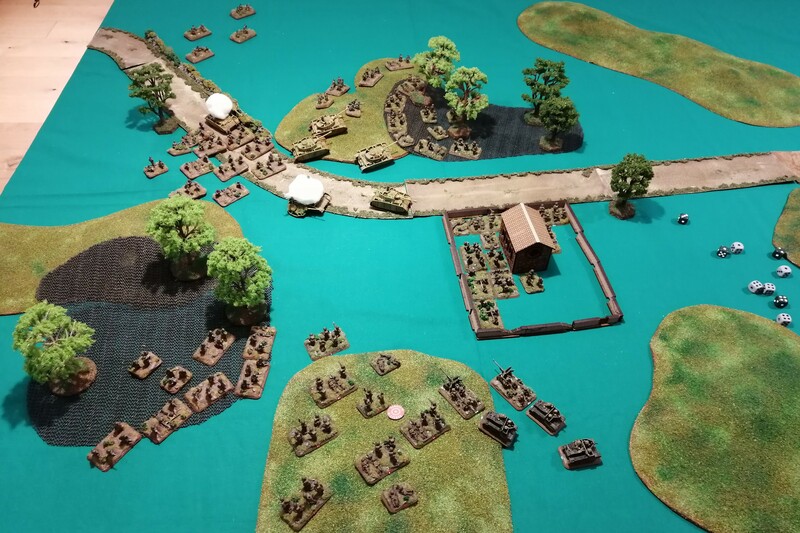 The tanks advance toward HMG 2 looking to provide some covering fire and head off the advancing 36th. HMG 2 continues to fire at AP B, as do the newly arrived Panzer IV’s, but with the added protection of being in the trench line, the incoming fire is a lot less punishing and AP B takes no further losses. The mortar team opts to change their bombardment point, trying to catch the massing US 36th behind AP B. They manage to range in on the second attempt and catch RP E, RP F and RP G all under the bombardment. The mortars fail to cause any wounds but do cause all three platoons to become pinned as they hit the dirt to avoid the flying shrapnel. 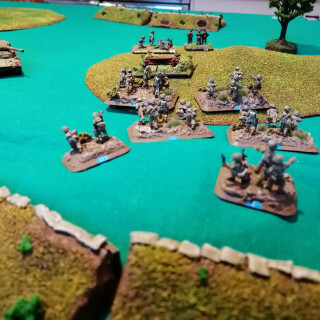 The previously reliable German shooting starts to falter and the remaining German platoons fail to cause any wounds despite a significant amount of fire power. However, HMG 1 is able to remove the last remaining team from RP C, removing them from the game completely to gain a second Victory Point and to take a 2-1 lead. RP D, reduced to two teams, passes their morale check and stays in the fight. 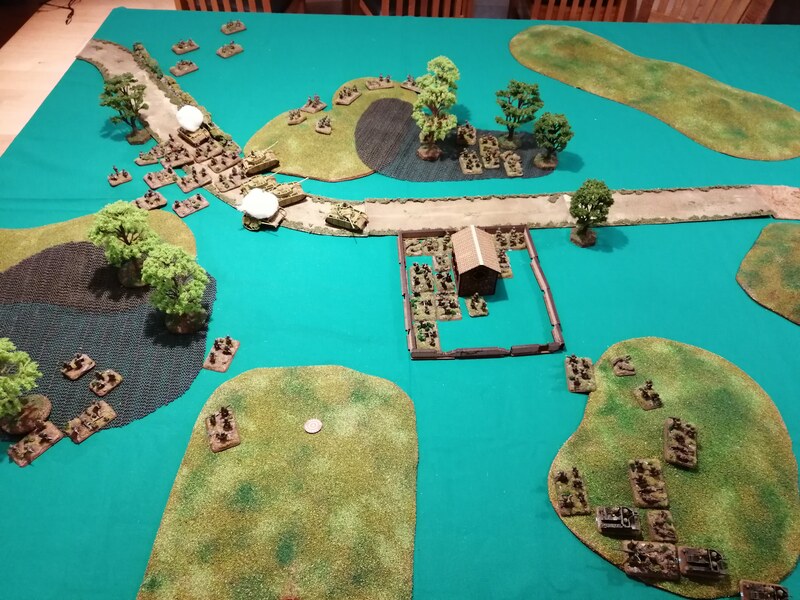 Further along the line, the two remaining MG teams fails their Morale and fall back, significantly reducing the firepower available to the 36th. Both RP E and RP G manage to unpin however RP F can’t lift themselves and remain pinned. Both RP E and RP G continue to advance toward what was Green Platoon’s trench. 2iC recognises the threat that HMG 2 causes to the advancing rifle platoons behind, and with adrenaline surging through their veins, leave the safety of the trenches and advance on HMG 2, hoping that their remaining flame thrower will be enough to take it out. 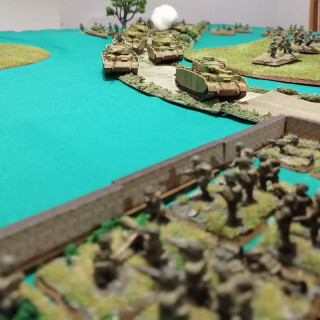 Meanwhile, in the centre, the now decimated RP D moves further into the tank traps to try to gain some advantage from the cover available there. The Engineer team continues with their attempt to build the Pontoon bridge but fail this turn to add to their bridge score. 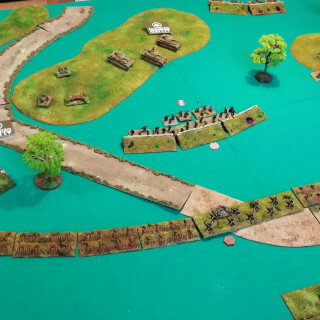 The Rifle Platoons fail to make their shots count this turn, missing just about everything. The mortar team however is able to destroy another team from Black Platoon with a further repeat bombardment. AP B, within charge range of HMG 2, uses their remaining flame thrower on the nest. This weapon is perfectly made for removing this type of resistance. With two shots and needing a 2 to hit, they roll snake eyes! AP B suddenly finds itself out in the open facing an HMG nest with three tanks heading toward them. The US tanks smoke HMG 2 to try to protect AP B as best they can. Once again, 2iC decides that attack is the best form of defence and he urges the men under his command to charge HMG 2. Despite the smoke, the nest causes 5 hits which is enough to pin AP B and cause the attack to fail. In addition, 2 teams from AP B are removed as casualties leaving AP B with just three teams, although the flame thrower team is still one of them. 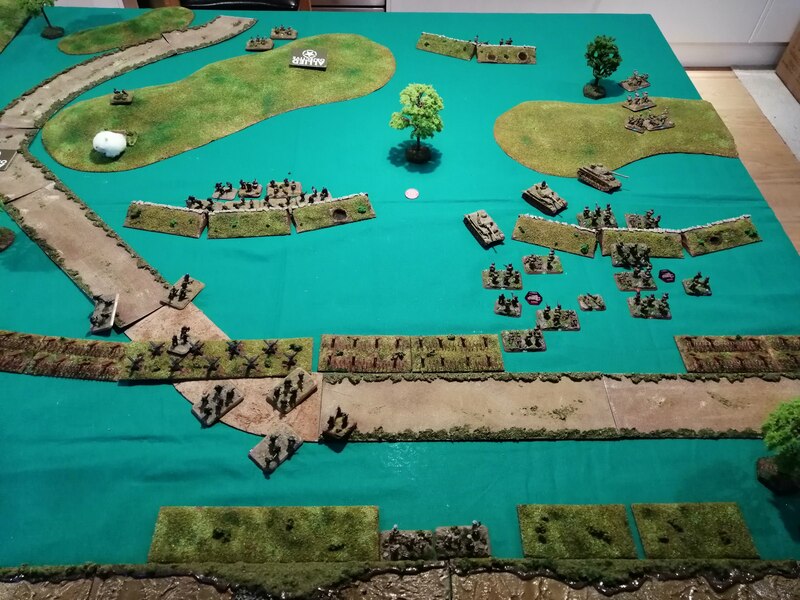 With the action now on the German left flank, the 15th PG decide to relocate Red platoon to support the now unpinned Black platoon in the centre. In doing so, they hope to sweep up between the barbed wire and the trench line and catch the 36th the side. The 15th PG 2iC also transfers from the Red Platoon trench to the Black platoon trench to reinforce the defences there. 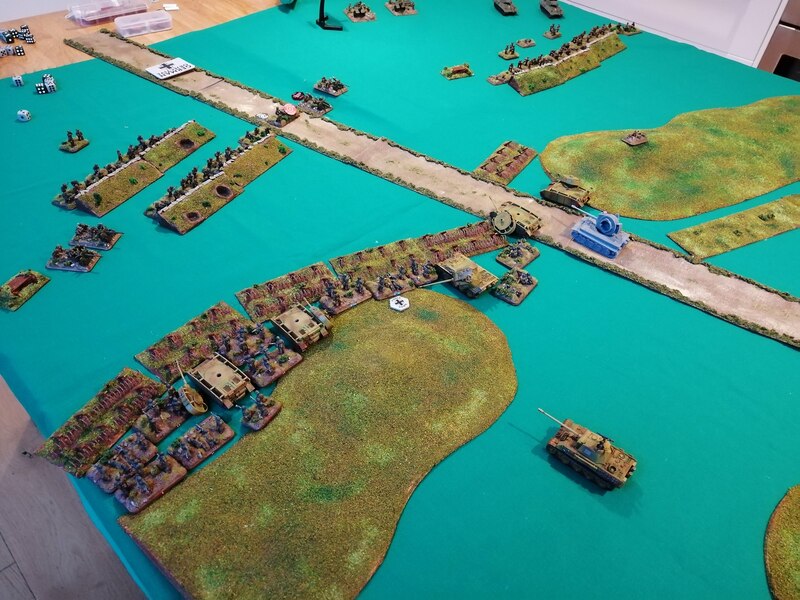 Further back, the Panzer IV’s continue to advance and draw within MG range of AP B.
HMG 2 continues firing at AP B and it looks as if AP B’s luck has run out as they lose another two teams including their command team and the flame thrower. It’s just 2iC and a solitary rifle team left! 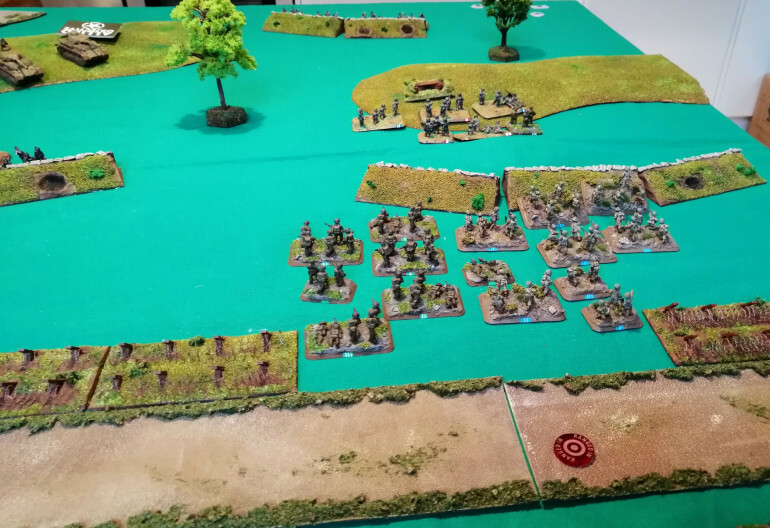 In the centre, Black Platoon kills another team from RP D while the rest of the German infantry shooting is largely ineffective. The tanks choose to ignore what’s left of AP B and concentrate their MG fire on RP E who are advancing up behind AP B. The tanks cause 5 hits, pinning RP E but can only kill one team. The mortar team attempts to target RP G and RP E, ranging in first time. One team from RP G is killed and the rest of RP G is pinned. Project best read in reverse order! Turn three sees desperately needed reinforcements arrive for the 36th. 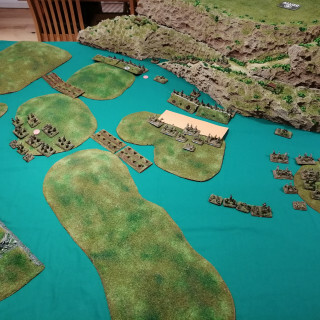 Assault Platoon B (AP B), accompanied by the 2nd in Command (2iC) rolls for their deployment and deploys alongside the Engineer team on the US right. 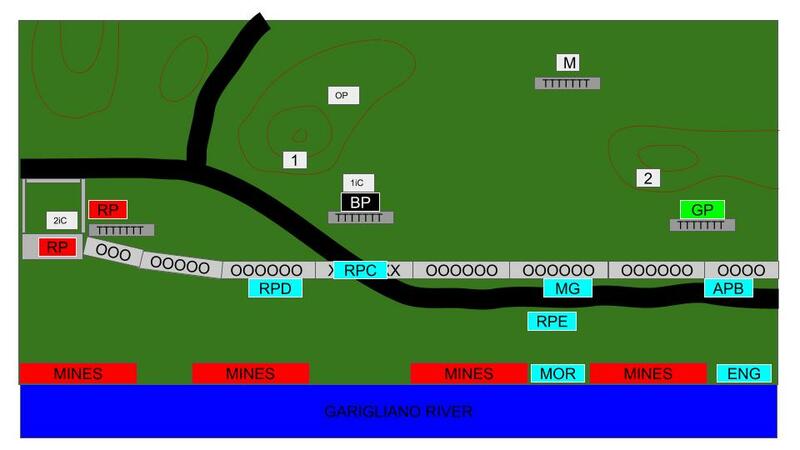 Rifle Platoon E (RP E) also arrives and their deployment roll is a 6, giving the US the choice on where to deploy, opting for the area clear of mines, just to the right of centre. During the starting phase, what’s left of AP A fails their morale check and they are removed from the battlefield. RP C unpins but RP D and the Engineers remain pinned down by the incoming fire. The newly arrived platoons waste no time in getting forward. AP B advances past the pinned Engineers up to the barbed wire, bravely putting themselves between the MG’s of Green Platoon and the Engineers. RP E advance along the road up behind MG teams, looking to add their fire power to the advancing AP B.
RP C, now unpinned, inch forward and are able to move the bazooka team within range of Black Platoon in their trenches, with the hope that the improved firepower might be able to punch through. The Engineer team, still pinned and therefore rolling only 2 dice can’t add to the bridge score, which remains at 3. With the movement complete, the 36th look to deliver some payback to the defenders. 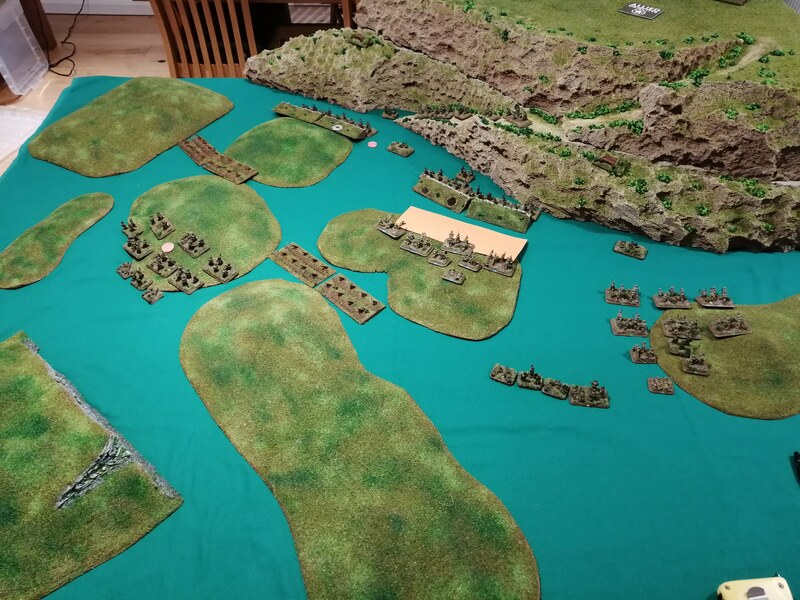 Both AP B and the MG teams open up on Green Platoon. A lot of hits are scored but the bullet proof cover saves the defenders from losses but Green Platoon end up pinned. RP C and RP D both fire on Black Platoon but fail to score any hits. The bazooka team of RP C need a 6 to hit and gets it! 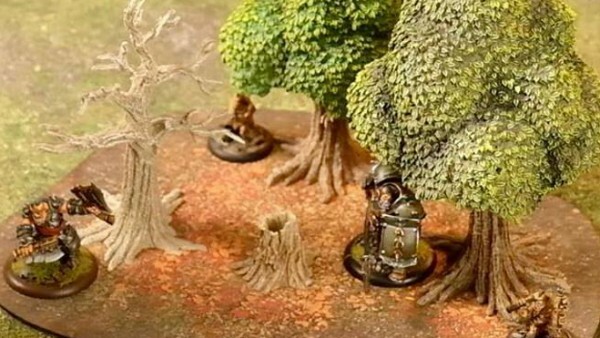 Black Platoon fail their saving throw but are saved by their bullet proof cover, ending up being showered with mud, splintered wood and debris taking just minor wounds. The mortar team launch a repeat bombardment but having used their smoke bombardment, use explosive shells instead. The repeat location is not ideal for this, being placed for smoke in the previous turn but guarantees hitting and still catches five of Black Platoon. 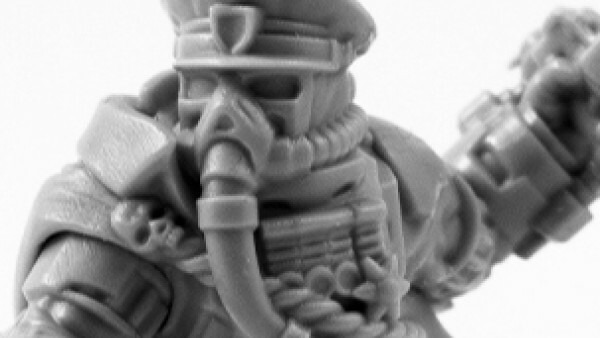 It fails to cause wounds but does pin Black Platoon down. Finally, the tank shots manage to smoke both of the HMG nests again. At the end of the 36th 3rd turn, as in the real battle, their progress has been kept contained by the defenders and their losses are high. 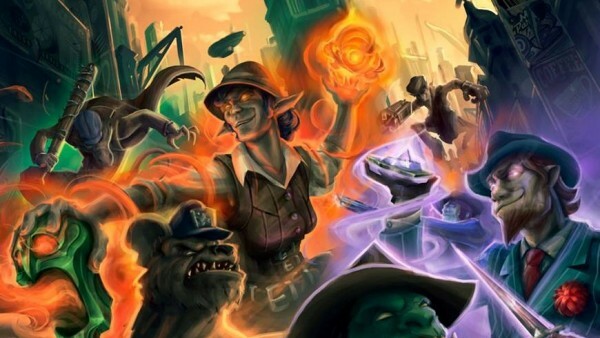 It looks as if history will repeat itself on the tabletop. The 15th PG roll to unpin their units and succeed with the Mortar team and Black platoon however Green Platoon fails and remains pinned. There is no point in moving out of the entrenched areas and so 15th PG moves straight to the shooting phase. Green Platoon splits its fire upon the AP B and the MG Teams. They score 4 hits against AP B but all are saved and not enough to pin the unit. The MG teams fail a save and lose one team and are reduced to three. 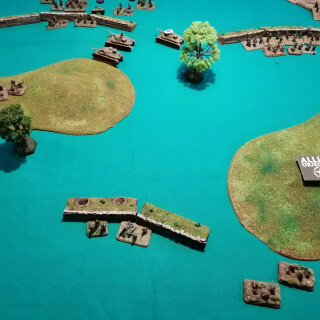 HMG 2 attempts to pour fire into AP B but misses all of its shots! Black Platoon splits its fire against the MG teams and RP C. The MG teams survive but end up pinned by the weight of incoming fire power. The fire from Black platoon into RP C is joined by HMG 1 and together they kill a team and pin the remainder of the platoon. Red platoon fires on RP D killing a further two teams. The mortar team, now unpinned, can begin to rain shells down upon the beleaguered 36th. 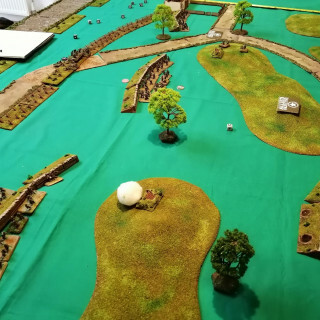 The spotter on the hill calls in a bombardment against AP B and manages to range in and land a number of hits against the platoon, killing one team. AP B, who had been grimly advancing against the incoming MG fire, hit the deck when the shells land and are pinned. 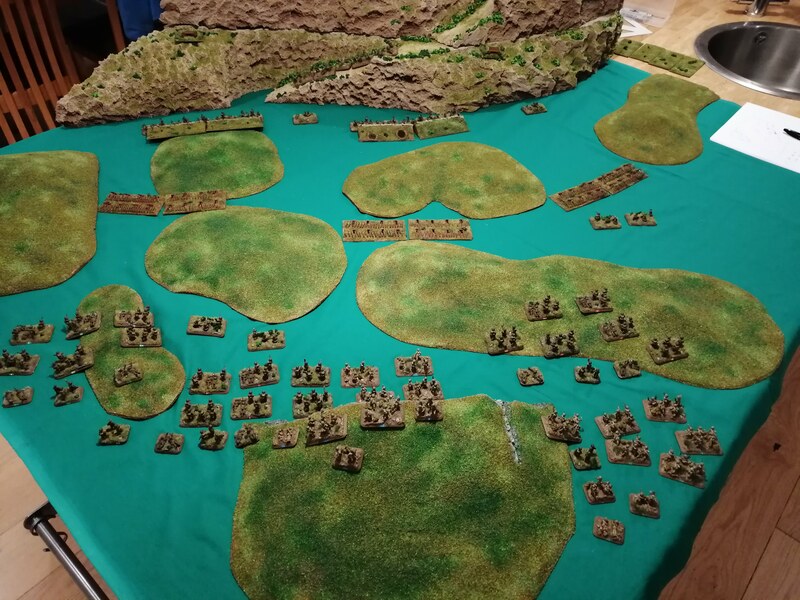 With nearly the entire 36th pinned down, it is imperative that the US command can get their troops up and advancing again to have any hope of salvaging the assault. Fortune favours the 36th and AP B, RP C and the Engineers are all able to get up and get moving. RP D and the MG teams however remain pinned. RP F is allowed to deploy and arrives with the Company 1st in Command (1iC). 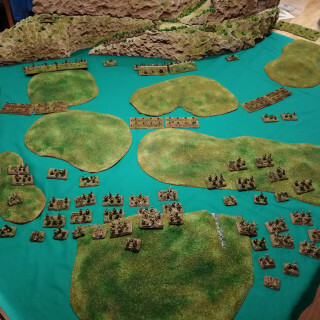 Their deployment roll sees them fortuitously arrive alongside the Engineers, which will allow the 36th to really concentrate their assault up the right flank. AP B attempts to cross the barbed wire entanglement and three teams manage it, including a flamer team but the rest of the platoon stop on the wrong side of the barbed wire. RP F is able to advance up behind AP B.
RP E moves up to the barbed wire between the MG teams and AP B and prepare to cross the following turn. Meanwhile, the engineers are not able to advance the pontoon bridge further this turn. The tanks shoot first in the shooting phase and are able to smoke both HMG nests again. 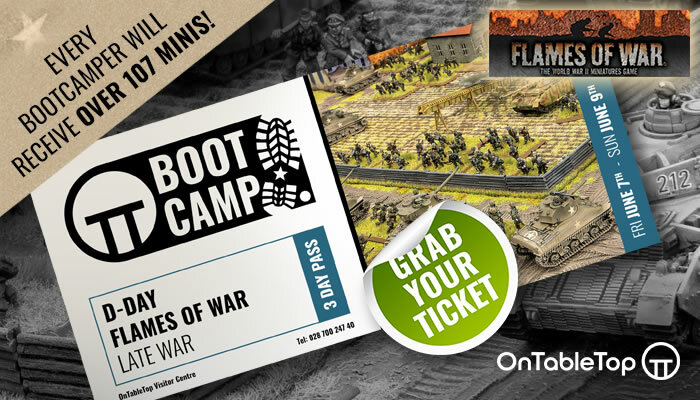 This will definitely provide some much needed cover for the advancing infantry platoons. 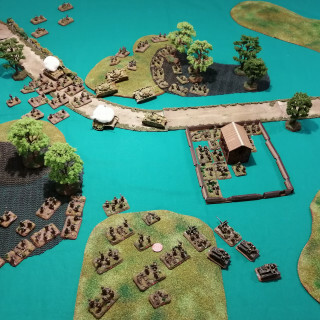 RP F, supporting AP B, are able to shoot just the once for fear of hitting AP B in front, Clearly the team taking the shot contains the platoon sharpshooter as they kill a Green Platoon team despite needing a 5 to hit, a 2 or less to not save and 6+ fire power check! AP B are able to shoot and are in range with the flamer! The rifles miss however the flamer team is able to carry out its grisly task and destroys another team from Green Platoon. All of a sudden, Green Platoon has lost a third of its strength! 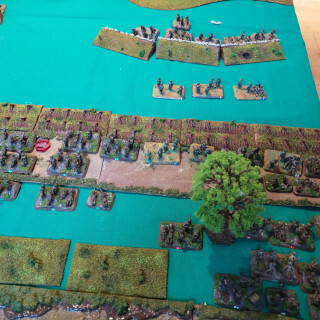 The rest of the 36th shooting was ineffective although Green Platoon was pinned down by the MG teams and Black Platoon is again pinned by the mortar team. 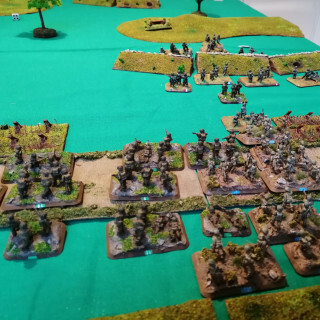 Black Platoon is able to unpin however Green Platoon, perhaps because they know a fiery death awaits the other side of their trench, keep their heads down and remain pinned. 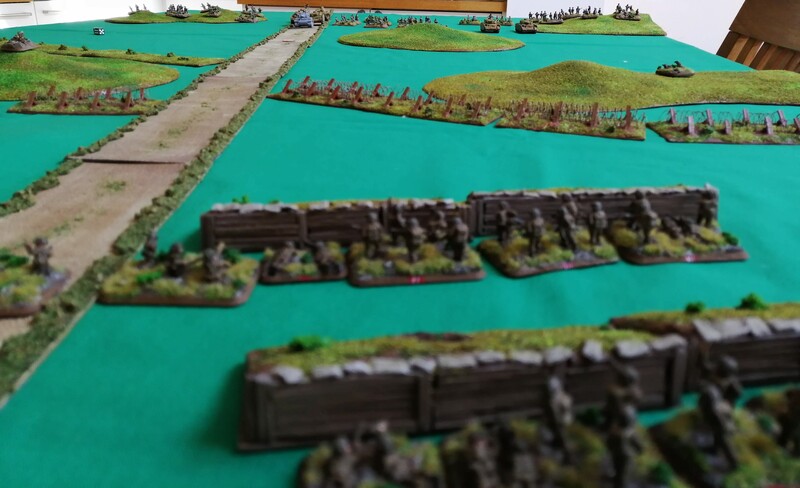 The rest of the 15th PG remain in place although the HQ are looking nervously toward their left flank and the gathering 36th troops – should they redeploy their right flank or remain in their trenches….? Red Platoon kills another team from RP D. HMG 1 and Black Platoon fire upon RP C failing to wound but pinning them in place. Black also fire upon the MG teams and destroy another team reducing the MG teams to half strength. 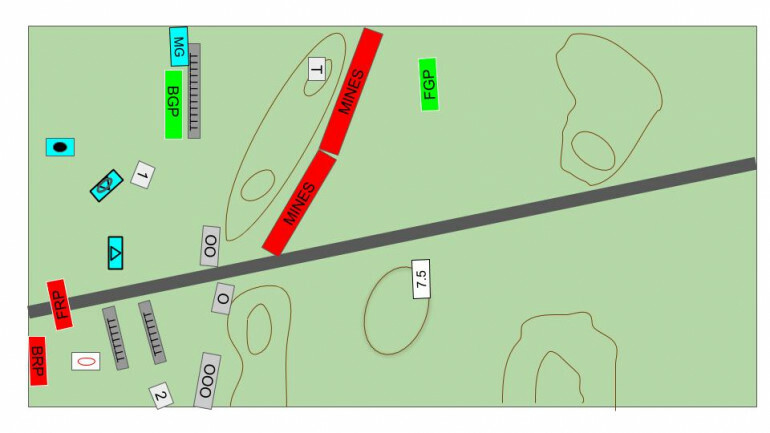 Attention shifts to AP B in front of Green Platoon’s trench. Green Platoon, despite being pinned, can still mange 8 shots but only hit three times with all of these being saved! HMG 2 also opens up on AP B having more luck and killing another team. The mortar team repeats the bombardment and despite not causing a wound, does manage to pin AP B in place. The mortar team also catches RP F, pinning them as well. At the end of turn 4, the 36th find themselves almost destroyed in the middle, with RP C down to 3 teams and RP D down to just a single team. AP B has lost two teams but still has both flamer teams in place and are still being led by the company 2iC. They also have support on their right from RP E, RP F and the now half strength MG Teams. Is this weight of numbers going to be enough? 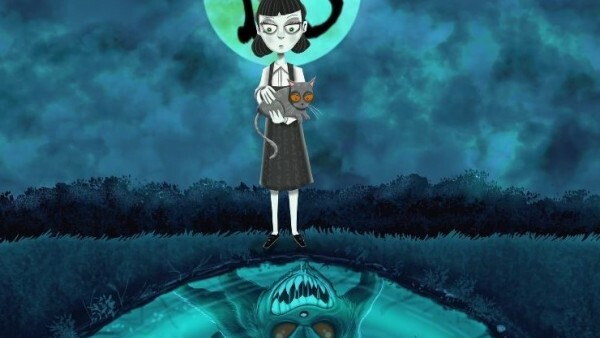 Just a reminder that this project is best read in reverse order! I’d also like to point out that there has been a ‘mix up’ in the supplies and the US 36th (Texas) Infantry Division has received uniforms, weapons etc meant for British X Corps. This explains why all of the models that are US troops look suspiciously like British but, if you listen carefully, you can definitely hear the Texan drawl coming from the soldiers. As the Attacker, the 36th Infantry go first. 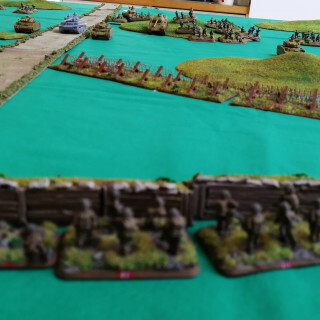 Faced with a large amount of German fire power, the 36th knows they need to advance quickly as being left out in the open without cover is certain death. RP C starts to advance toward the tank traps covering the road, seeing an opportunity to pass quickly through this gap but immediately loses a team to the minefield. The rest of the platoon do make it and gain some bullet proof cover. AP A looks to get forward quickly to make use of their flame throwers and looks to advance on the barn. Unfortunately, two teams are lost to mines so the platoon is already reduced to 4 teams plus the command team. 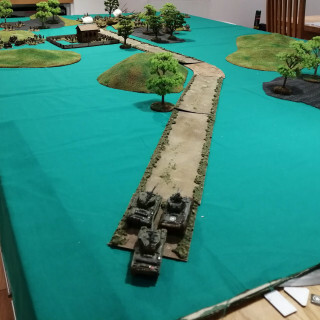 RP D are able to advance straight up the board, looking to provide support to either the RP C or AP A, depending on how each platoon fares against the defenders. 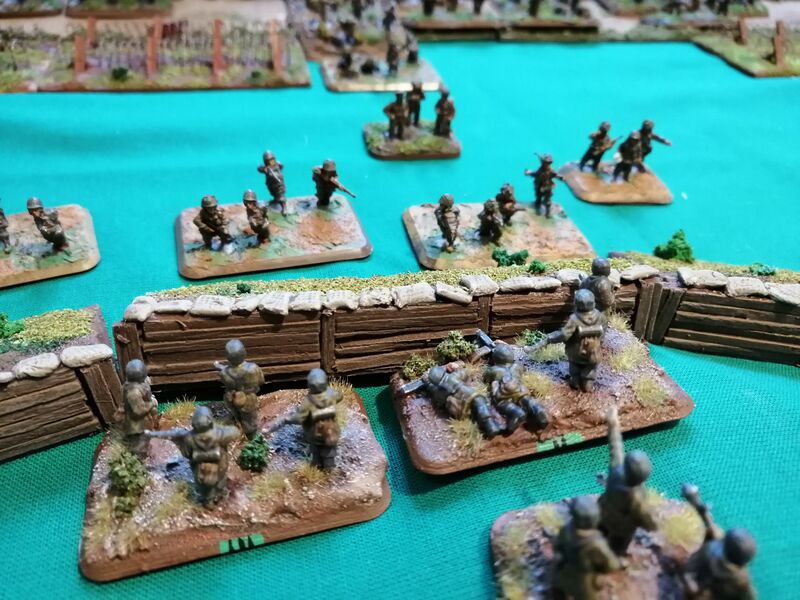 Meanwhile, the mortars decide to stay put while the 4 MG teams advance up to the barbed wire, intending to dig in there and provide covering fire. 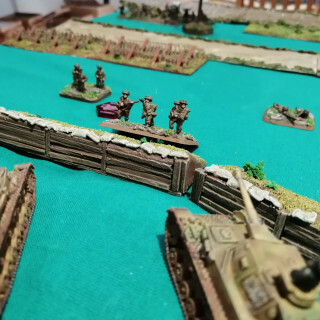 The engineers, who fortuitously landed on the far right of the US flank and out of reach of a lot of the German guns go to work on starting the pontoon bridge. 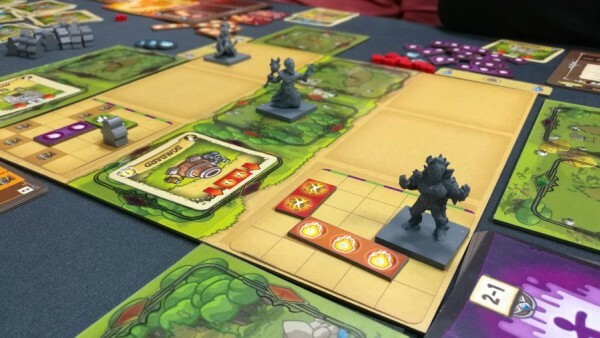 With six functioning teams, they were able to roll a dice per team and got two sixes, so off to a good start toward completing the bridge and being able to bring in some much needed armour. During the shooting phase, the US failed to cause any wounds against the dug in and gone to ground defenders however the supporting tanks were able to fire smoke at HMG nest 2. 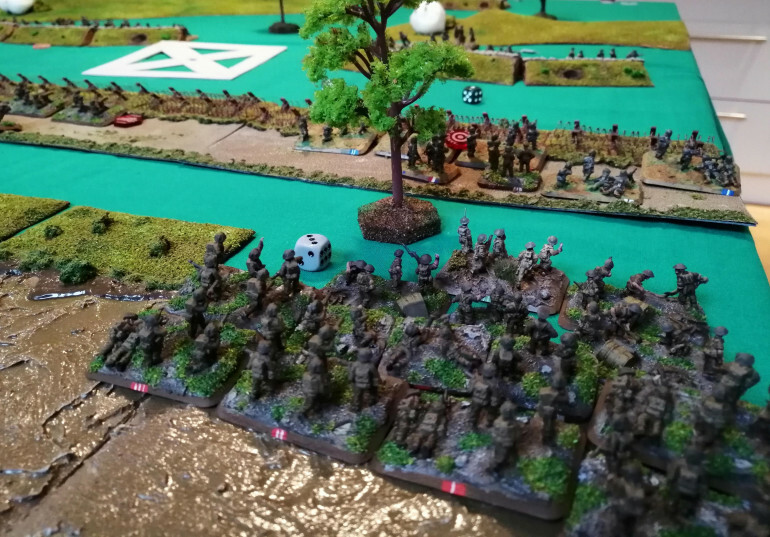 The German defenders start the game pinned due to the artillery and mortar barrage sent in before the assault, so before any return fire can be attempted, the defenders need to test to unpin. The 15th PG are rated as Confident Veteran and so need a 4+ to do this. All platoons are successful except for the mortar platoon, HMG 2 and black platoon. There’s no need for any movement from the Germans who begin to open up on the 36th. 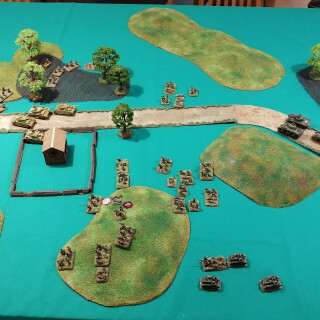 Red platoon splits its fire between AP A and RP C. RP C survives intact but perhaps fearful of the flame throwers coming their way, Red platoon is more successful against AP A and kills 2 teams and pins the remainder of the platoon under a withering hail of fire. To add to AP A’s woes, one of the destroyed teams were carrying a flame thrower, significantly reducing their effectiveness. The pinned black platoon’s shooting against RP C is ineffective however Green platoon fares better against the engineers, killing one team and pinning the rest of the platoon. The HMG nests open up with HMG nest 1 cutting down 2 teams from RP C and pinning the rest of the platoon. The pinned and smoked HMG nest 2 however is less effective against the engineers and fails to hit anything. At the end of the first turn, the 36th are already taking heavy losses. AP A is already down to just 2 teams and their cmd and is pinned down in the open. RP C is at half strength and pinned down although at least has the benefit of being in bullet proof cover. The engineers have lost a team and are also pinned. The bad luck continues for the 36th as all of the pinned units fail to unpin and get moving. This leaves AP A horribly exposed in the open, albeit concealed as the unit can’t move this turn. RP D, who survived the first turn unscathed, advance as far as the barbed wire but are unable to cross this turn and so must halt. The Engineers attempt to continue with the pontoon bridge but with 5 teams who are pinned, can only roll 2 dice but still manage to roll one more 6 taking their bridge score to three! Heroic stuff while under fire. The 36th then return fire. RP D manage a few hits but the bullet proof cover stops any casualties. The tanks manage to land smoke on both HMG nests which might prove critical in the following German shooting phase given the exposed nature that some of the 36th platoons find themselves in. 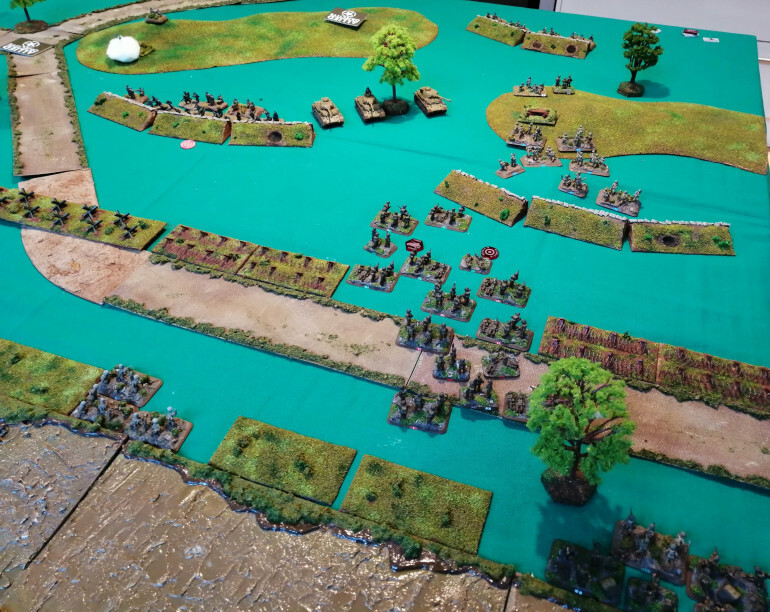 RP C’s shooting is wholly ineffective however the MG teams pour a deluge of fire into the Green platoon killing one team and causing enough hits to pin the platoon down. The US mortar teams, having remained stationery, are able to launch a bombardment. 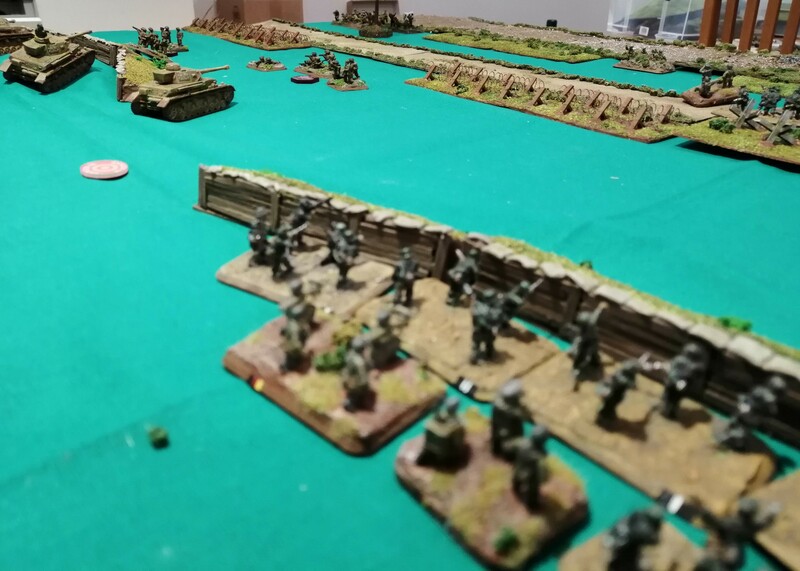 Recognising the situation, they land a smoke screen in front of black platoon, providing some cover for the advancing Rifle Platoons. The 15th PG start their 2nd turn by unpinning all their platoons except the mortar team, who remain pinned and unable to fire this turn. The German 2iC moves up to join Red Platoon and 1iC moves up to join Black platoon to reinforce the defences and provide additional morale if needed. Green platoon continues to pour fire into the engineers and manages to kill another team reducing the engineers to 4 teams and their command. Green platoon also takes some shots at the MG teams but fails to cause any damage. 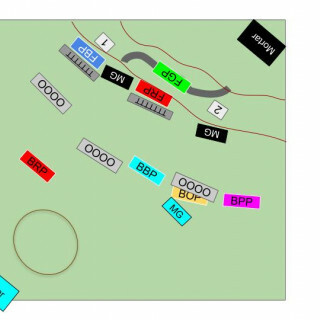 In the centre of the line, Black platoon splits their fire against the MG teams, RP C and RP D. The MG teams escape harm however RP C loses another team from the withering hail of bullets, as does RP D.
From the barn, Red platoon splits its fire between AP A and RP D, hoping to finish AP A. The hail of fire cuts down 2 teams from AP A, leaving just the cmd team while RP D also suffers the loss of two teams and gets pinned by the incoming fire. Things are now looking dire on the US left flank. Thanks to the smoke, the two HMG nests are ineffective this turn failing to cause any casualties. 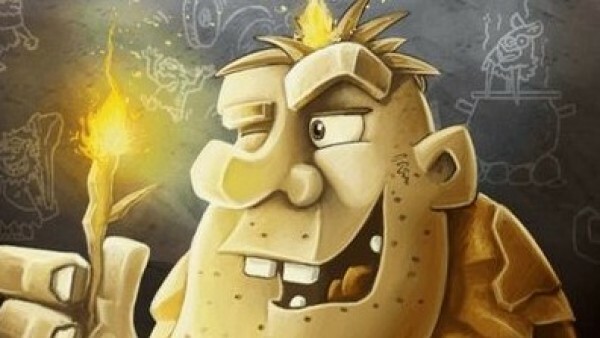 It’s time to stop the history lessons and start gaming some of the battles. For our first battle, we will look at the US 36th (Texas) Infantry Division’s ill fated crossing of the Garigliano. The assault started on the 20th January 1944 and lasted several days before the 36th was withdrawn due to the high casualty rate. 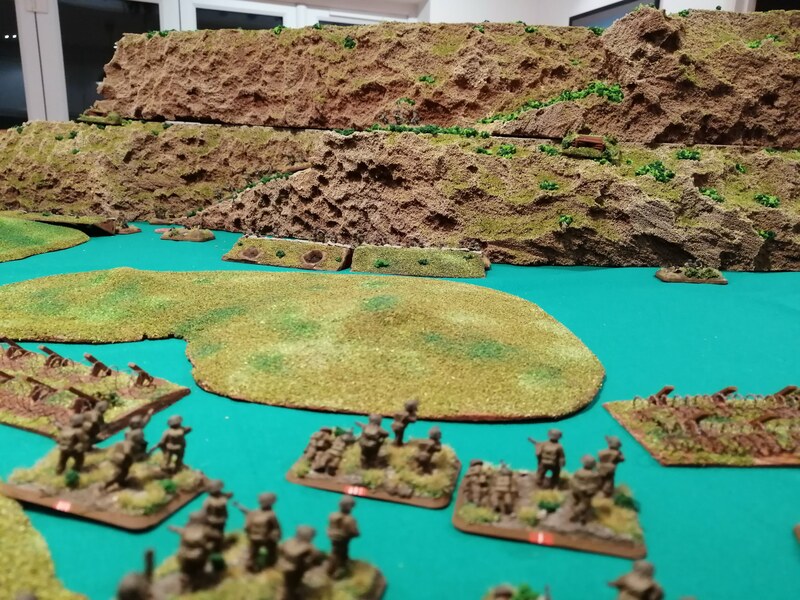 The 36th had seen a lot of action since arriving in Italy having been heavily involved in the Salerno beach landings as well as the costly assault on San Pietro Infine less than six weeks earlier. In addition to the above, all infantry teams are within trenches/fortifications. Tank traps block the road while barbed wire entanglements are positioned in land from the banks of the river. 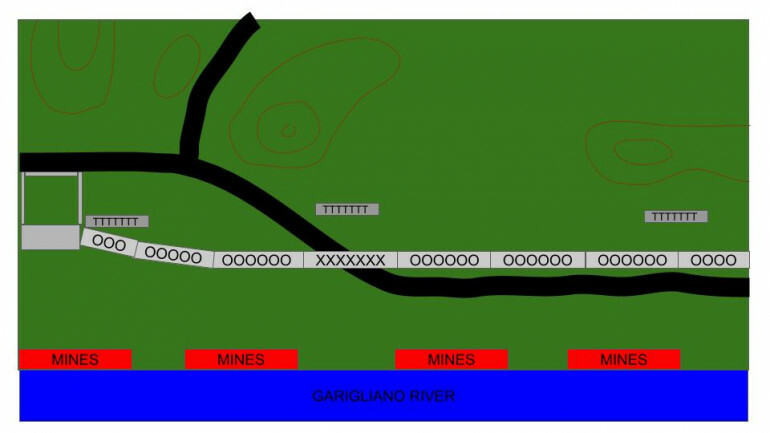 Minefields have been placed along parts of the river edge. In addition to the above, Sherman tanks on the other side of the river are providing some fire support. In game terms, this is represented by a total of 3 shots from a Sherman each round, firing at long range. If the Engineer Platoon completes the pontoon bridge during the game, the Shermans can join the battle. I’ve created some pictures of the battlefield to supplement the photos. 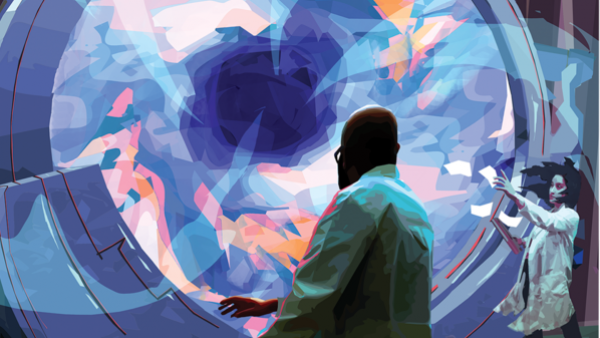 In the images, North is at the top. The River Garigliano runs along the bottom with the black line being the dirt road. On the left (West) the grey box is a barn with stone walls behind. The brown lines are hills while the red boxes are minefields. 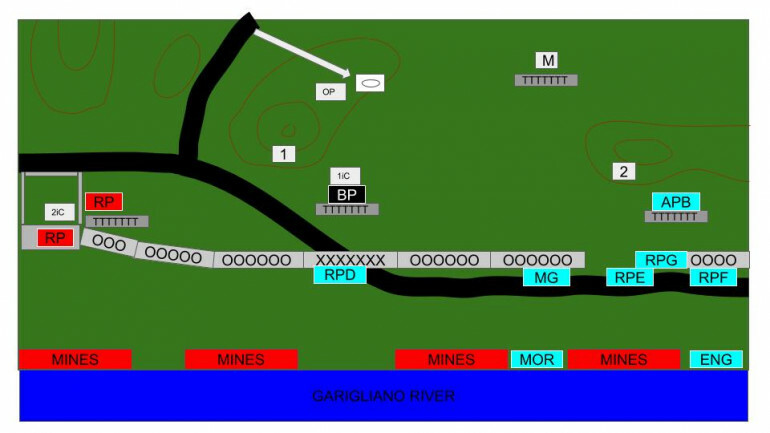 Grey boxes marked OOO are barbed wire and those marked TTT and tank traps. 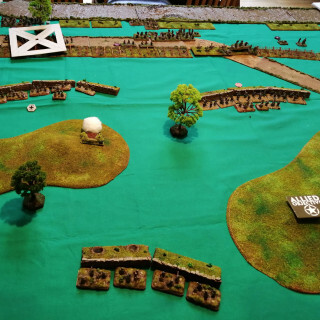 To try to recreate the battlefield more accurately, we will introduce the following rules and victory conditions. The 15th PanzerGrenadiers have had time to dig in and prepare their defences. 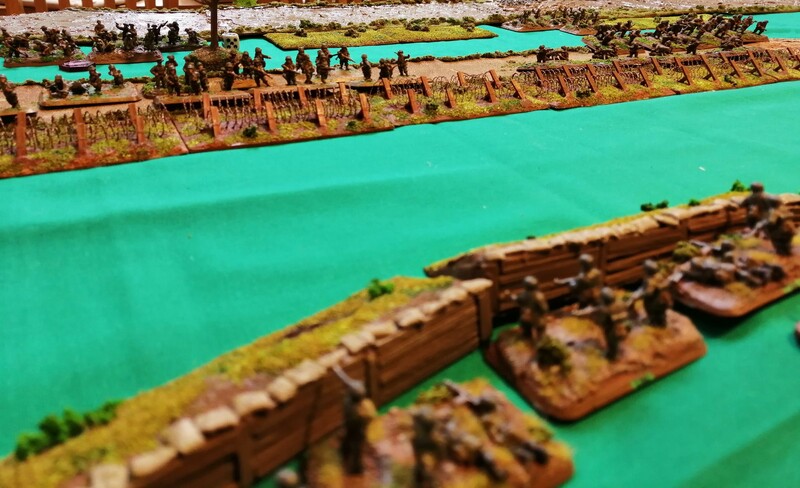 All infantry platoons start the game within trenches offering concealment and bullet proof cover all around. 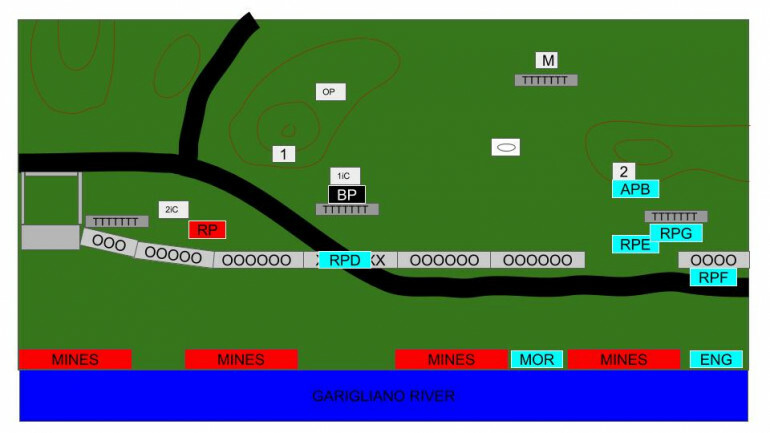 The defenders have been able to mine the river banks and can place 4 8”by2” minefields anywhere along the river bank. 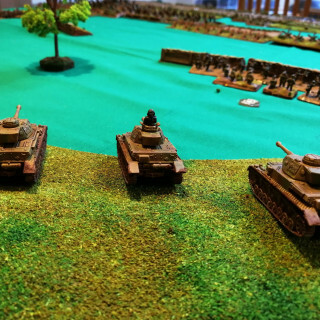 The 3 Panzer IV tanks must be placed into reserve. 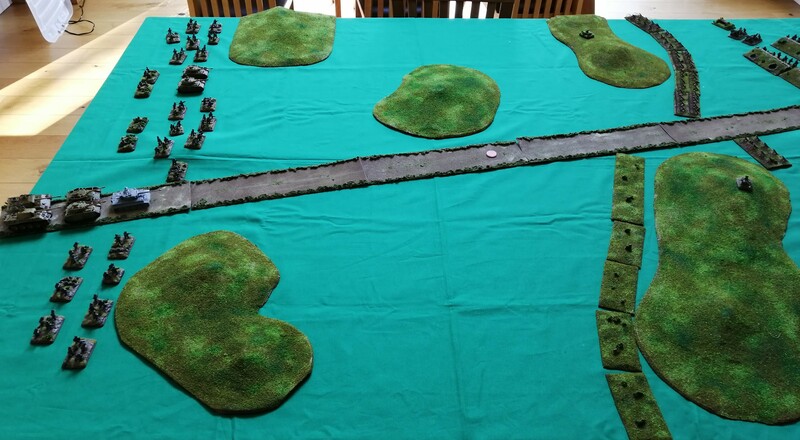 They can only enter the battlefield if it is Turn 4 or later AND at least one of the trenches have been overrun by US forces. The tanks must enter the battlefield using the road on the German side of the battlefield. This represents the limited number of tanks available and to only be committed to plug gaps in the line. The German forces have been subject to a significant artillery and mortar bombardment prior to the battle commencing. All German forces start the game pinned down. 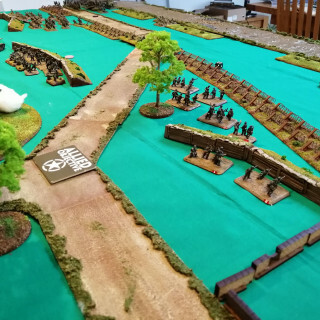 The 36th Infantry Division are trying to create a bridge head. 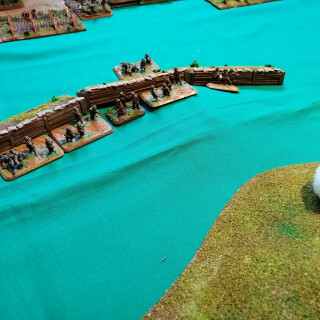 To assist in this, they need to build pontoon bridges to allow the supporting armour to cross the river. The Engineer platoon is tasked with building the bridge and at the start of each movement phase may elect to commit any number of teams to the task. For each team committed, a dice is rolled with any result of a 6 adding one to the bridge score. Once the score reaches 9, a bridge is in place. Engineer teams that move or are not within 2” of the river cannot assist in building a pontoon bridge. Teams building a pontoon bridge cannot shoot. 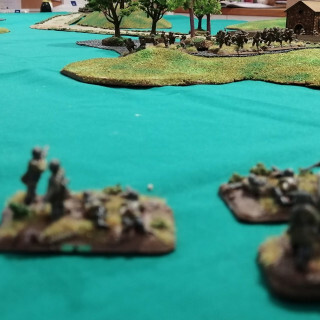 If the platoon is pinned, half the number of dice to be rolled, rounding down. 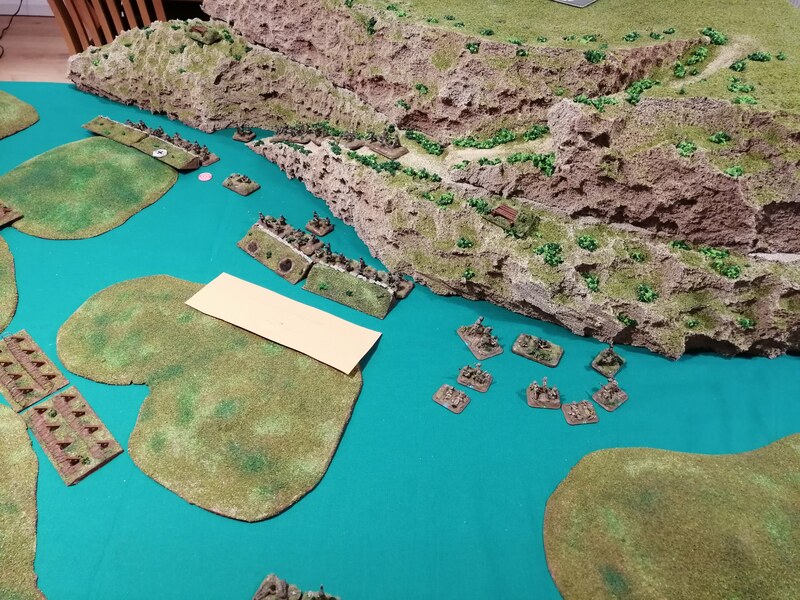 Due to the fast flowing river water and the difficulty in crossing while under fire, US deployment is randomly determined by rolling dice. 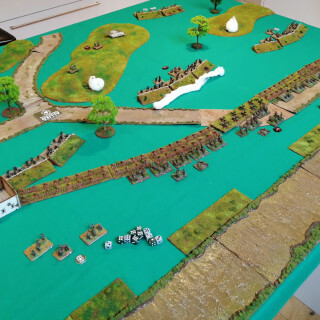 The table edge is 5’ in length and a first dice is rolled to determine which foot, measured from the US left flank, the platoon arrives, with a roll of 6 allowing the US player to choose exactly where the platoon can arrive. If the result is 1-5, randomly determine which inch of the foot the cmd team should be placed. 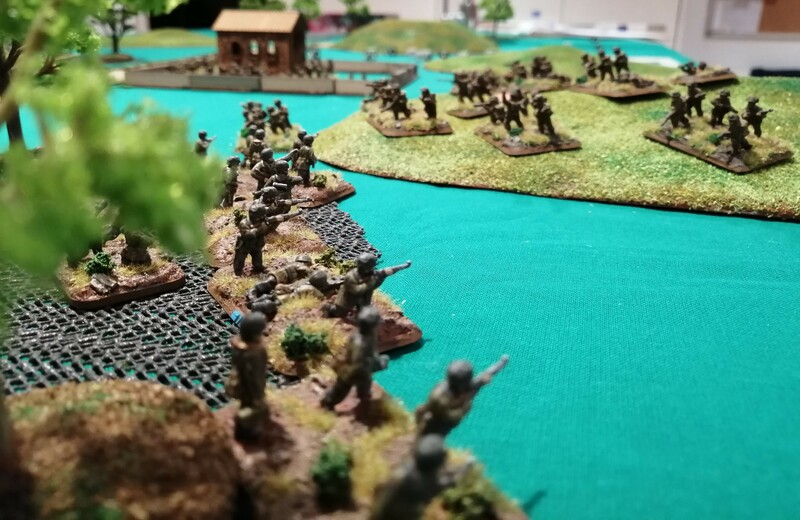 The rest of the platoon must be placed in base contact evenly around the cmd team no more than two teams deep, spreading out along the bank as necessary. The 36th receives 3 shots per round from the supporting Sherman tanks on the far side of the river. This is always at long range but there is no limit to how far these guns can fire. It is assumed that the Sherman tanks are dug in and stationery. 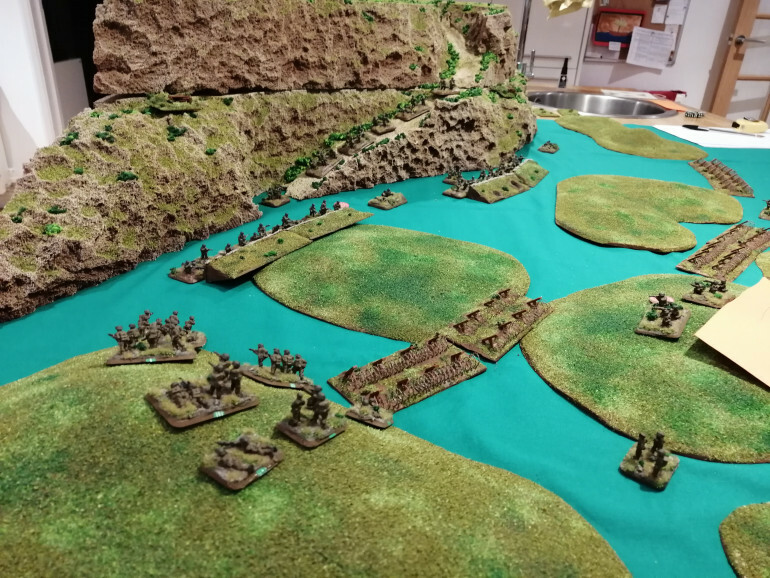 If the Engineers get a total score of 9 on their pontoon bridge score, they can roll for armour reserves. 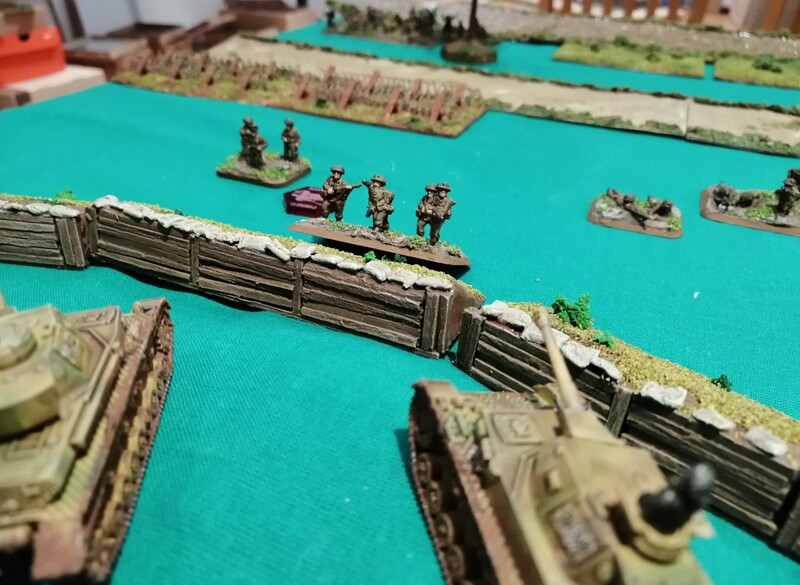 A roll of 6 at the start of any turn results in a Sherman Platoon deploying on the river banks where the bridge is constructed. 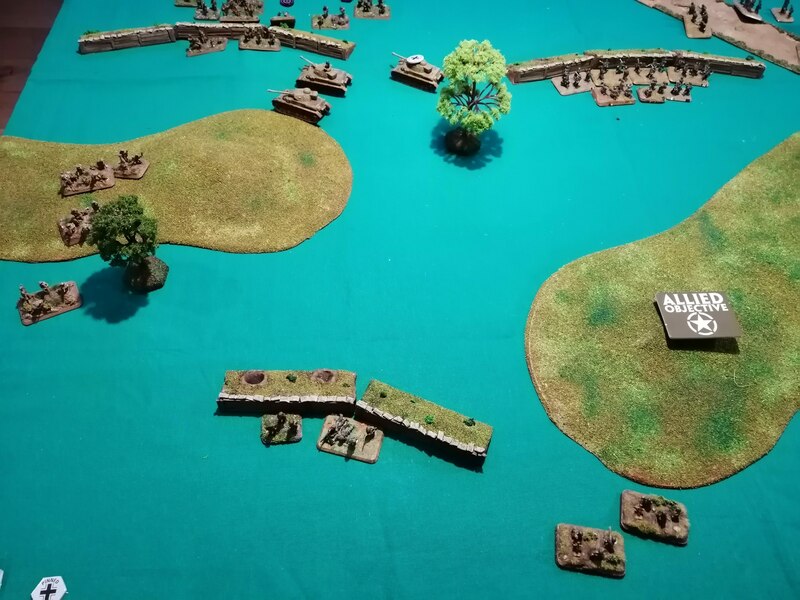 Victory Conditions: The US player receives 2VP for completing the Pontoon Bridge, 1VP for each German Trench occupied or overrun. 1VP every turn they hold one of two objectives. 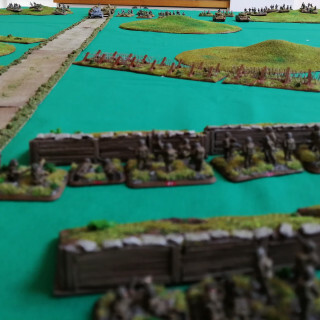 The Mortars deploy at the back of the board behind a trench line. 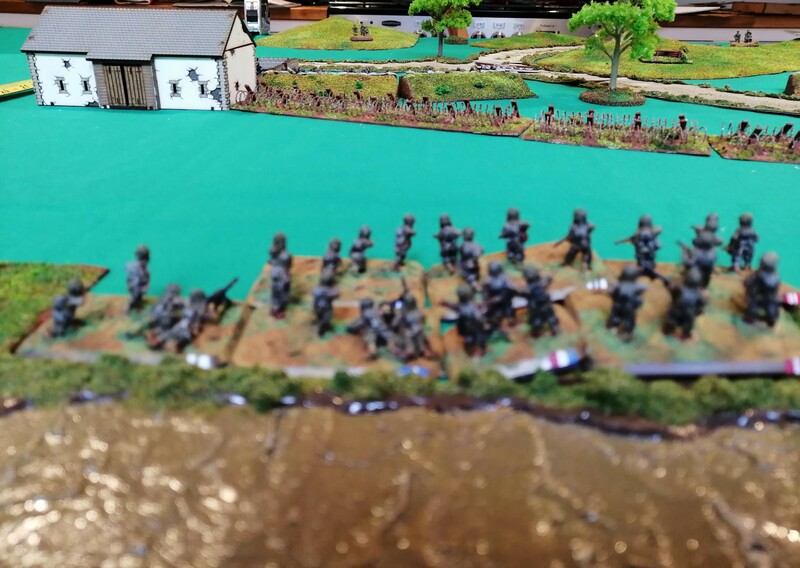 Red Platoon deploys into the barn and trench line beside. Key to the image: RP is Red Platoon, BP is Black Platoon and GP Green Platoon. white boxes 1 and 2 are the HMG nests. Box M is the mortar platoon. OP is the observer post for the mortars. 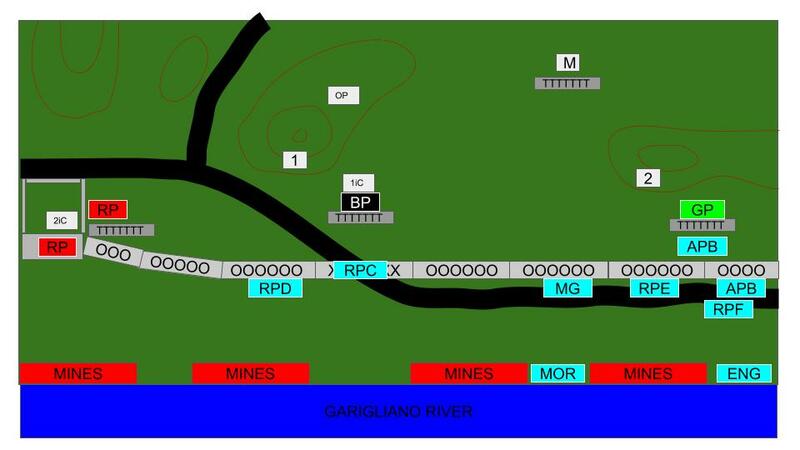 Weapons team roll a 6 and choose to position half way along the bank between two minefields. 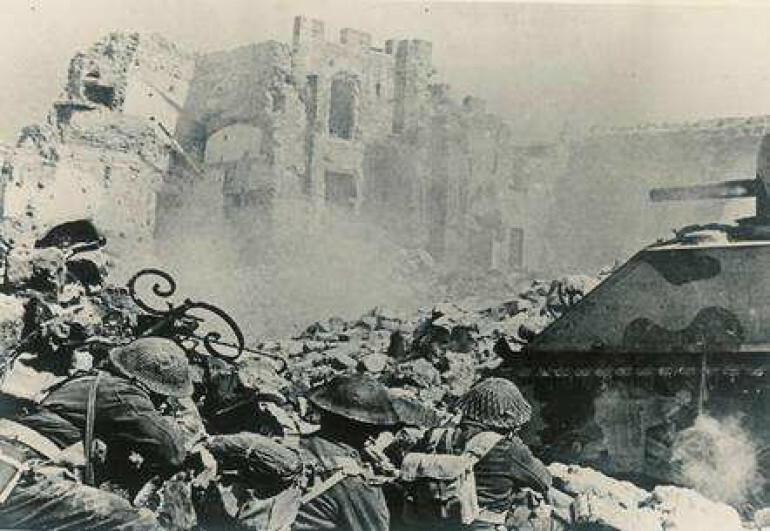 It was 75 years ago today, 17th January 1944, that Allied troops launched their assault on Monte Cassino. It was to be a bloody, brutal battle lasting four months. This project pays respect to those who fought there and the sacrifices made all those years ago. Field Marshal Albert Kesselring had been instructed by Hitler to build a defensive line South of Rome, later called the Gustav Line. The topography was well suited to defence with rugged hills and the Apennine Mountains running through the centre of the country. 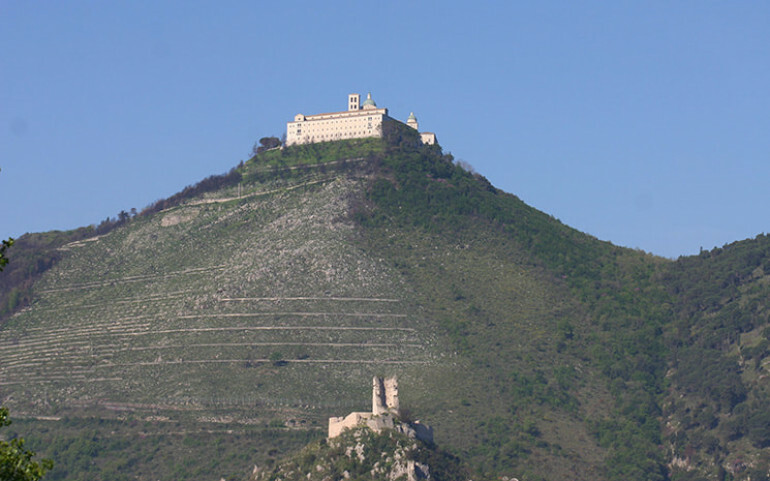 The Western part of the Gustav line was anchored around the 6th Century Benedictine monastery built atop Monte Cassino. From this high vantage point, the German defenders overlooked the Liri valley and Route 6, the primary route from Naples to Rome. The Allies had to take this stronghold before they could advance further. At the foot of the hill lay the small town of Cassino, which linked to a small road that snaked up the side of the hill to the summit. On the Western side of Cassino lay the railway station, again connecting to Rome in the North as well as to Naples to South. Just South of Cassino, flowing East to West was the Rapido river. This aptly named river often burst its banks with flood water maker the surrounding ground near impassable. Despite being only 10m wide, it offered a difficult obstacle and one that the German defenders had built into their defensive plans. Downstream, the Rapido became the Garigliano river which joined the Liri river South West of the town of Cassino. The German 14th Panzer Corps and had set about building a formidable defence. Much of the banks of the Liri and Rapido rivers had been mined while barbed wire entanglements lay in wait to slow advancing troops. Machine gun nests and bunkers covered these approaches. Buildings in the town had been converted into small fortresses while overlooking this, troops, machine guns and mortars lay dug in around the slopes of the hill. Despite the German defenders and the presence of Allied troops, the ancient monastery was still staffed with a few monks who had refused to leave despite advice to the contrary. The Germans had agreed with the Pope in Rome to not use religious buildings in their defence and so the monastery itself had not been fortified. 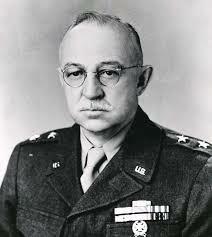 US 5th Army, commanded by Lieutenant-General Mark W Clark, was initially tasked with capturing Monte Cassino and breaking through the defensive line. 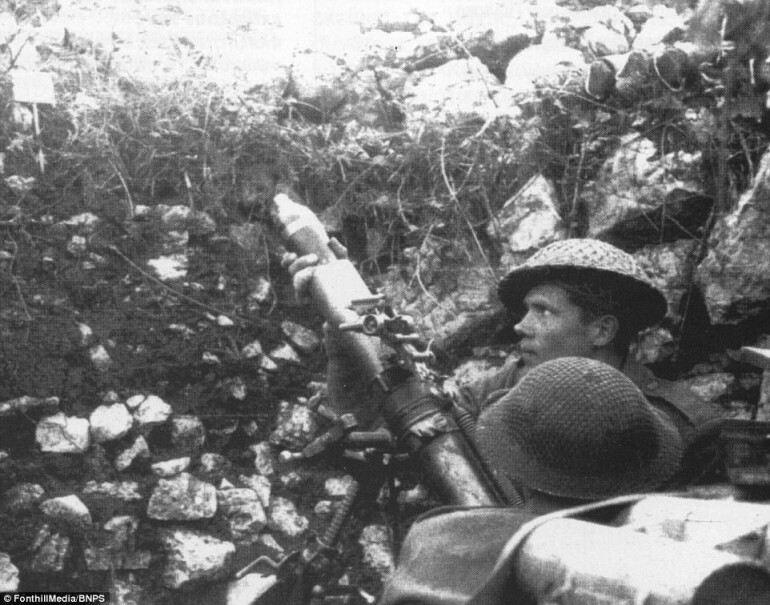 He drew up plans that required flank assaults followed up by a frontal assault on Monte Cassino. In conjunction with the Monte Cassino assaults, a beach landing further North at Anzio was planned. The idea being to either draw German reinforcements in Rome South to the Gustav Line, making the Anzio landings more likely to cut off the troops at Monte Cassino or, to force the reinforcements to react to the Anzio landings and make a break through at Cassino more likely. 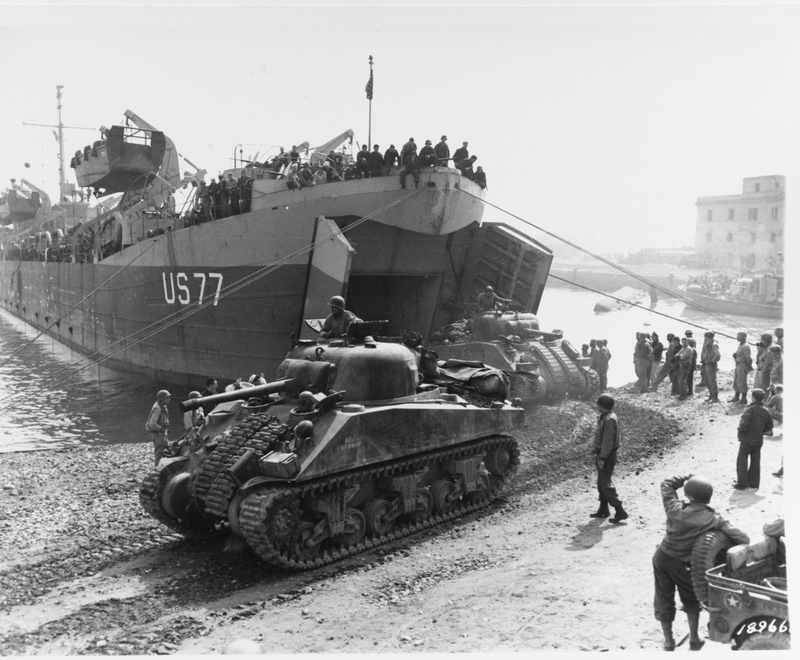 5th Army had only arrived at the Gustav Line on 15th January but were forced to move quickly as landing boats for Anzio were only made available until early February. After this time, the landing equipment was required back in the UK to prepare for Operation Overlord. 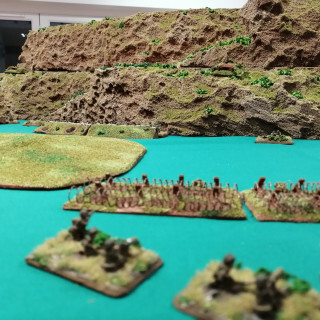 This rushed approach was not ideal; 5th Army had endured a particularly attritional advance up the West coast from Naples and had not had time to reorganise or rest. Optimism among the Allied forces was not high when the assault was launched. Britsh X Corps, positioned on the West flank of the 5th Army, close to the coast, launched the assault, with two divisions crossing the Garigliano on the 17th January, 1944. 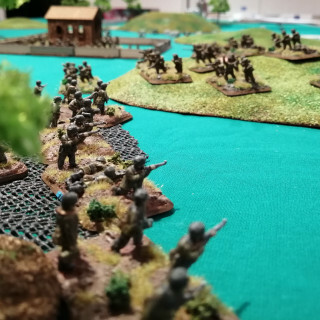 They quickly established a beach head on the Northern side of the river and were able to dig in despite heavy resistance from the German 94th Infantry Division. A further British Division successfully crossed two days later however the three British Divisions lacked the man power and support to push further inland. It did however cause the Germans to request reinforcements and 29th and 90th Panzer grenadier Divisions were sent from Rome to bolster the defences. By 21st January, the German reinforcements had stabilised the bridge head and the British made no further progress. British X Corps suffered around 4000 casualties in this opening assault. 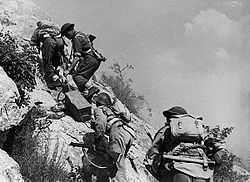 Further inland, to the East of Cassino, Moroccan and Algerian troops of the French Expeditionary Corps advanced into the mountains and engaged the German 5th Mountain Division. In atrocious weather and freezing conditions, the North Africans fought bravely and made good progress. However, a lack of men, support and supplies left many soldiers with frostbite and trench foot and coupled with the bitter fighting, the assault eventually ground to a halt on 31st January. With the flank assaults well under way, the main central assault started after sunset on 20th January. The 36th (Texan) Infantry Division sent elements of the 141st and 143rd Infantry Regiments across the Garigliano river just down steam of the town of Cassino. The 15th Panzer Grenadiers had prepared their defences well and the 36th suffered heavy casualties. 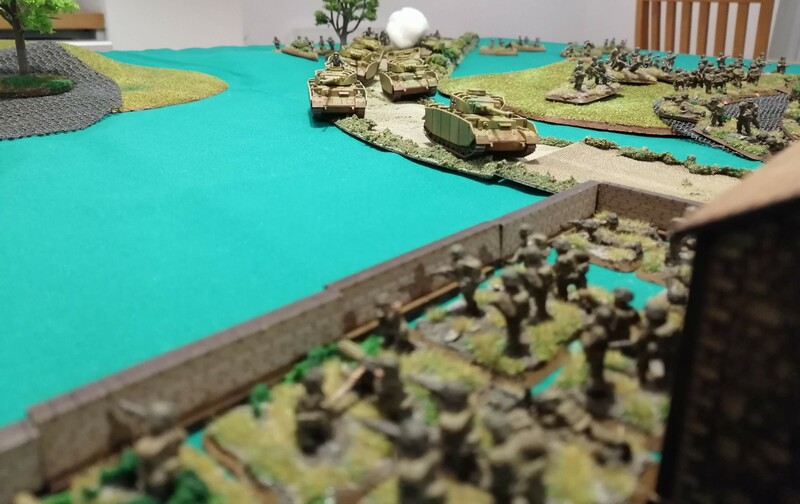 Supporting armour was trapped on the Southern side of the river unable to cross the thick mud caused by the flood waters. This left the Infantry exposed to counter attacking tanks and self propelled guns. The 143rd Infantry were forced back over the river by mid-morning on the 21st and the 141st were barely hanging on. The assault was renewed on the evening of 21st and both divisions managed to cross two Battalions with the 141st managing to advance almost a kilometre from the banks of the Garigliano. However, as sun came up on the 22nd, the 36th were left horrible exposed and were cut down by the German counter attacks. Barely 40 men of 141st made it back to the Allied side of the river. Major General Walker, commander of 36th Infantry Division decided not to commit his final Regiment to the attack but rather call off the assault. In just two days, the 36th had lost over 2000 men and had been reduced to a third of its fighting strength. One US Officer reported ‘I had 184 men… 48 hours later I had 17. If that’s not mass murder, I don’t know what is.’ The horrific losses became the focus of a Congressional Inquiry after the war. 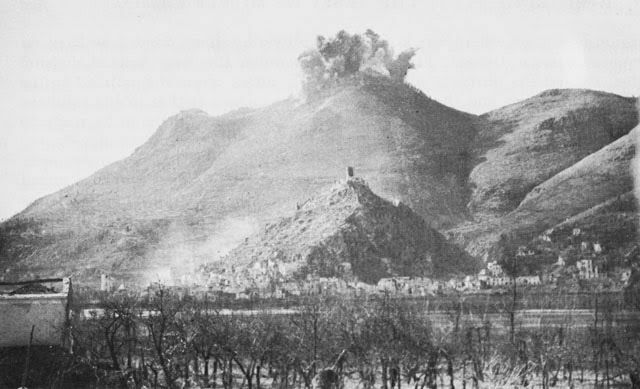 On 24th January, a little up river of Cassino, US 34th Infantry Division launched their assault. 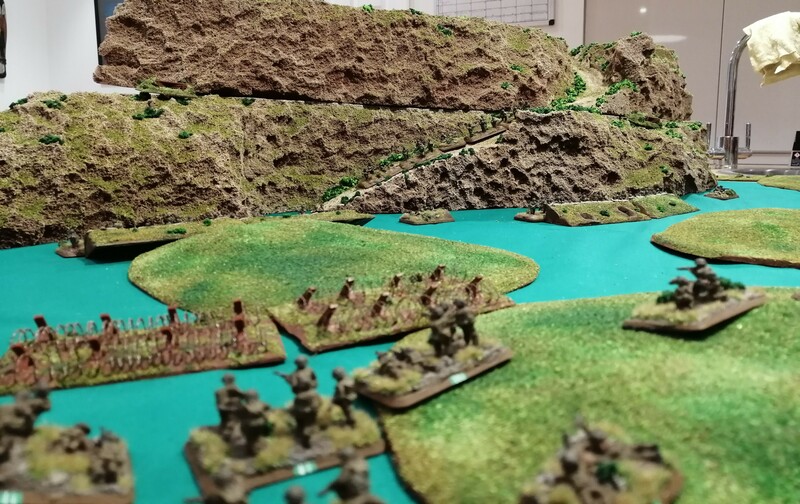 Like the 36th, they also found the defences on the other side of the river well prepared and suffered similarly but managed to make slow progress up the steep, broken hills. During the day, any movement among the rocks and broken buildings was raked by German machine gun fire and infantry men were left inching forward, feeling with their finger tips for trip wires and mines. The steep gullies offered little protection and the Germans had laced the thick bushes with mines, booby traps and barbed wire. 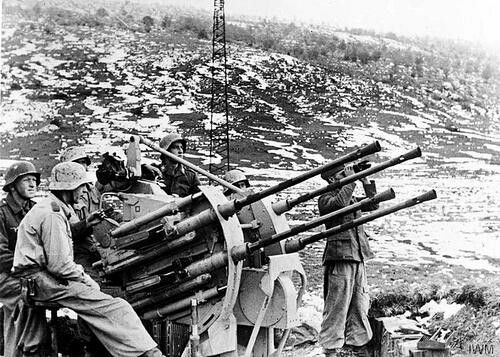 Despite the formidable defences and the freezing weather conditions, the 34th managed to continue to push forward along the hills, looping around the back of Monte Cassino. By early February, the 34th were just over 1km from the monastery and over the following few days got within 4oom. Monks inside the monastery observed a US patrol reach the walls of the monastery and exchange fire with the defending 1st Fallschirmjager. For a further three days the 34th tried to break through and take the final hill, known as Calvary Mount but without success. On 11th February, US troops were withdrawn, having fought to exhaustion. With Sicily in Allied hands and Mussolini removed, the Allies considered their plans for mainland Italy. With the Italian army all but removed from the fight, more aggressive plans could be considered, with the eventual plan calling for the British 8th Army to cross the Straits of Messina and land at the Southern tip of Italy. It was hoped that this initial landing would divert German forces into Calabria, away from the main landing point of Salerno, on the West coast south of Naples. Operation Baytown was launched on 3rd September 1943. Two Divisions from 8th Army crossed the Straits of Messina and landed almost unopposed on mainland Italy, with the Italian defenders surrendering almost immediately. 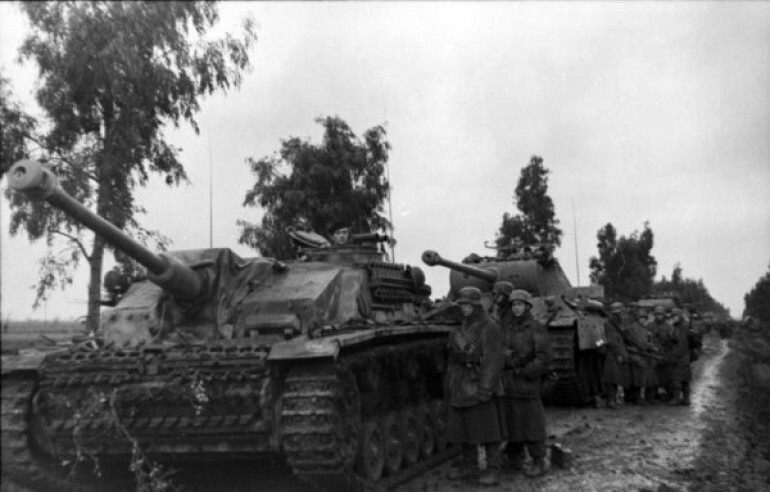 They advanced inland, meeting only minor opposition from 15th Panzer Grenadier Regt, who were ordered to delay the British to allow other German forces to withdraw. The Germans offered little opposition beyond destroyed bridges and other engineering obstacles. The 8th Army’s progress was slow as every obstacle had to be tackled as the surrounding terrain offered no options for bypassing them. It quickly became apparent that the Germans did not fall for the diversion tactic and made no move to intercept the British who now had over 450KM to cover to meet up with the planned US landings at Salerno. With the formal surrender of Italy announced on 8th September, German forces in the country disarmed local Italian units and took up their positions. The Italian navy sailed to Allied ports to surrender and what was left of Italian resistance was removed. A day later, on the 9th September, elements of the 8th Army landed unopposed at Taranto on the Southern coast of Italy. They found the port largely intact and were quickly able to disembark and begin advancing up the East coast, reaching Bari by 11th September. General Mark Clark’s US 5th Army started Operation Avalanche, the codename for the beach landings at Salerno, on 9th September. Comprising US VI Corps, British X Corps and 82nd Airborne Division in reserve, they were well supported by US and British naval power in the Mediterranean. The invasion covered a long stretch of coastline, approximately 56km which given the limited availability of troops, was ambitious. Furthermore, the coastline curved around, creating a large cove, resulting in any front being much longer that the beach. The Sele River also split the attackers, creating problems for linking up. The German defence had been reorganised into the newly formed Tenth Army, commanded by Heinrich von Vietinghoff and comprising 2 Corps with a total of 6 Divisions. Among these were the elite Herman Goring Panzer Division and 1st Fallschirmjager. Albert Kesselring still had overall command of Southern Italy. 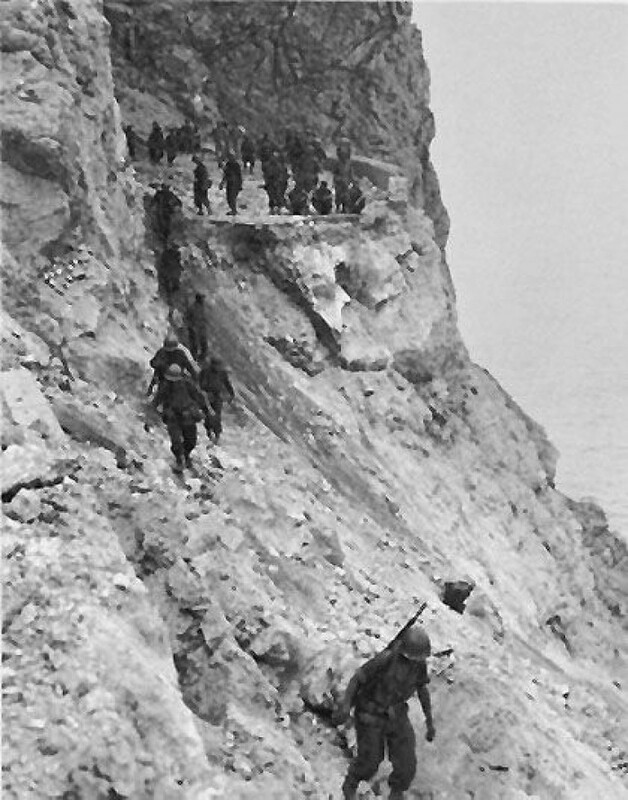 The Northern element of the Salerno landings were carried out by British X Corps. 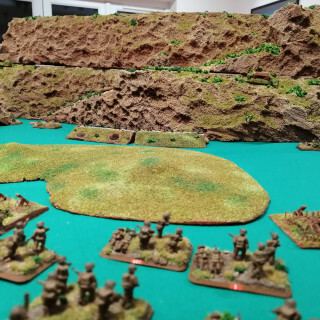 The US Rangers and Commando units landed largely unopposed and quickly pushed in land to secure the necessary roads and bridges North to Naples. 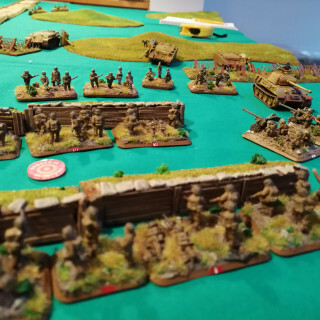 The rest of X Corps, 46th and 56th Infantry Divisions, who landed South of the Commandos and North of the Sele River met fierce resistance from the 16th Panzer Division and were only able to secure the beach head due to the support of the big naval guns offshore. To the South of the Sele River, 36th (Texas) Infantry Division struggled to gain a foothold. 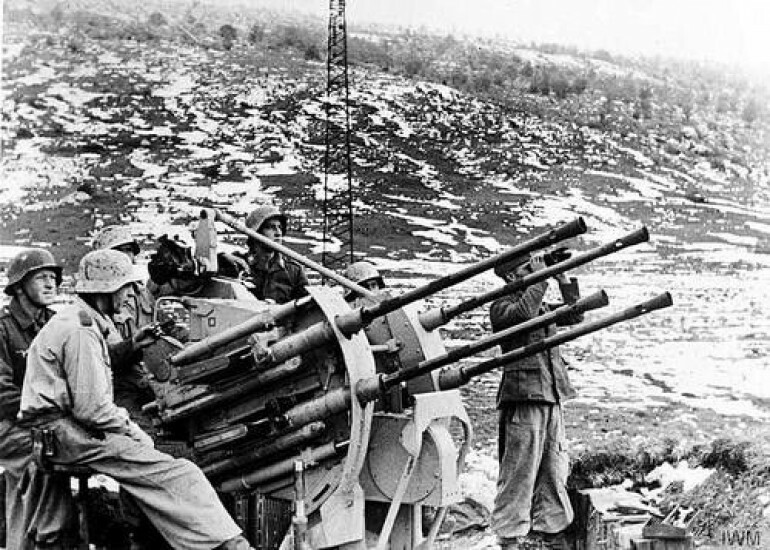 German observers from the hills overlooking the Salerno beaches were able to direct artillery fire onto the landing craft and beaches with some accuracy. Despite the incoming fire and the attention of the Luftwaffe, 142nd Infantry and 143rd Infantry Regiments of the 36th Division did manage to make progress in land. The 141st Regiment however were pinned down on the beach, making necessary additional supply landings impossible. 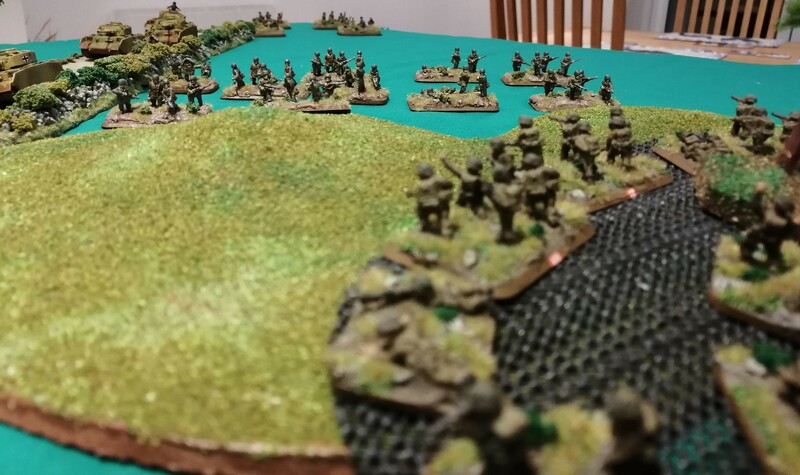 In response, the German defenders quickly moved their reinforcements into position to encircle the beach head. The Allies spent several days making slow gains inland and by 12th September, X Corps had advanced around 10km inland but were lacking men to continue to push and had started digging in. To the South, 36th Division had gained around 8km of ground however Allied troops were not landing quickly enough and with the build up in German reinforcements, a counter attack was expected at any time. The German counter attack started on 13th September. The main attack came roughly where the two Allied Corps met and two German battle groups engaged the US 36th Infantry Divsion and pushed them back. 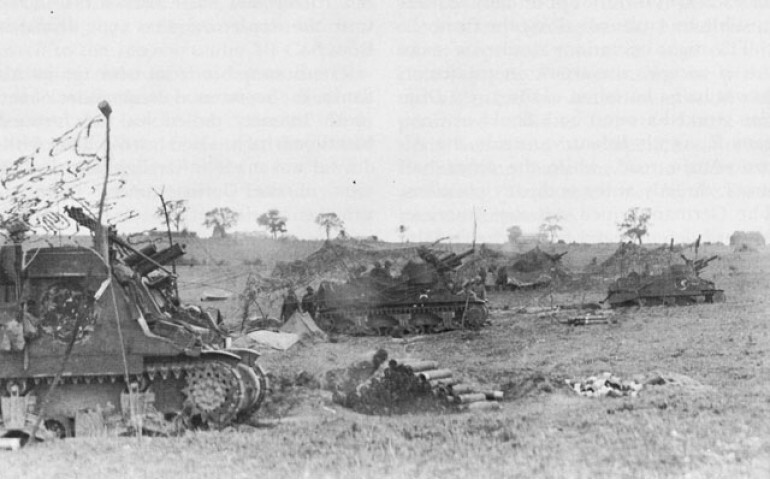 The battle groups continued to drive South West, pushing deep into Allied territory. It was eventually halted although only by naval gunfire and artillery firing over open sights. The counter attack had pushed far enough into Allied territory to make evacuation a consideration but rather than take such drastic action, the US VI Corps decided to enact a partial withdrawal to reduce the front that they had to defend. The Germans continued their counter offensive on the 14th September, attacking along most of the Allied beach head. During the day, naval gunfire and artillery pounded the Germans while every available Allied aircraft was airborne straffing and bombing. The German losses, particularly in tanks, was high and they failed to achieve any significant break through. Allied air attacks continued on the 15th September and began to force the Germans back on to the defensive. The continued pounding from the naval fleet was taking its toll and further attempts by the Germans to counter attack failed. Meanwhile, the British 8th Army was continuing its slow advance up Italy. By 16th September, advanced patrols from the 8th Army made contact with the Southern most elements of the 36th Infantry Division. Relief was at hand for the Allied troops at Salerno. The arrival of 8th Army, coupled with the relentless naval and air bombardment caused the German Tenth army to request a withdrawal to which Kesselring agreed. German troops began withdrawing North on 18th September. With the Salerno beach landings now secure, US 5th Army turned North toward Naples. British X Corps was tasked with taking the city and armoured cars from 1st Kings Dragoon Guards entered the city on 1st October. 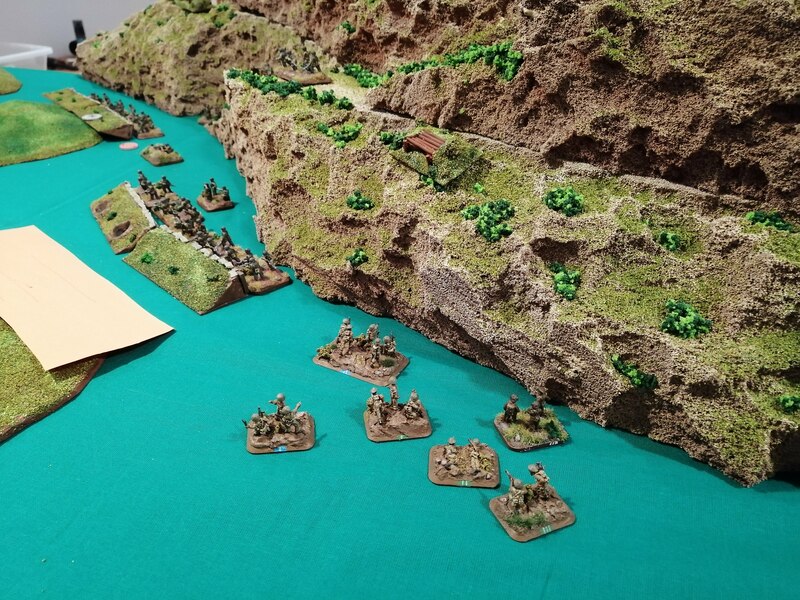 US 5th Army reached the Volturno River on the 6th October. Meanwhile, the British 8th Army had turned East and crossed the Apennine Mountains and were busy pushing up the East coast. US 5th Army crossed the Volturno river on the night of 12 October and engaged the defending German forces. 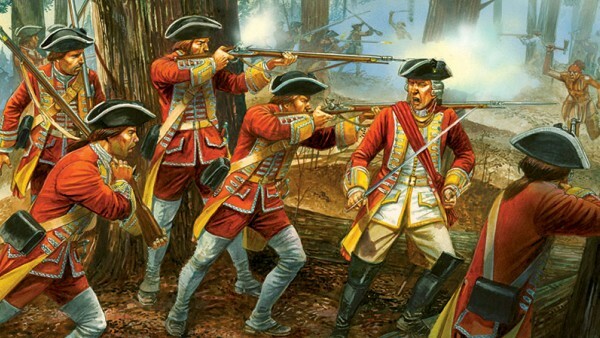 The defenders had not had long to prepare their defences and engaged in a fighting withdrawal while the Americans advanced. German forces gradually fell back to a much better prepared defensive line – the Bernhardt line – further North. 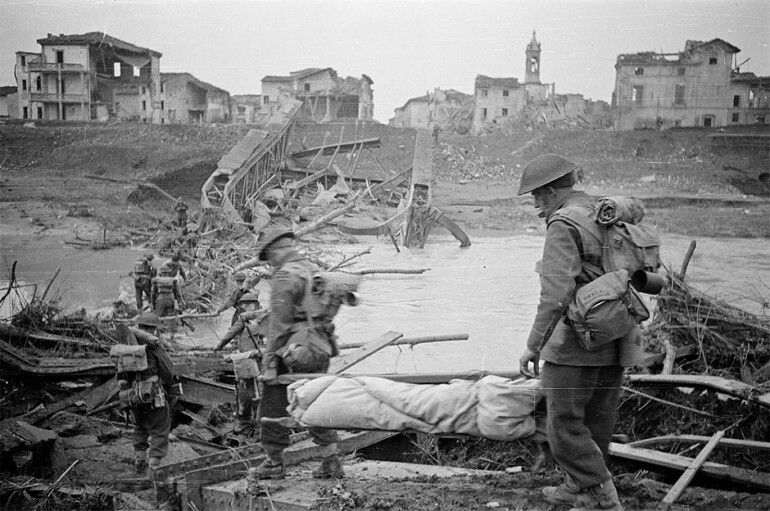 On the East coast, the British 8th army crossed Biferno river on 3rd October and began their assault on the defensive positions. 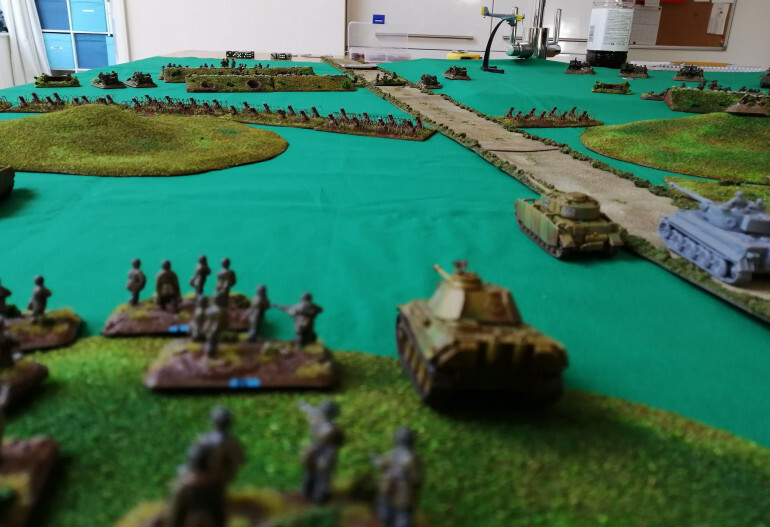 This progressed well until the redeployed 16th Panzer Division arrived on the 4th October and launched a counter offensive. 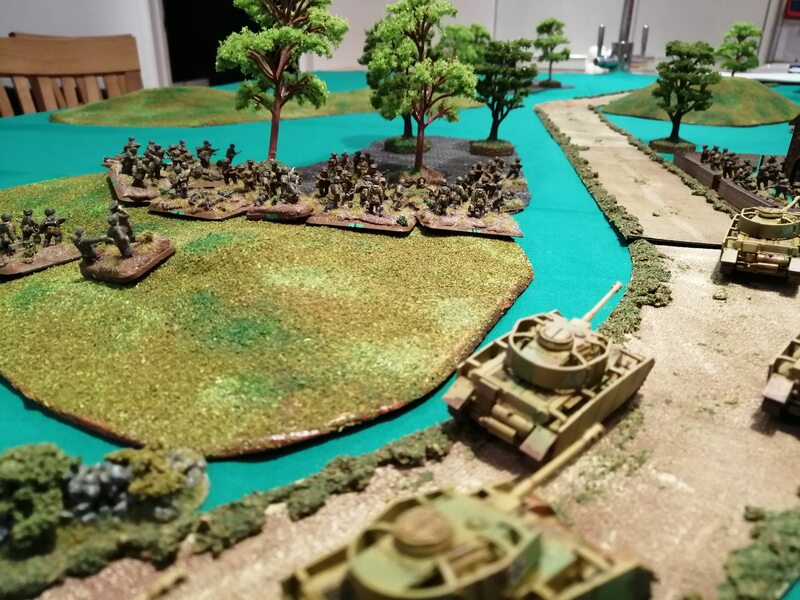 8th Army struggled to support the Infantry North of the river due to a lack of bridging equipment and heavy rains having washed away make shift fords. 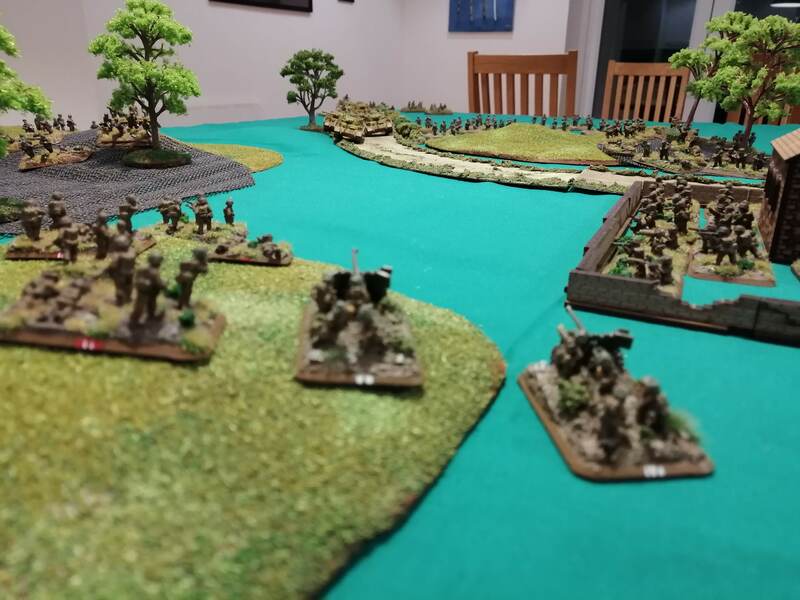 By 5th October, British infantry had been pushed back and were taking heavy losses but efforts by the engineers to put in place a bridge were successful and Canadian and British armour raced the infantry’s support. They were eventually able to push the Germans back who eventually began to withdraw to North of the River Trigno. The British 8th Army were now strung out along the East coast with well over 100km separating their front forces to their rear. Poor weather, destroyed bridges and damaged roads had caused numerous delays and supplies were struggling to reach the front effectively. 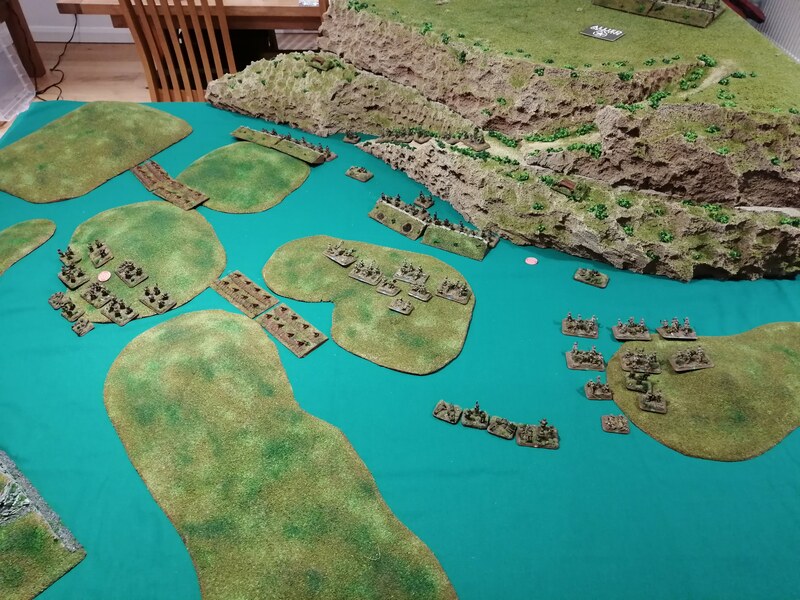 Upon reaching the River Trigno, Montgomery decided to halt and reorganise to facilitate a better assault. It wasn’t until 2nd November that the 8th Army were ready to launch their attack when the 78th Infantry Division along the coast and 8th Indian Division inland crossed the river. Fighting was fierce but by the end of the day, German forces withdrew to the Gustav line. 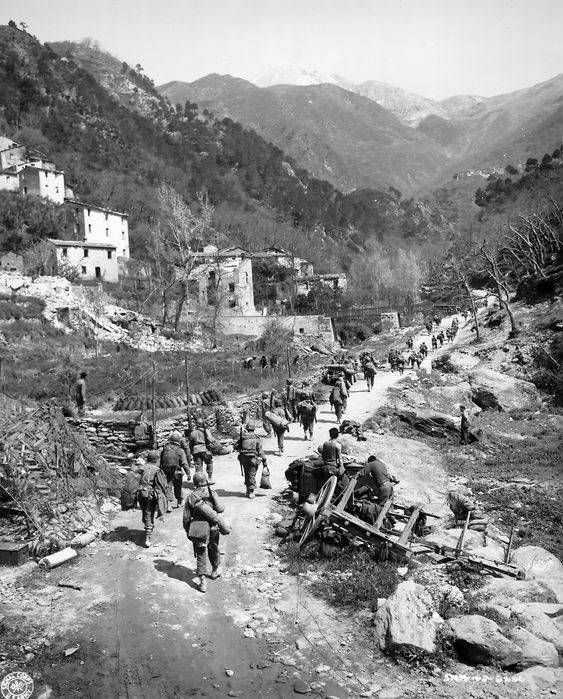 Back on the West coast, the US 5th Army had been advancing up Route 6 and encountered the German defenders on the Bernhardt Line, a 10km deep defensive line, which ran through the town of San Pietro Infine. The town blocked the Mignano Gap and the only effective route North. It had taken the US 5th Army 5 weeks of heavy fighting to advance to San Pietro Infine and loses had been high. 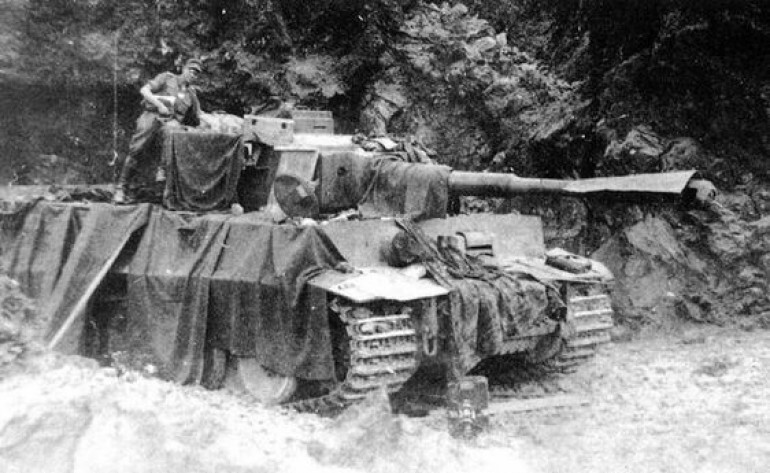 German 15th Panzer Grenadier Division, on the surrounding hills, commanded an excellent view of the Allied advance and had to be removed before a more direct assault on San Pietro infine itself could take place. For a week, the 143rd Infantry Regiment of 36th Division attacked and were counter attacked before they could hold the Western hill. 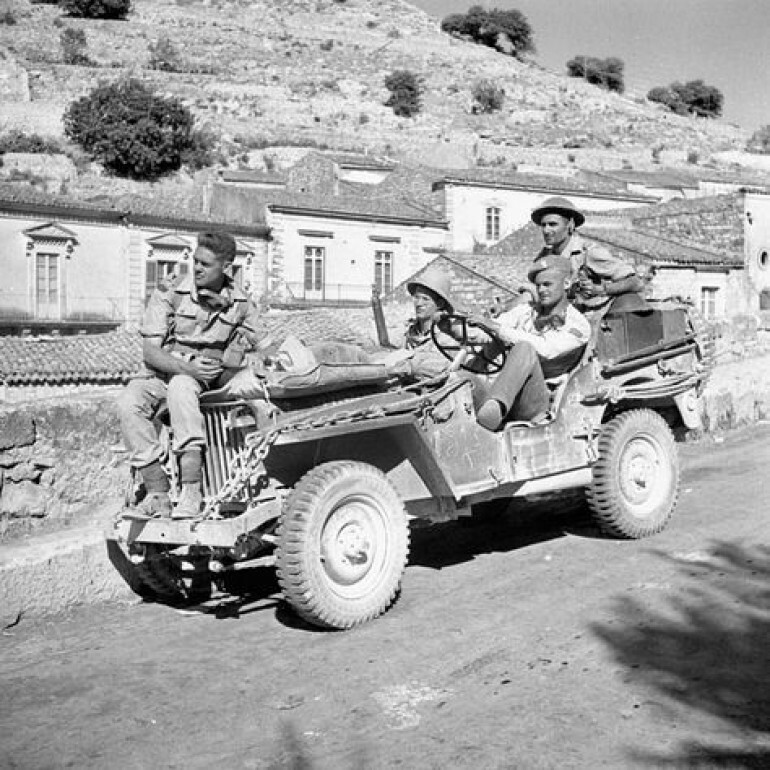 On the other side, 142nd Infantry Regiment, supported by 1st Italian Motorised Group, took Mount Lungo. With both sides of Route 6 now in US 5th Army hands, 141st Infantry Regiment could now assault the town itself. 16 Shermans were also sent forward however only 4 survived due to the mines and anti tank fire. After several assaults, the town was finally taken on 16th December and the Germans withdrew to the Gustav line further North. The US 5th Army had taken 16,000 casualties in the 6 weeks it took to break through the Bernhardt Line but could now advance on Monte Cassino and the formidable Gustav Line. In the last week of July, Allied troops took a few days to reorganise and consolidate before pushing forward toward the Etna Line. This defensive line around the South Western side of Mt Etna ran from the North coast to Catania on the East Coast. Montgomery launched the British attack on 1st August 1943 and targeted the town of Adrano, half way along the line to try to split the German defenders. Troops from the British 78th Division and Canadian 3rd Brigade moved forward on the night of the 1st August, aiming to capture a hill overlooking Adrano. They found the position defended by the Hermann Goring Division and supported by Fallschirmjager, who were well prepared and dug in. Heavy fighting continued throughout the 2nd August as the Allied troops made gradual progress up the hill while also moving into the town of Adrano. By the morning of the 3rd August, Adrano was cleared of German defenders and the Allies had split the German defensive line. To the North, Patton was advancing two separate divisions Eastward, the 45th along the coast while 1st took an inland road. On the 31st July, 1st Division encountered the 15th Panzer Grenadier Division dug in around the town of Troina. Like the British at Adrano, the decisive action was the capture of a hill overlooking the town on 7th August. From the lofty vantage point, US forces could accurately direct artillery on the defenders. This, coupled with the British break through on the German left flank, caused the defenders to gradually withdraw to a new defensive line set up further Eastward. The fall of Adrano allowed the British 8th Army to continue their push Northwards. Over successive days, they continued to move forward capturing towns while the Germans fought a withdrawal back to the North Eastern port town of Messina. Kesselring had already realised that evacuation to the mainland was the most likely outcome and had already started a planned withdrawal. 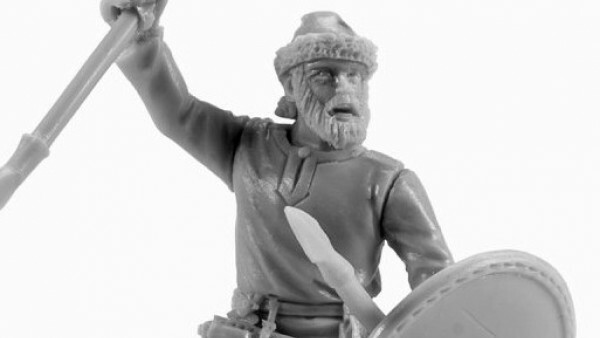 Along the Northern coast, the Americans had a tougher time advancing. The Germans had demolished many of the bridges and coastal road making progress slow. 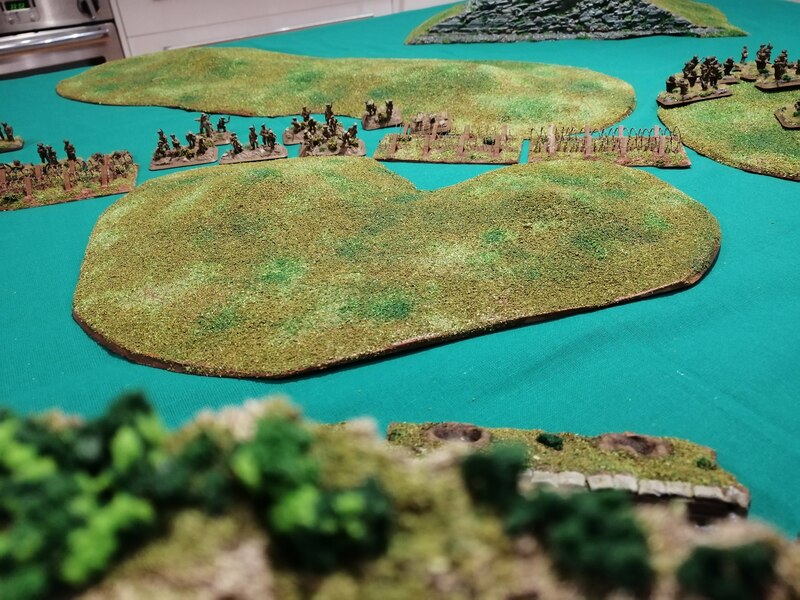 The excellent defensive terrain allowed the defenders to harry the Americans at every opportunity. 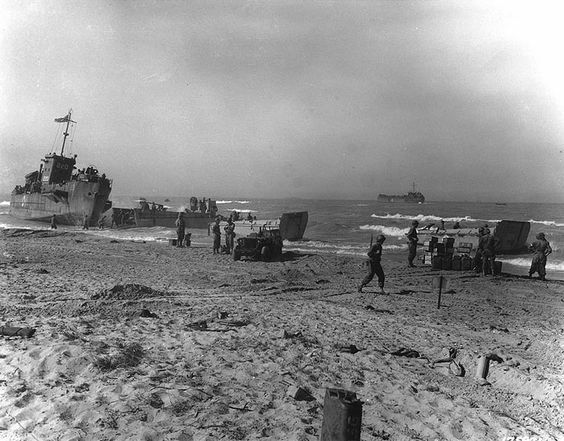 On several occasions, Patton had to order amphibious landings further along the coast to bypass and surround defensive pockets. Despite the difficulties, the US army entered Messina on 16th August. The defenders started to withdraw from Sicily on the night of 11th August with the full withdrawal lasting until the 17th August. Despite Allied attacks, the Germans were almost completely successful in withdrawing back to the mainland. By the morning of 18th August, Sicily was completely in Allied hands. The campaign came at some cost, the US army lost in excess of 8,700 men and almost 1,000 naval personnel. The British 8th Army suffered over 11,800 casualties and a further 300 naval personnel. Meanwhile, the German losses were estimated at between 20,000 and 28,000. The Italian army suffered significantly, with estimates put at 4,500 killed, 36,000 missing and 32,000 wounded. Over 100,000 Italians had been taken POW. Operation Husky was launched on the evening of 9th July. 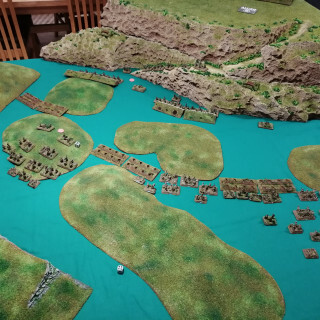 The weather had deteriorated during the day with a strong wind blowing up from the West/South West and consideration was made to postpone the assault. With the naval fleet moving into position, the risk of discovery was deemed to high and so the green light was given. The assault called for airborne troops to land over night and capture key bridges and locations. Airborne assaults by US 504th and 505th Parachute Infantry Regiments were blown widely off course, landing scattered across a wide area of South Eastern Sicily. It took several days for these troops to meet up and become effective although many, acting independently, harassed the defenders and their supply lines wherever possible. 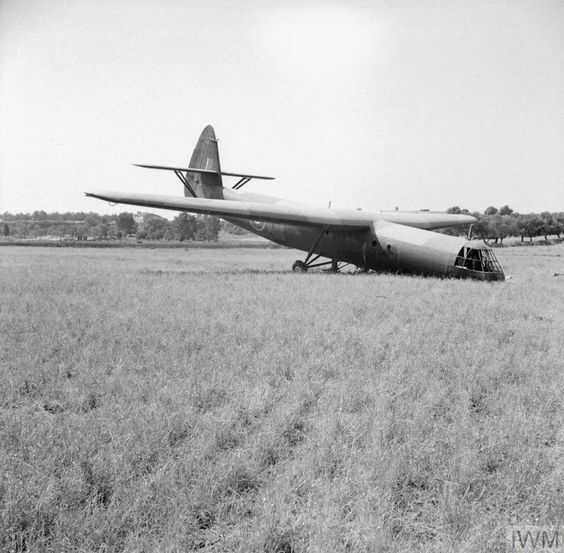 British air landings suffered similarly, with only 12 of the nearly 150 gliders landing on target. 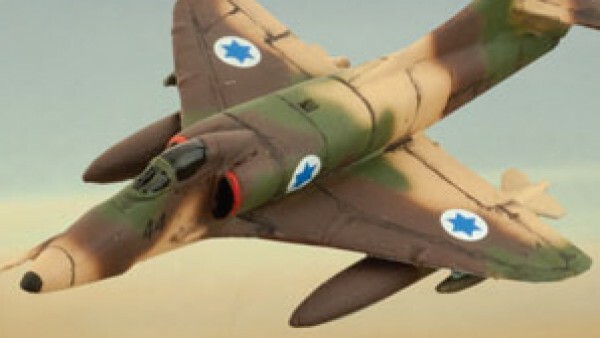 Of the remainder, 69 gliders crashed into the sea with the loss of nearly 200 men. 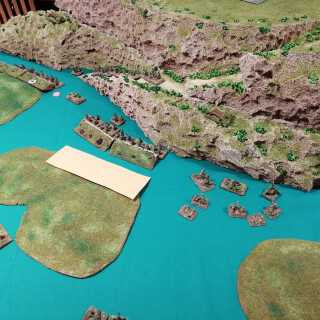 British objectives included capturing the Ponte Grande, a bridge over the river Anape into Syracuse. 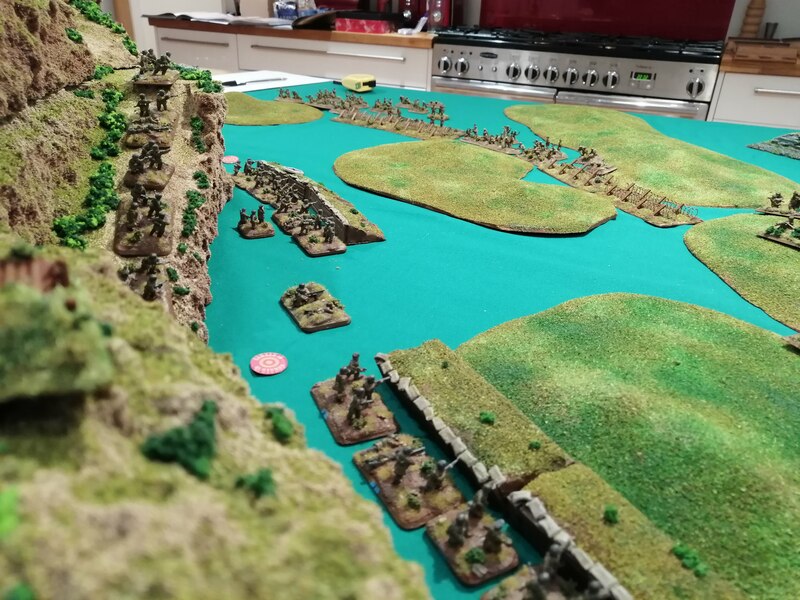 Holding this bridge would be key to taking Syracuse and opening the port to Allied naval forces while denying the Axis an escape route to the mainland. The beach landings started in the early hours of the 10th July. These were tough given the rough sea conditions but were largely uncontested. 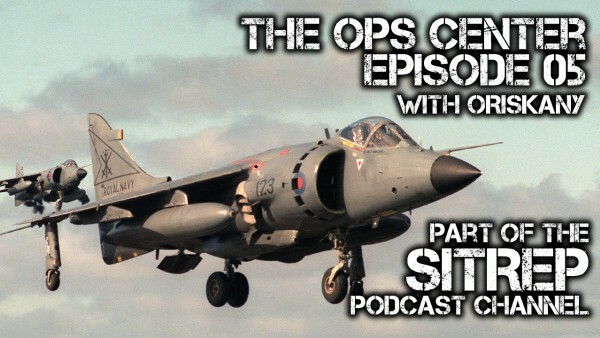 This was primarily due to the defenders believing that conditions were too bad for a beach landing to be attempted and consequently being caught by surprise. 26 beaches were used along a 105km length of coastline. US landings were tougher given the wind direction whereas the British were landing on the more sheltered East coast. The conditions put the operation significantly behind schedule but the lack of a cohesive defensive force allowed for much of this to be made up during the daylight hours on the 10th. During the day on the 10th, US 1st Infantry Division were engaged by the defenders around Gela. 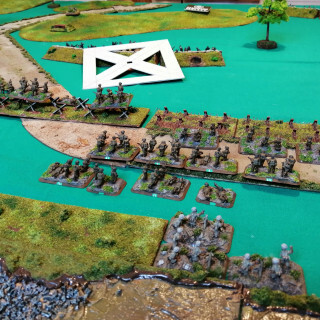 They had been expecting to find elements of the 504th Airborne but ended up repulsing an attack from the Italian 4th Infantry Division Livorno. 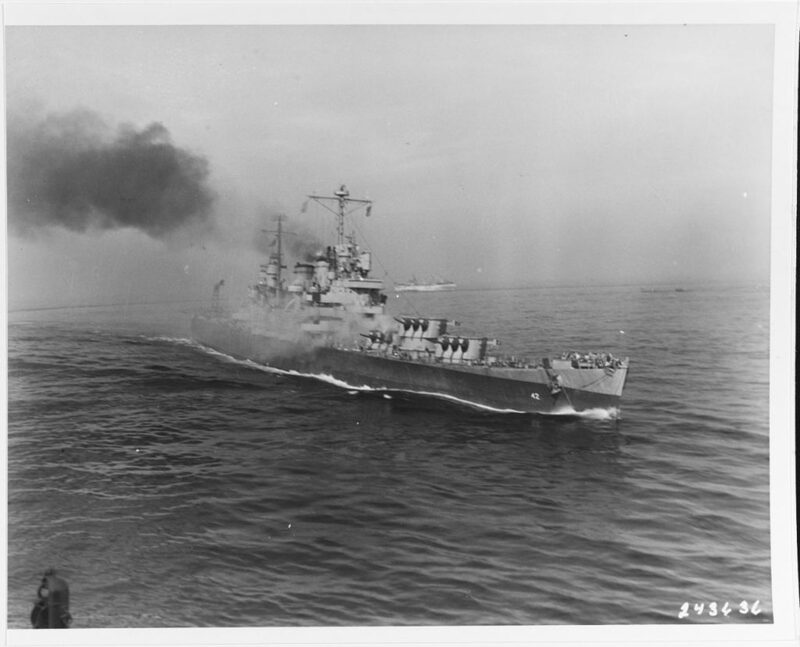 The US defence was aided significantly by the big guns aboard the US naval fleet who were able to bombard the Italians, destroying several tanks and scattering the infantry. 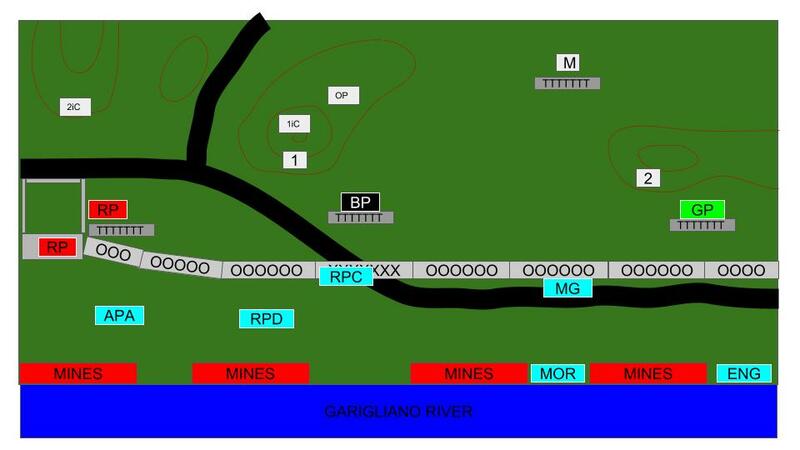 In the British section, 5th Division was tasked with pushing North to meet up with the airborne troops holding Ponte Grande. They arrived 45 minutes after the surrender of the 1st Airborne who had been reduced to just 17 by the Italian 75th Infantry Regiment. 5th Division quickly retook the bridge and by the end of the day had captured Syracuse, opening the port to the British Naval fleet. Over the coming days, Allied troops continued to advance with ports and airfields being key objectives. The already captured ports were quickly cleared and opened for further troop deployments. The Axis launched a number of counter attacks and, despite coming close on a number of occasions, failed to decisively break through. By 13th July, the British 8th Army had advanced further up the Eastern coast and captured the port town of Augusta. 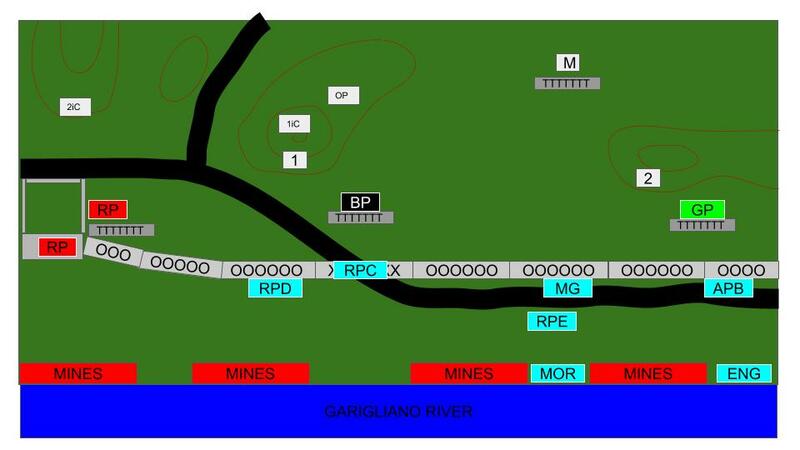 In land, Canadian forces had pushed forward to Ragusa, capturing around 500 Italian defenders and linking up with the US Right flank. The US left flank had taken the port town of Licata and were making rapid progress along the Sicilian coast line. Albert Kesselring, in command of the German forces in Southern Europe, came to the conclusion that German forces on the island were fighting without much support from their Italian allies and ordered reinforcements to be sent. He also ordered that the Western side of Sicily should be abandoned and a shorter defensive line put in place running from Catino on the East coast to Santo Stefano on the Northern coast. This defensive line would take in the hills around Mt Etna. Kesselring’s reinforcements, 1st Fallschirmjager and 29th PanzerGrenadier Division, began arriving later in July. 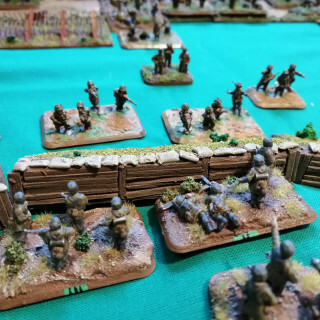 They took up positions along the designated defensive line while the remaining Axis forces carried out a fighting withdrawal back to the line. 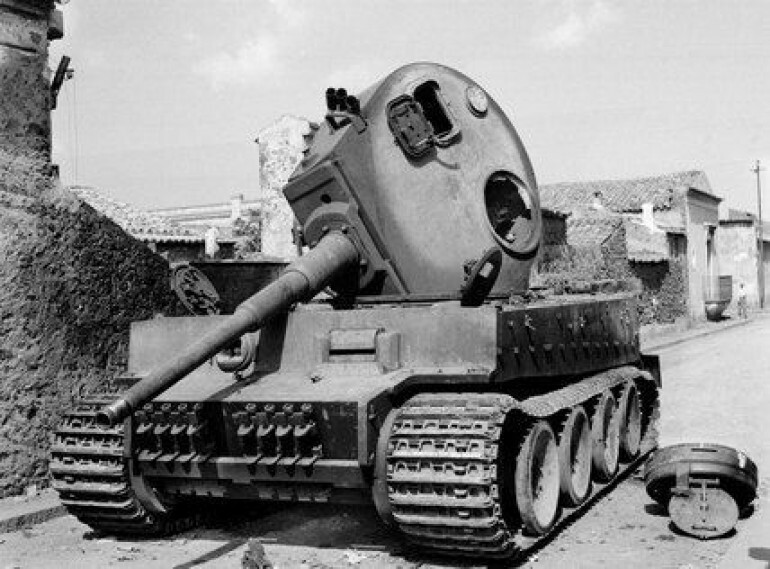 The Axis decision to abandon the Western side of Sicily allowed the US forces to advance quickly and by 24th July, the North Western most port town of Trapani had been taken. 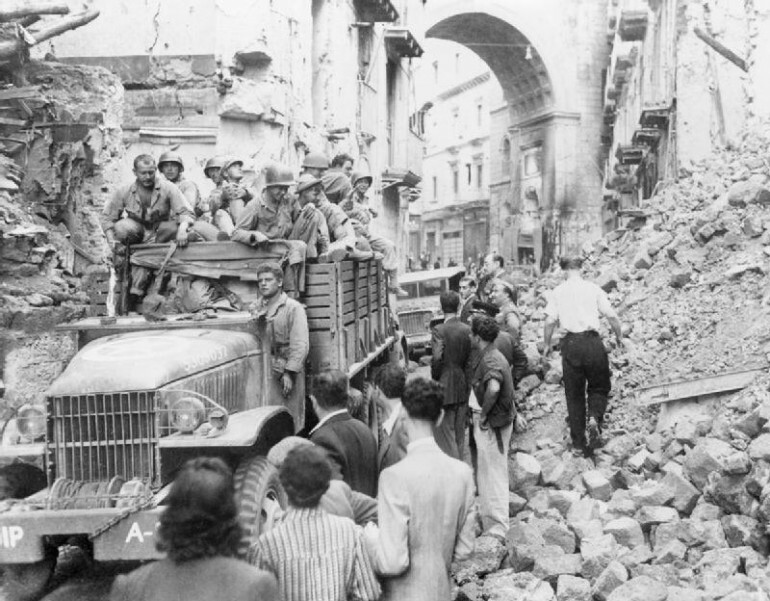 Two days earlier, US troops had entered Palermo on the Northern coast. Within less than two weeks, the Allies had the Axis pinned into the North Eastern corner of Sicily. Even as the Allies advanced on the Axis troops dug in on the Etna Line, in Rome, political wheels were grinding. The Italian Grand Council met on the evening of 24th July with Dino Grandi, the Count of Mordano, presenting a document outlining his concerns with Mussolini’s rule. Mussolini presented the current war situation and how the Italian army would resist the Allied advance. A number of those present were doubtful of the claims, particularly given how quickly the Allies had advanced across Sicily and that Rome was now being bombed by Allied aircraft. In the early hours of 25th July, the Council voted on the document and it was carried. It was presented to the Italian king later and Mussolini was summoned to a meeting with the king at 17:00. Mussolini expected to outline his next actions to unify the political factions but the king interrupted him and stated that the country needed him to quit. Mussolini left the meeting in a pre-prepared ambulance accompanied by police. Marshal Badoglio was appointed replacement to Mussolini and the announcement to the Italian citizens was made almost immediately. Italians took to the streets celebrating the end of Fascist rule although martial law was implemented the following day. The Government took little action over the following weeks and Italian troops were left without orders, continuing to fight alongside their German allies but without much conviction. This effectively removed the Italian army as a reliable ally for the Germans until Italy formally surrendered on 3rd September 1943. The German response to the fall of Mussolini was to begin redeploying troops into Italy to protect their southern front and bolster the defences there. The first divisions began moving on 26th July and in a two week period, 8 German Divisions had entered Italy without Italian consent. Italy was now effectively an occupied country. The planning for an invasion of Italy started several months before the final defeat of the Axis in North Africa. 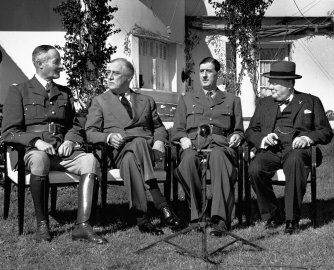 During the Casablanca Conference in January 1943, British military chiefs pushed for an invasion of either Sicily or Sardinia. Indeed, Churchill himself was very supportive of the plan, famously calling Italy the ‘soft under belly of Europe’. Part of the British insistence came from wanting to protect the Southern Mediterranean and keep shipping lanes open, especially to British colonies in East Africa, India, Burma and Australia. Loss of the Med would mean extensive detours via the Cape of Africa. Furthermore, within the Med, and less than 100km from Sicily, lay the strategically important island of Malta. Malta had been under siege for most of the war and subject to constant air bombardment from Italian and German bombers based on Sicily. Holding Malta was key to maintaining Southern Mediterranean shipping lanes. US Chiefs of Staff initially dismissed the invasion proposals as irrelevant and a diversion however were later persuaded otherwise, based primarily on the argument of maintaining safe shipping lanes. Allied commanders and politicians were also grimly aware of the situation in Russia and the invasion of Sicily would open a new front. This would have the effect of diverting German troops from the Russian front and alleviating some of the pressure on the Russians while also demonstrating to the Russians that they were capable and able to take on Germany on mainland Europe. General Eisenhower was appointed Chief of Command and General Alexander was appointed Deputy CoC. Admiral Cunningham took command of the naval fleet while Air Chief Marshal Tedder was appointed Air Commander. There was much discussion around suitable landing sites and strategic planning with several options rejected. Montgomery’s proposal was finally agreed on calling for a two pronged attack with the US 7th Army, commanded by Patton, landing between Licata and Scoglitti on the Southern Sicilian coast. The British 8th Army were to land between Pachino and Syracuse on the Eastern coast. The plan was code named Operation Husky. Allied commanders were concerned with the airfields in Sicily allowing the Axis’ air force to launch counter strikes against the troops as well as the supporting naval fleet. Prior to the invasion, Allied bombers relentlessly attacked the airfields and by the start of the invasion, all but two were rendered inoperable. 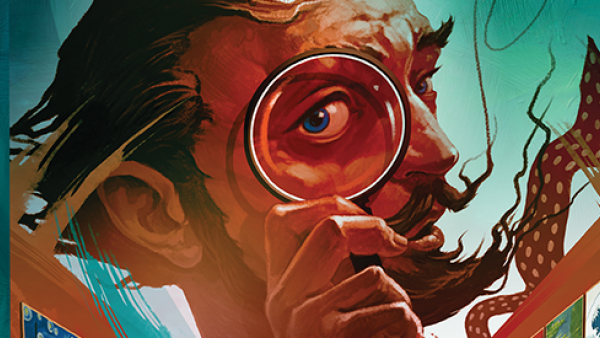 To further confuse matters, the Allies set about ‘Operation Mincemeat’ that arranged for a corpse, dressed as a British Royal Marine officer and carrying a briefcase, to wash up on the shores of Spain. Inside the briefcase were detailed top secret plans for Operation Brimstone, the proposed Allied invasion of Greece. German high command accepted the papers as valid and diverted some troops to defend Greece rather than Sicily. The Italian 6th army, commanded by General Alfredo Guzzoni, was tasked with the defence of Sicily and numbered around 200,000 men. About half this number were support staff and inferior coastal defence forces who were placed as a screen in front of the more experienced and better equipped field units. The general plan being for the field units to intervene when and where the coastal defence units required support. Attached to the Italian 6th Army were around 32,000 German troops and 30,000 Luftwaffe ground support teams. The majority of these troops were part of the Herman Goring Panzer Division and the 15th PanzerGrenadier Division. In total, these two divisions could field around 150 tanks to support the infantry. 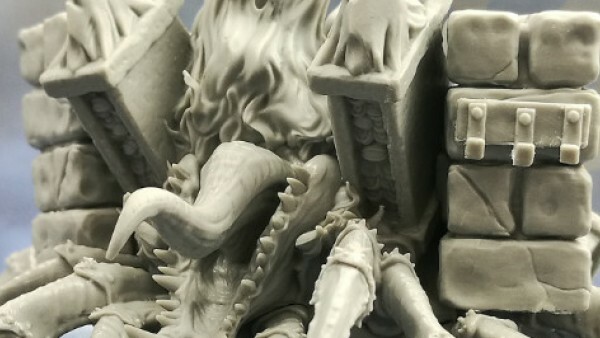 I spent a large part of my 2018 hobby building up to this project. You can see the progress of this with the two sister projects I created. 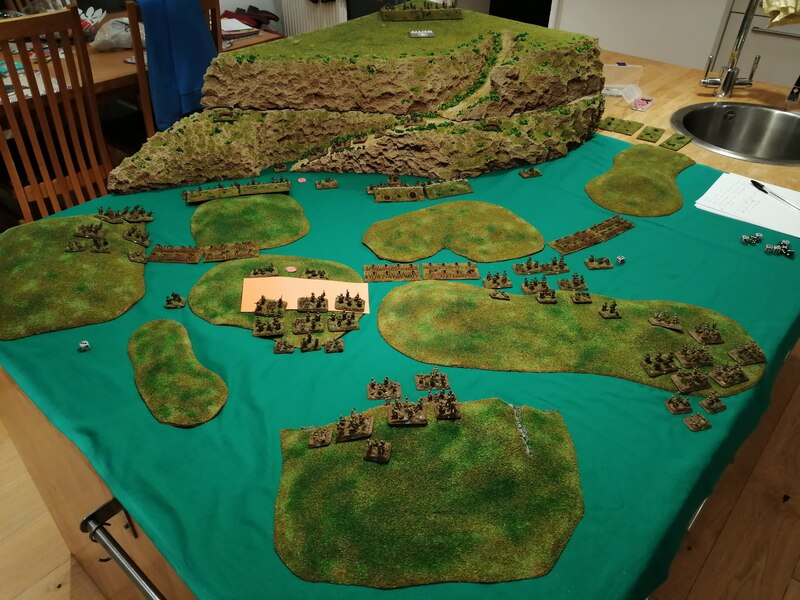 In those, I painted the necessary armies and terrain for playing out these battles. These projects are not yet complete and will continue to run in parallel with this one. So why the Italian campaign? Partly it’s because it is a little (not much) off the beaten track of WW2 gaming and understanding. 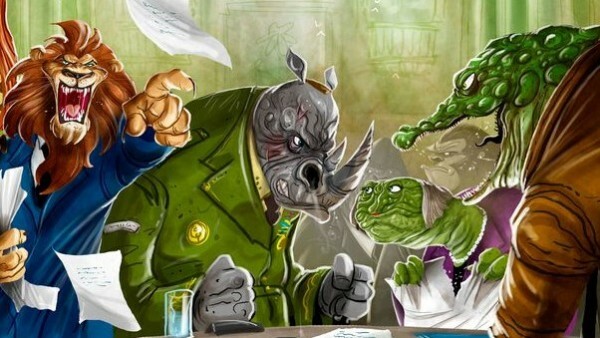 Partly it’s due to the hard fought battles and heroic actions on all sides that took place there. Partly the setting and my fondness for Italy. There’s also the fact that the local Royal Sussex Regiment fought there alongside a huge number of nationalities – indeed, if there is one theatre of operation in WW2 that was truly global, Italy must be it. French, Algerian, Canadian, US, British, Polish, New Zealand, Italian, Indian, German, Nepalese, Moroccan and Brazilian soldiers all fought on the Italian mainland, many at Cassino. 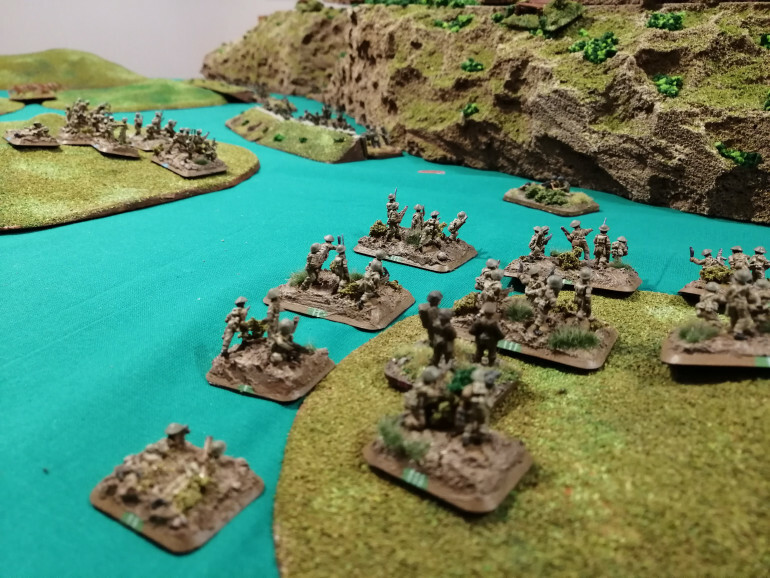 So it is hard to explain exactly why, but the Italian campaign sparked my interest and led me down the historical wargaming road – a road that I had not trodden before…. Before I start this project in earnest, I will point out that I’m not an amateur historian, more of an ‘interested bystander’. 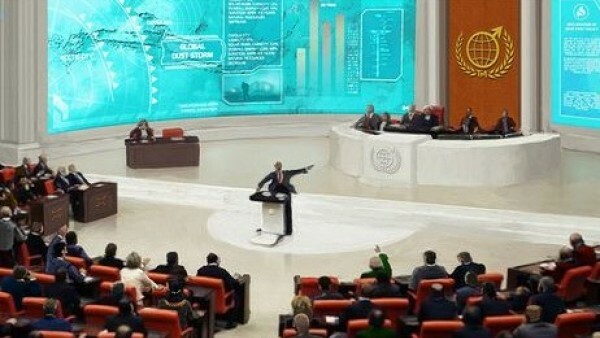 With this in mind, I expect that there will be many errors and inaccuracies. I also expect that there will be some grossly incorrect assumptions. For all of these, I apologise in advance and hope that the errors will be pointed out in the comments.